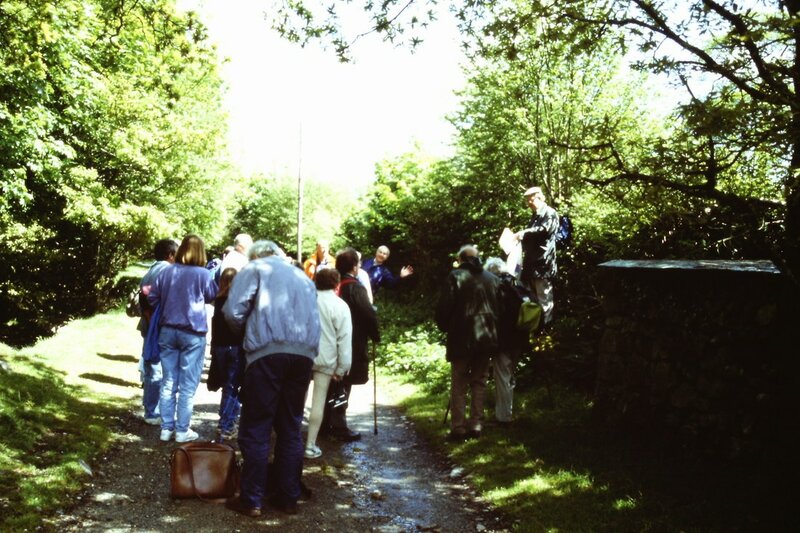 Mike Roach for organising and compiling the information for the various walks by the Cornwall Railway Society which were held on 1st June, 1996 to The Cheesewring. 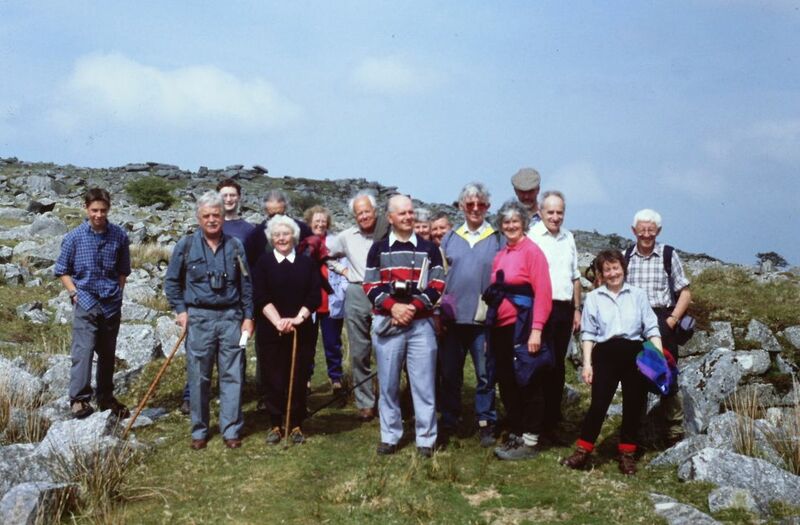 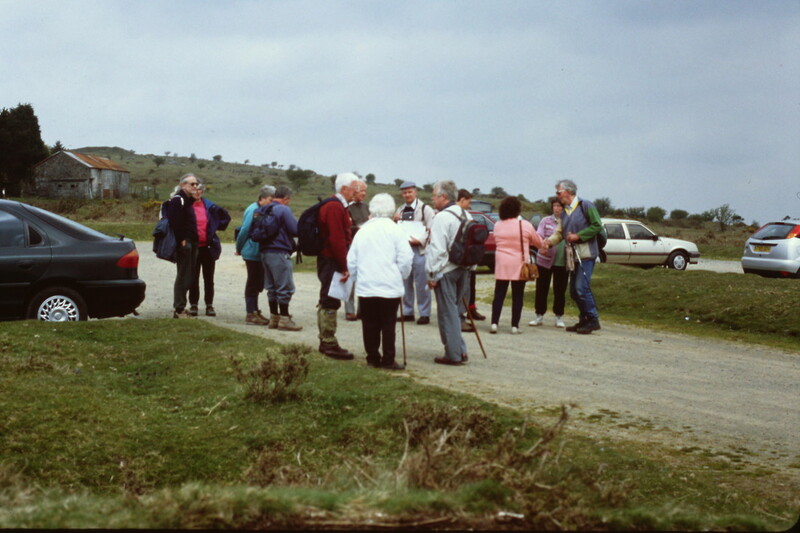 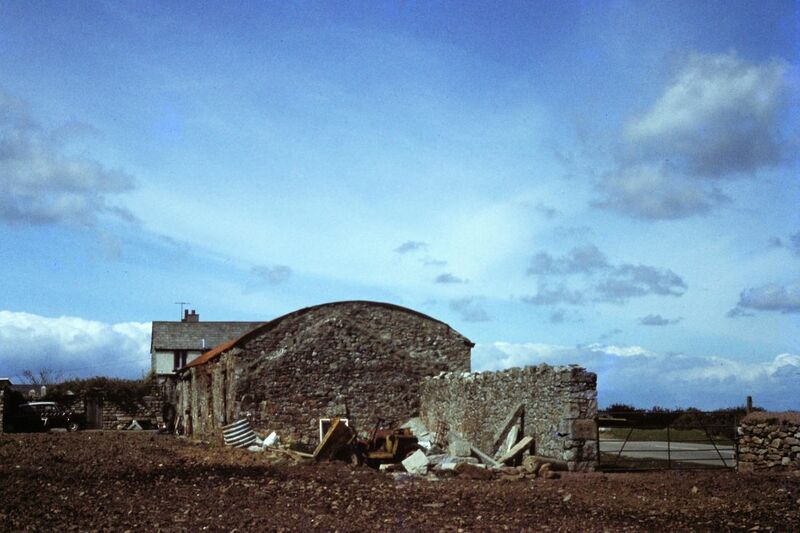 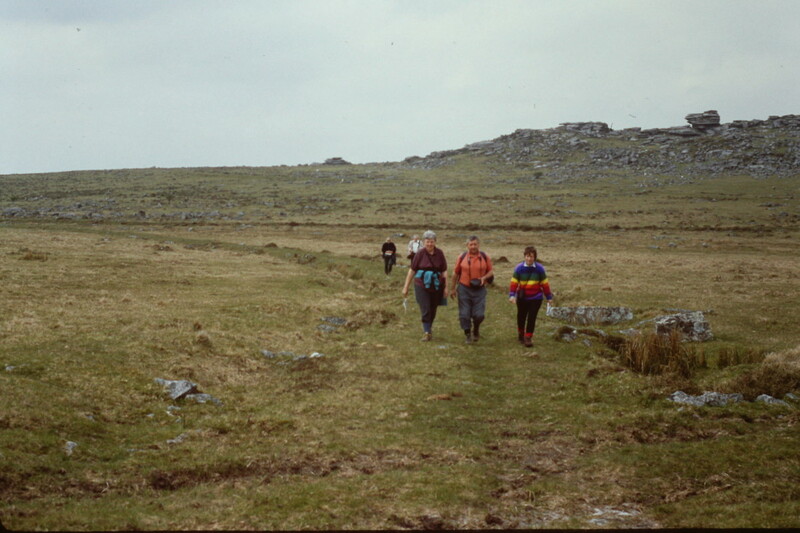 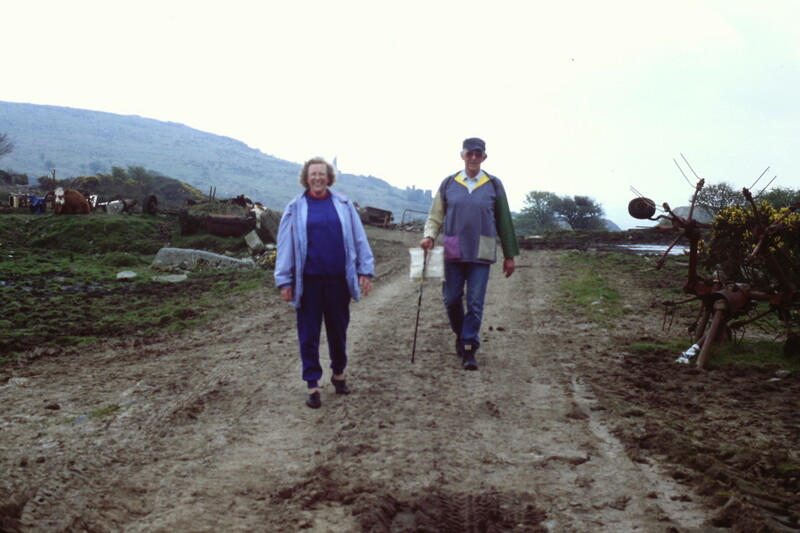 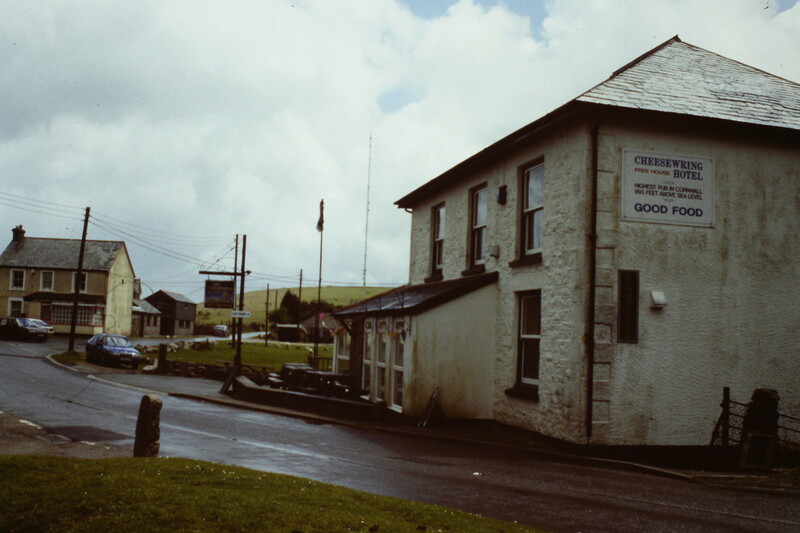 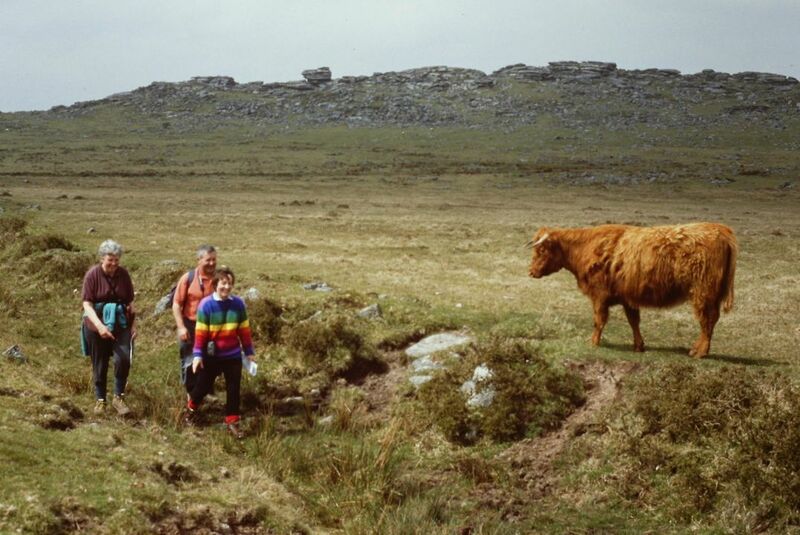 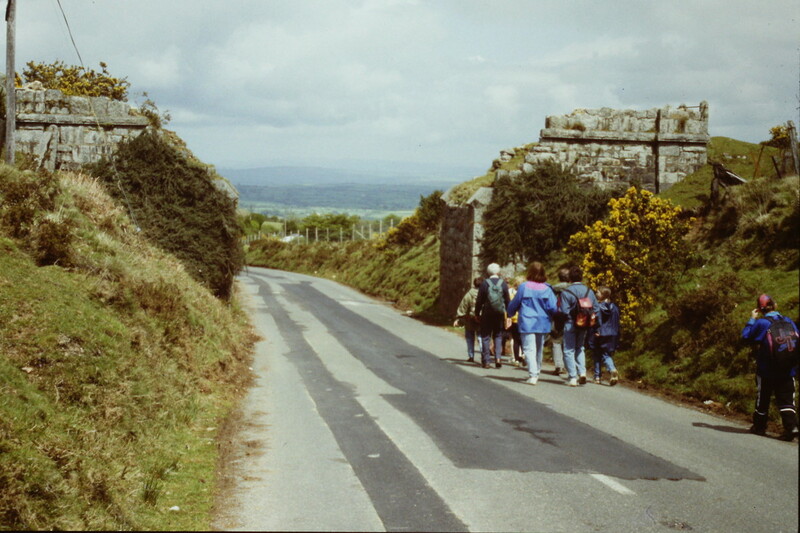 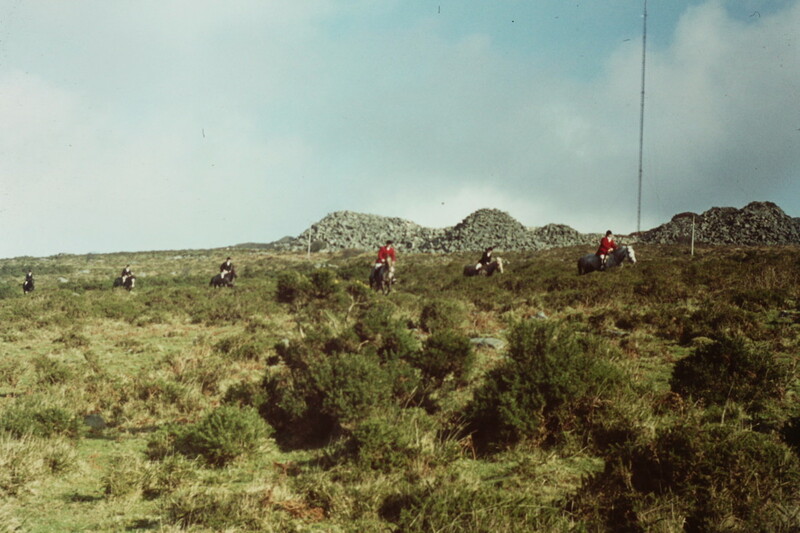 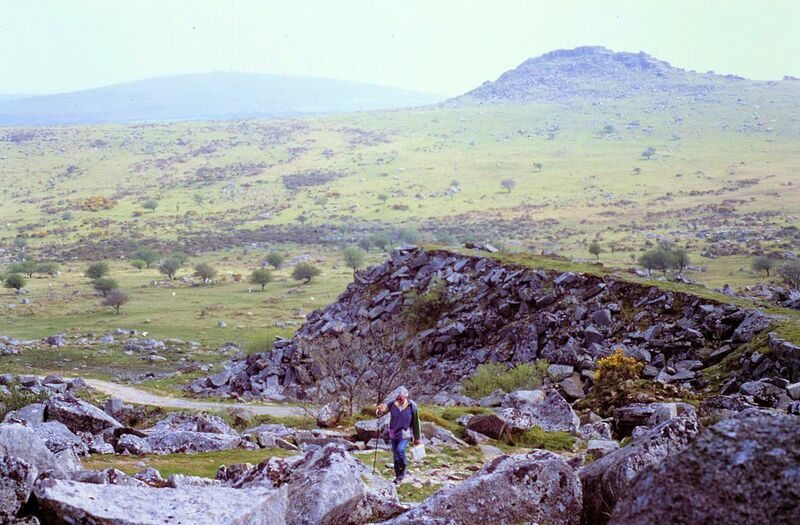 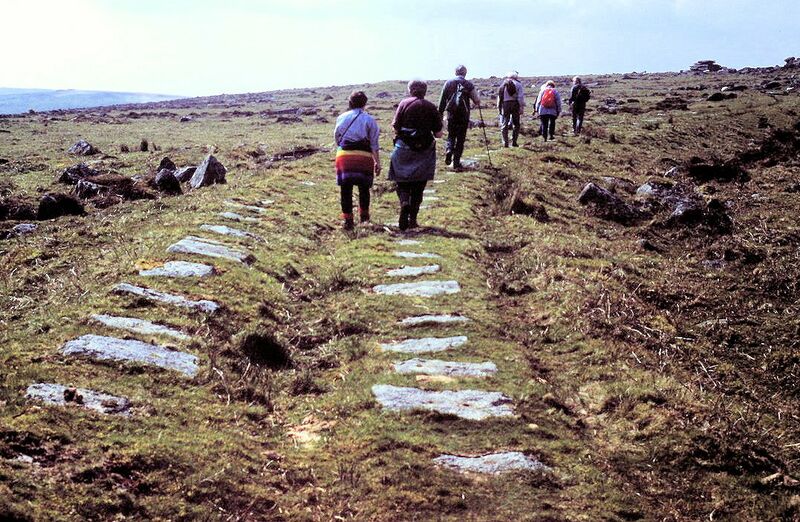 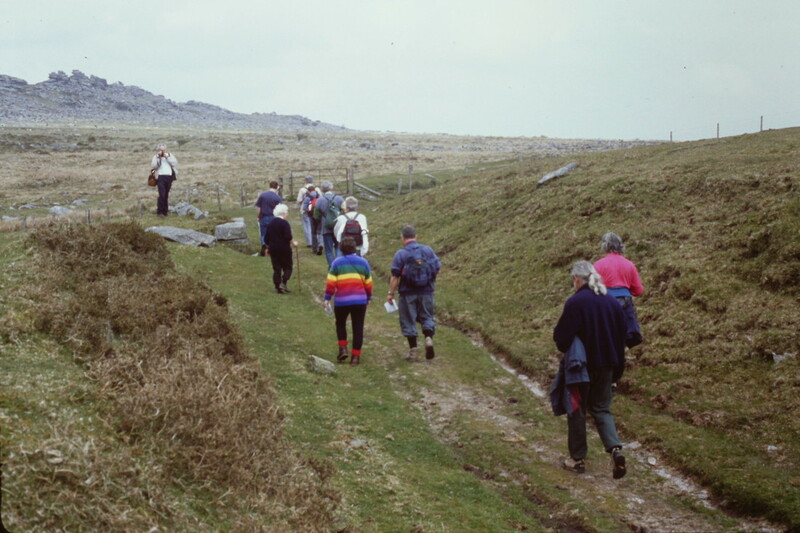 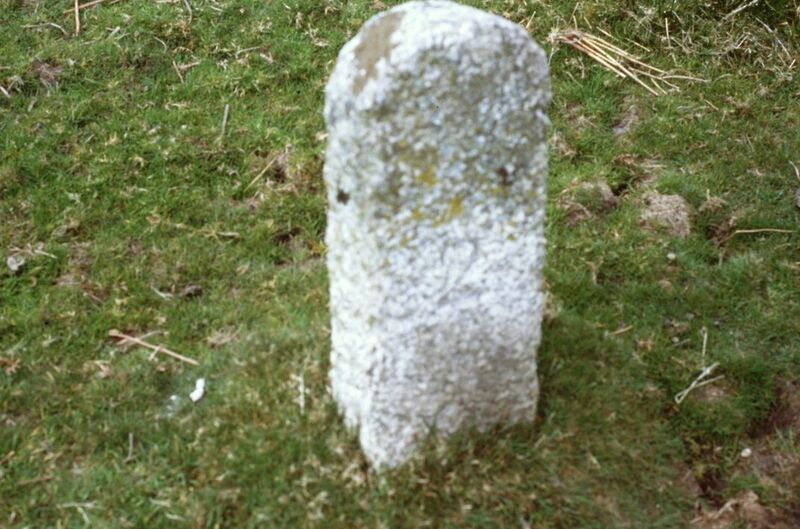 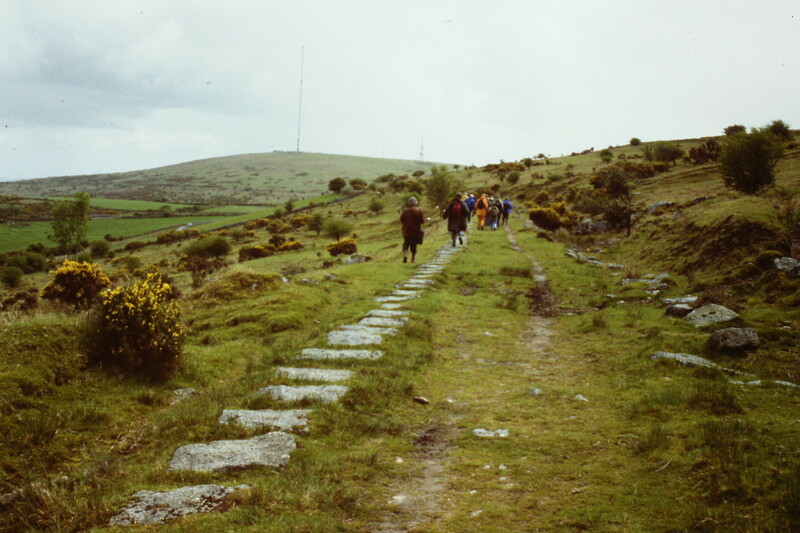 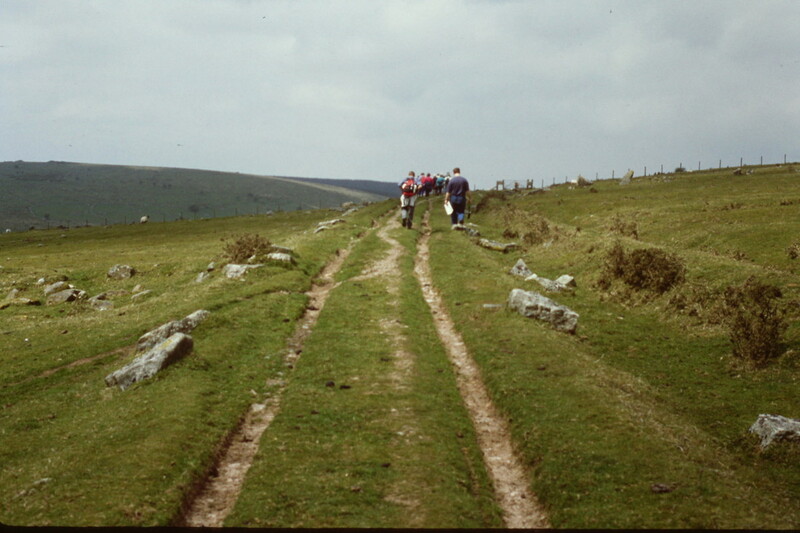 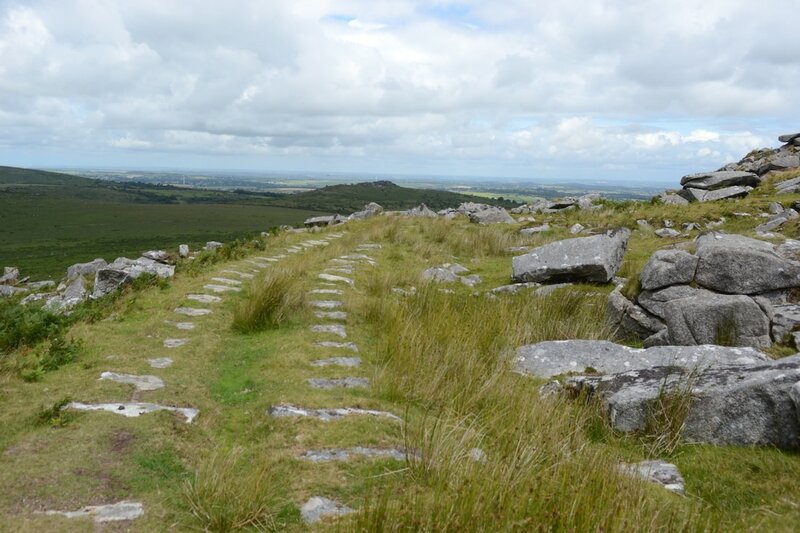 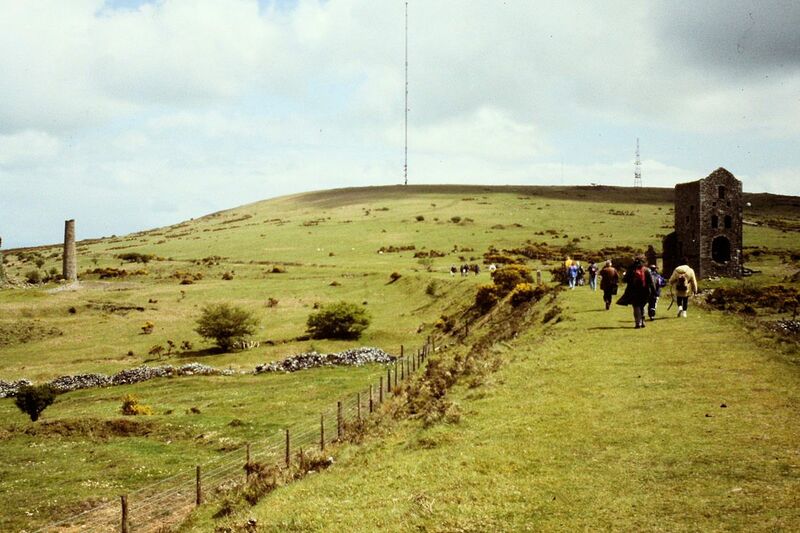 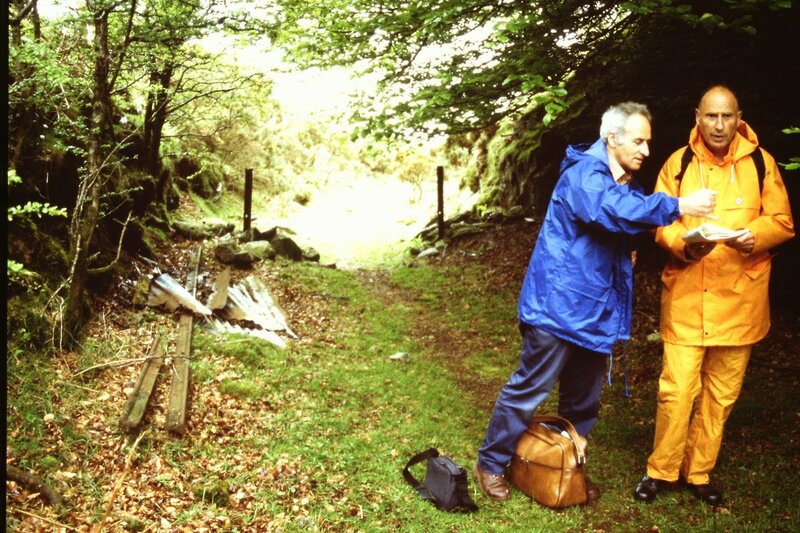 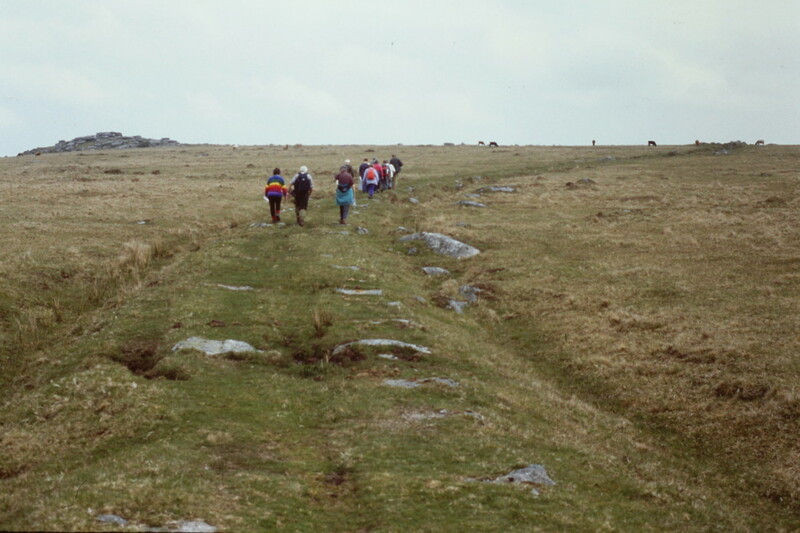 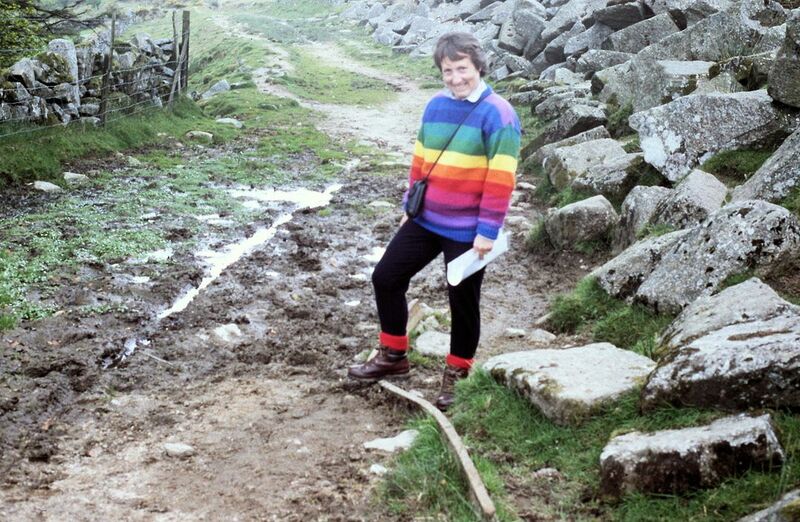 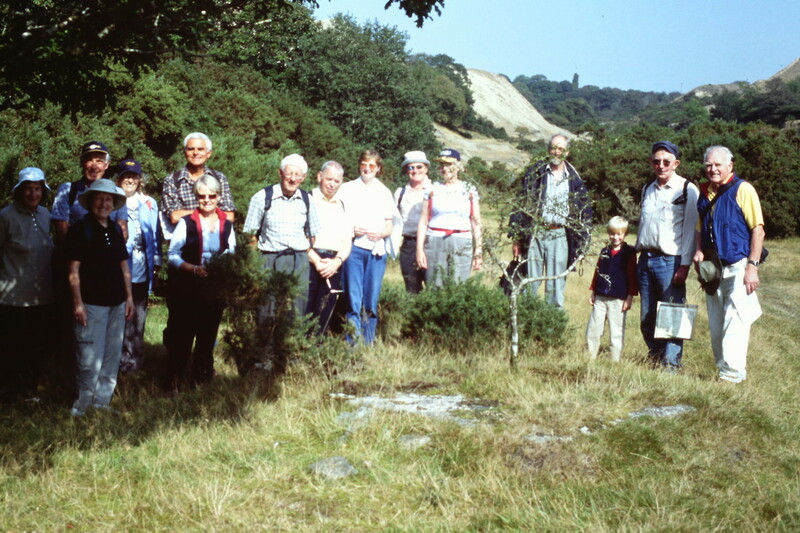 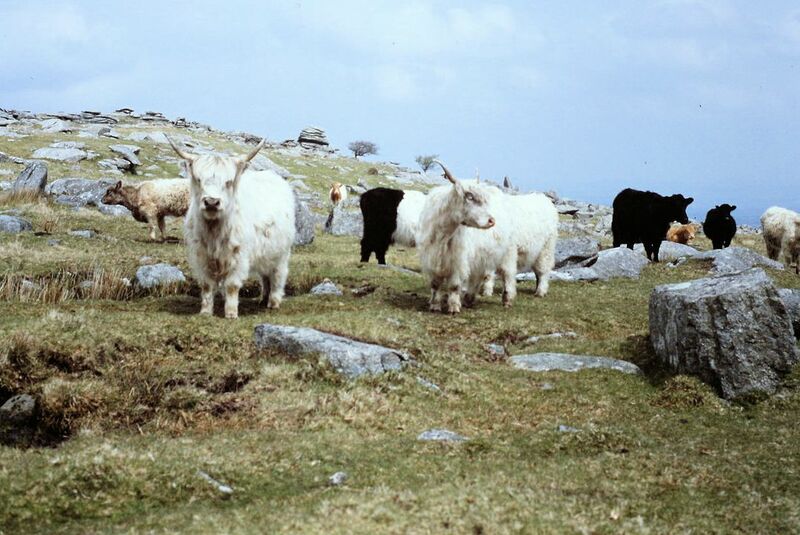 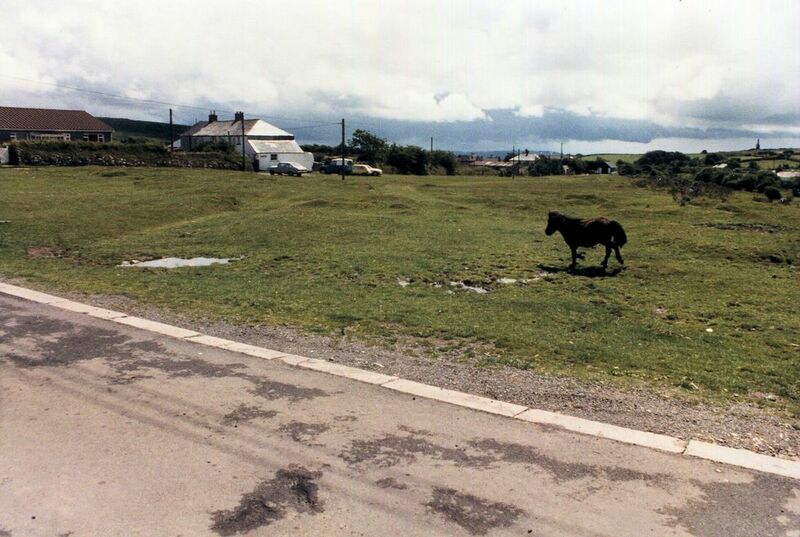 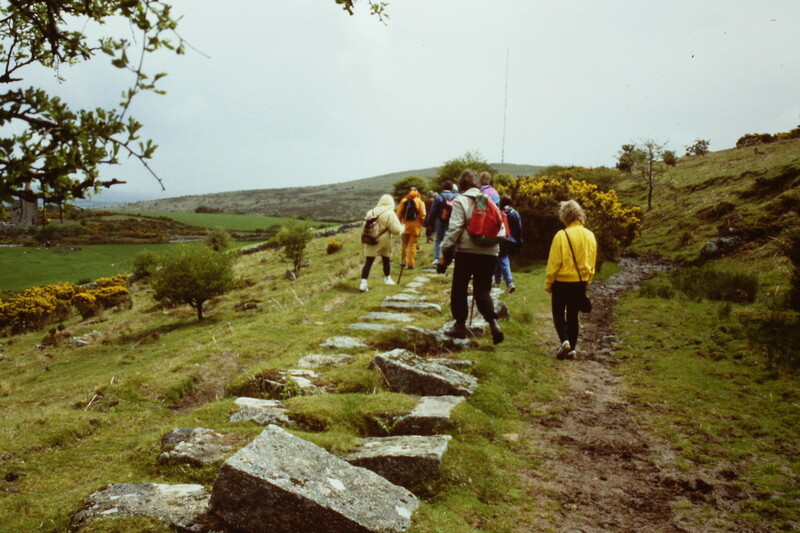 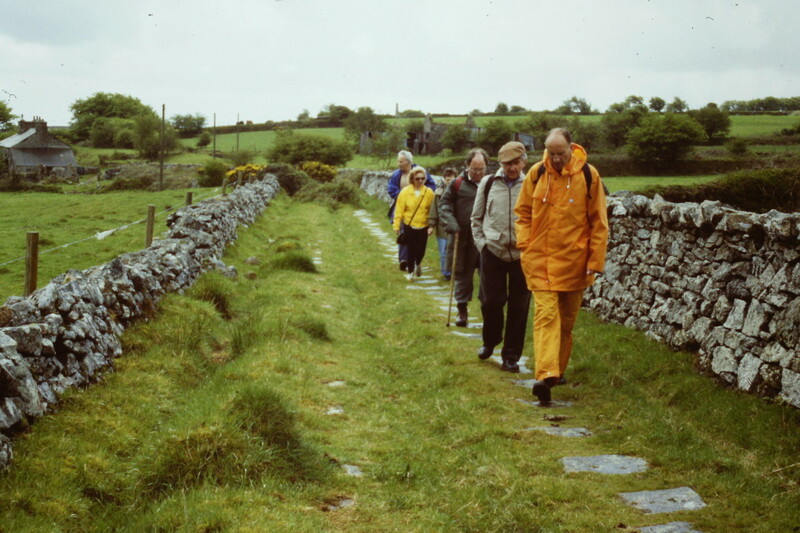 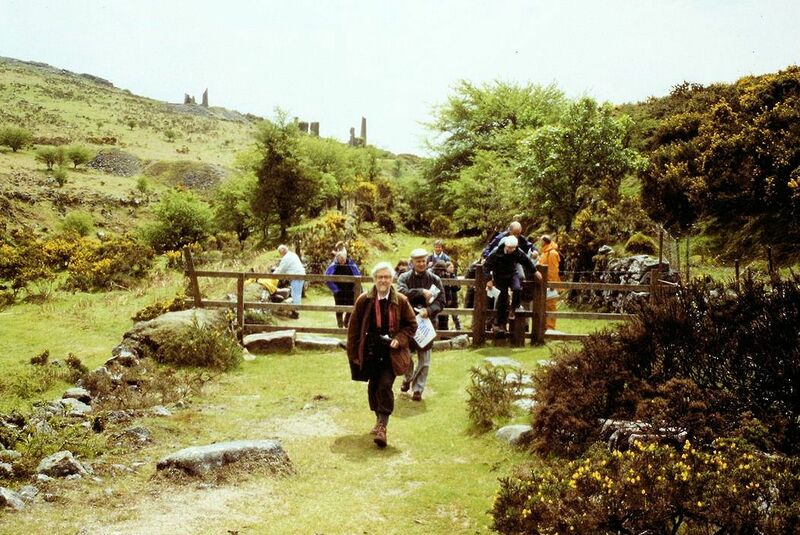 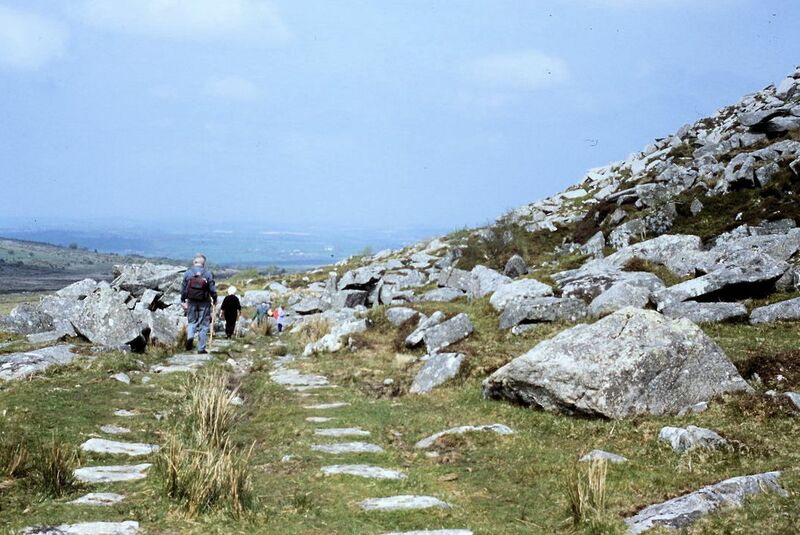 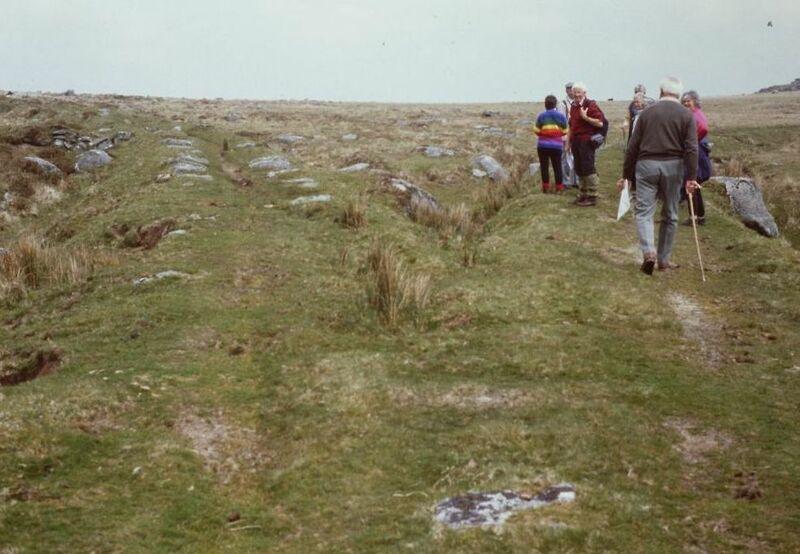 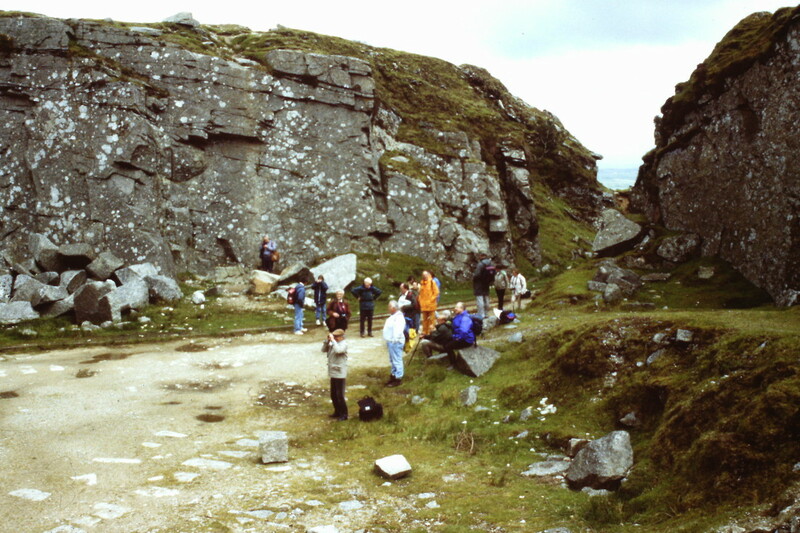 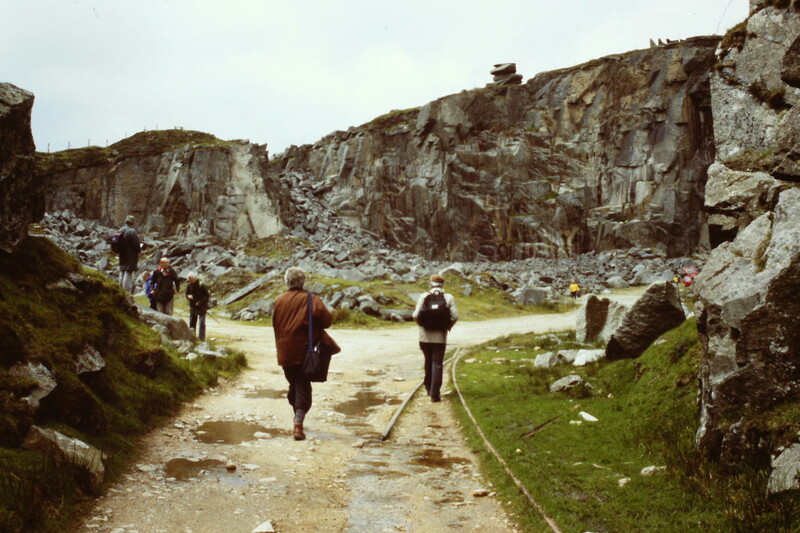 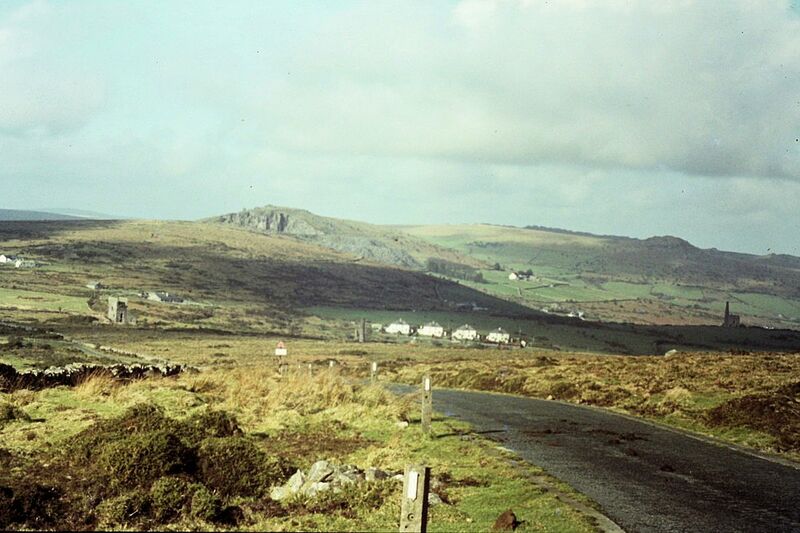 1st May, 1999 to Kilmar Tor and 20th September, 2003 to the Cheesewring. 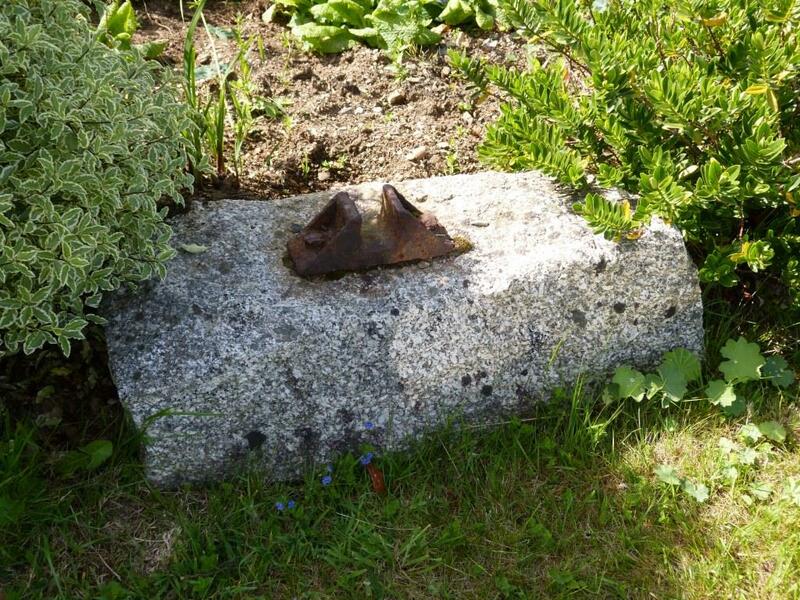 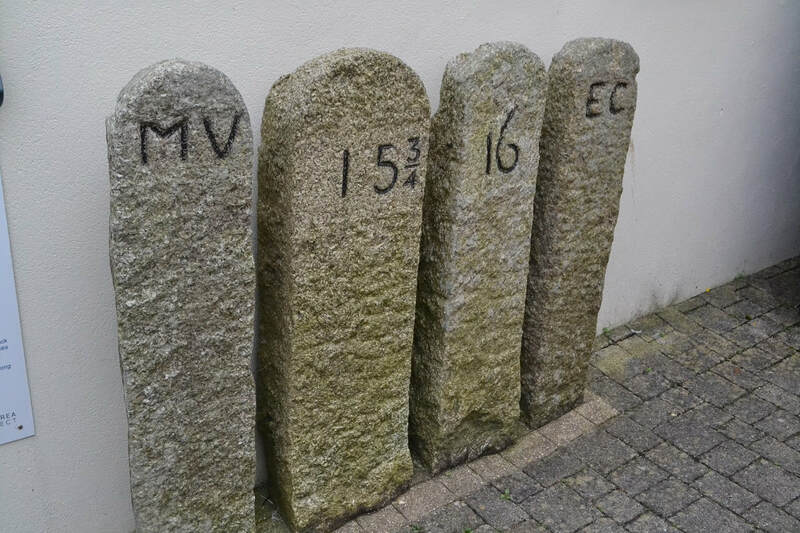 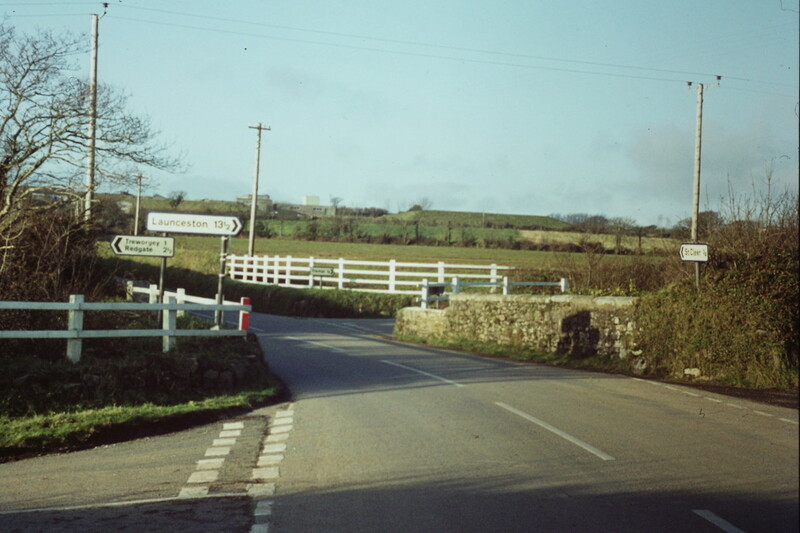 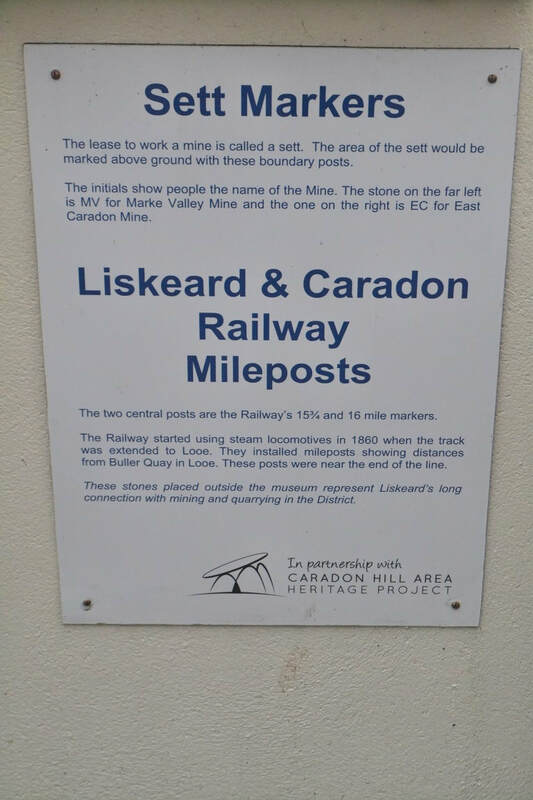 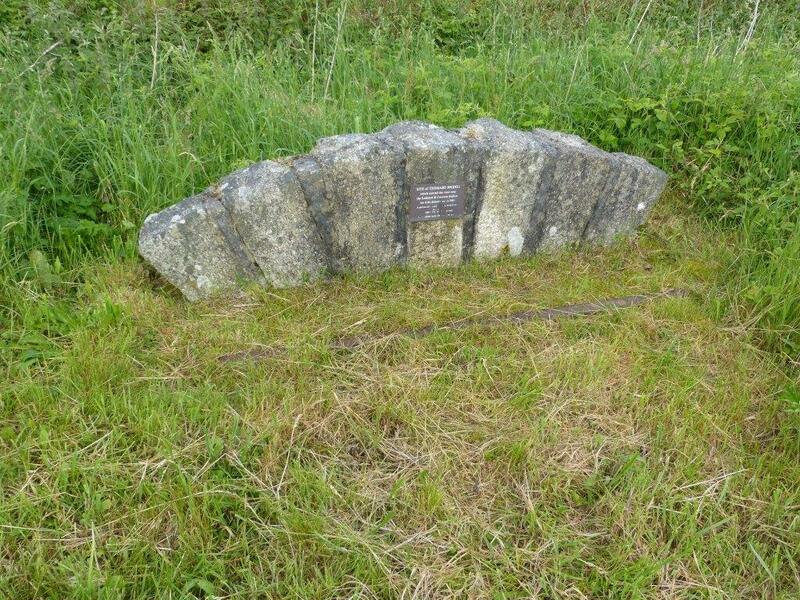 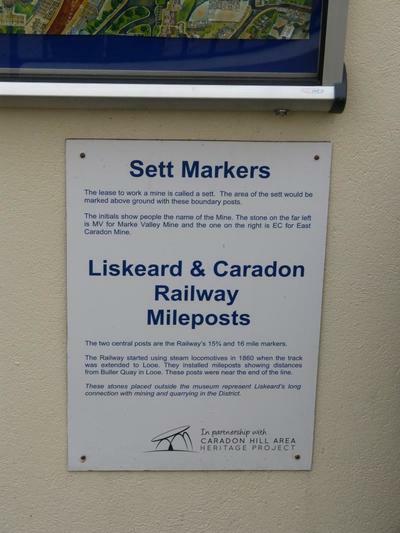 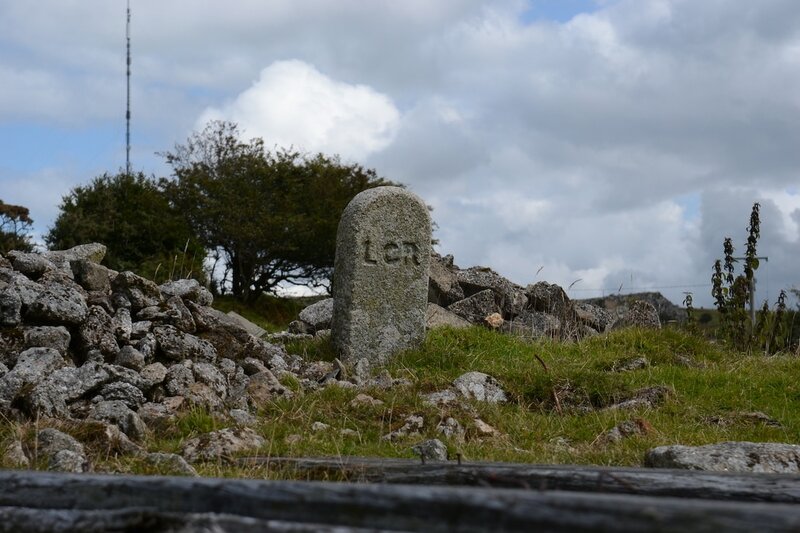 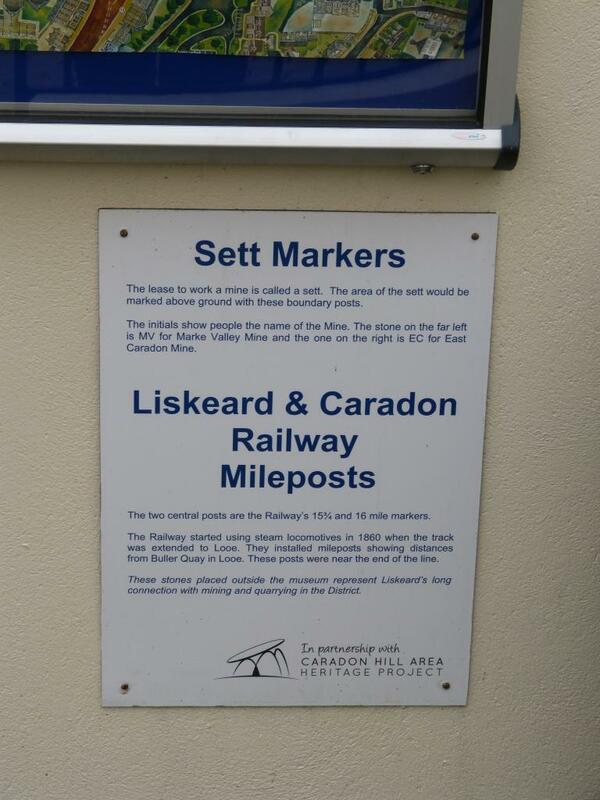 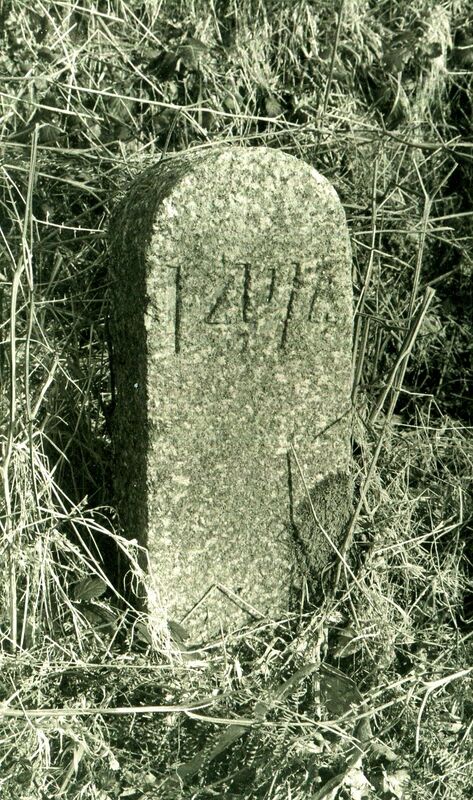 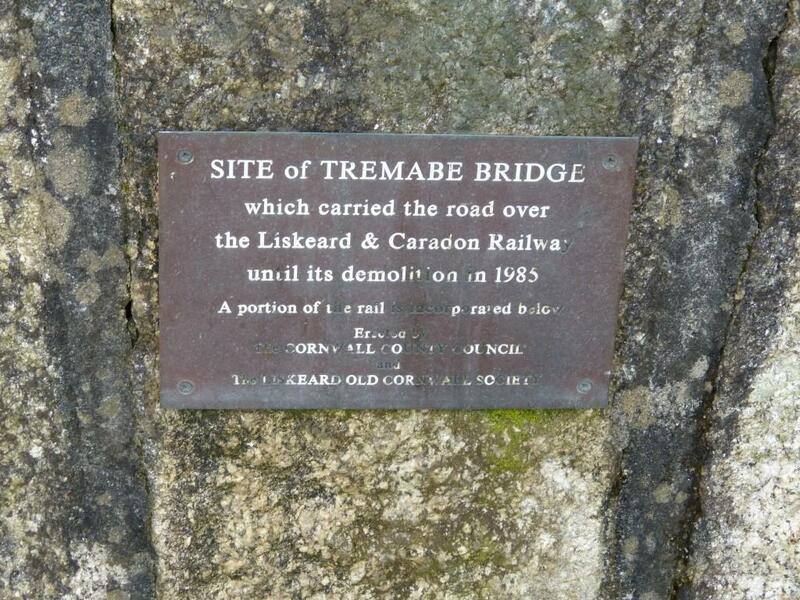 170803a Milepost etc from the Liskeard and Caradon Railway. 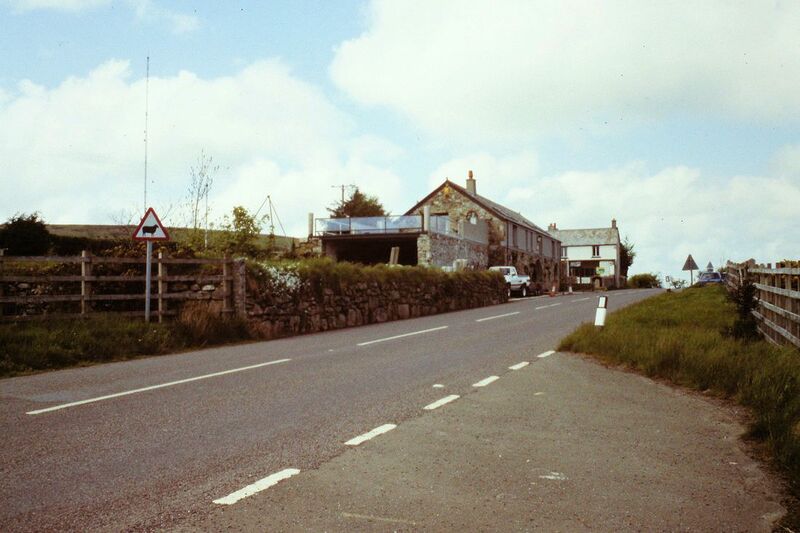 170708a Moorswater taken on 8 July 2017 - Notice the house just below the blue cherry pickers which can be seen on the photograph below a comparison with Roger Winnen's photograph above taken on 24th August, 1974. 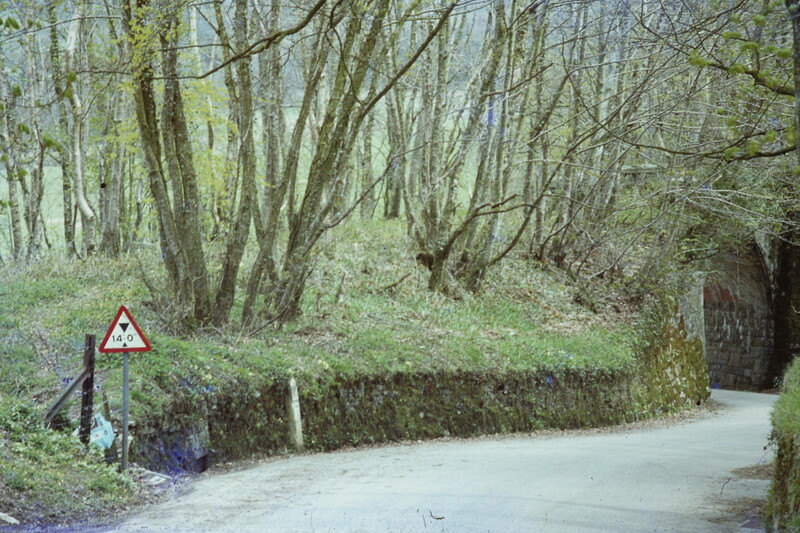 Copyright Peter Murnaghan. 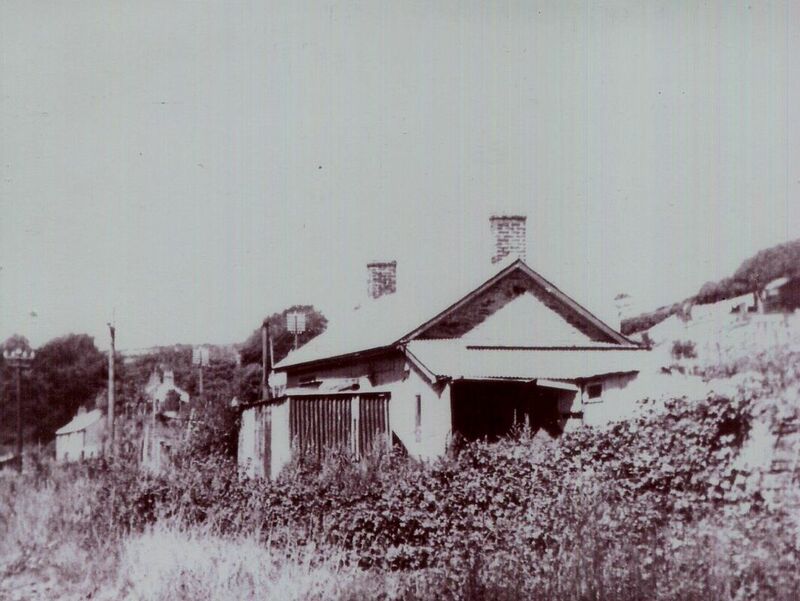 A picture from the Maurice Dart Collection taken in 1947 of Moorswater station in use as a bungalow. 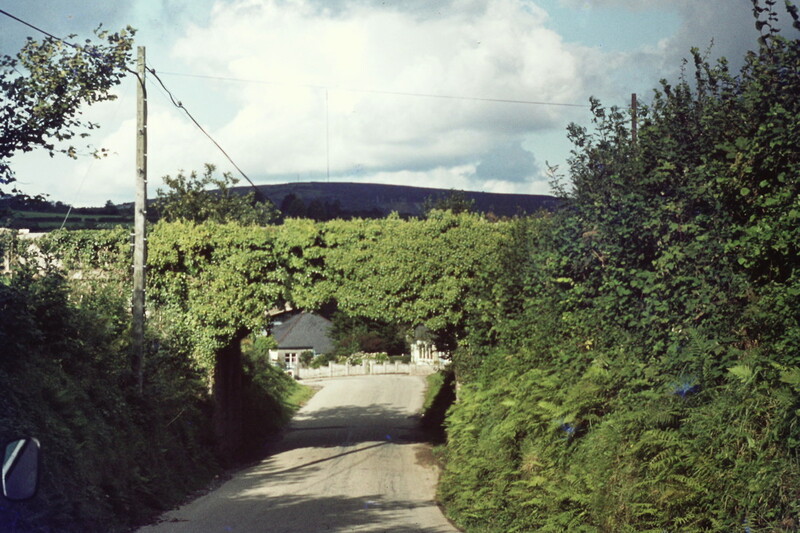 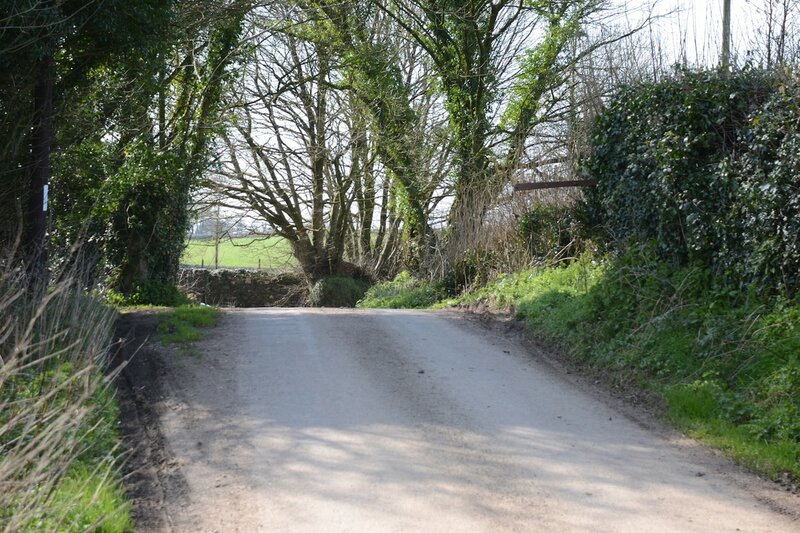 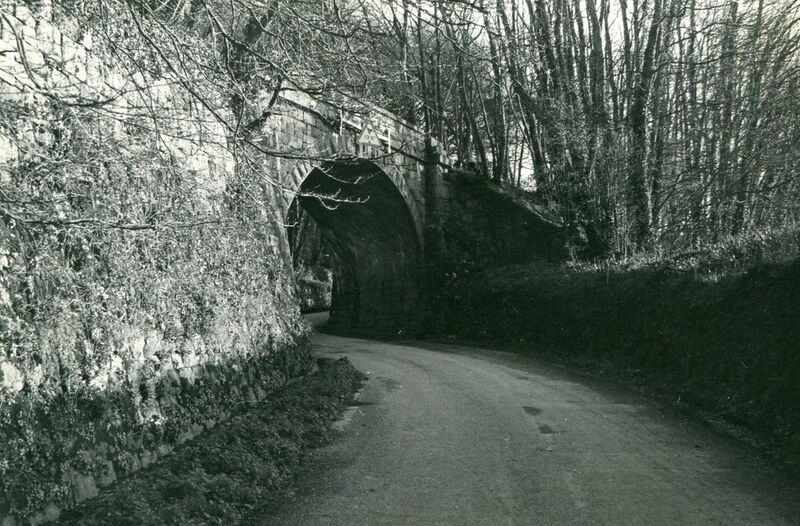 ​ From Woodhill Bridge the line then disappears into private land, partly ploughed over, for some distance. 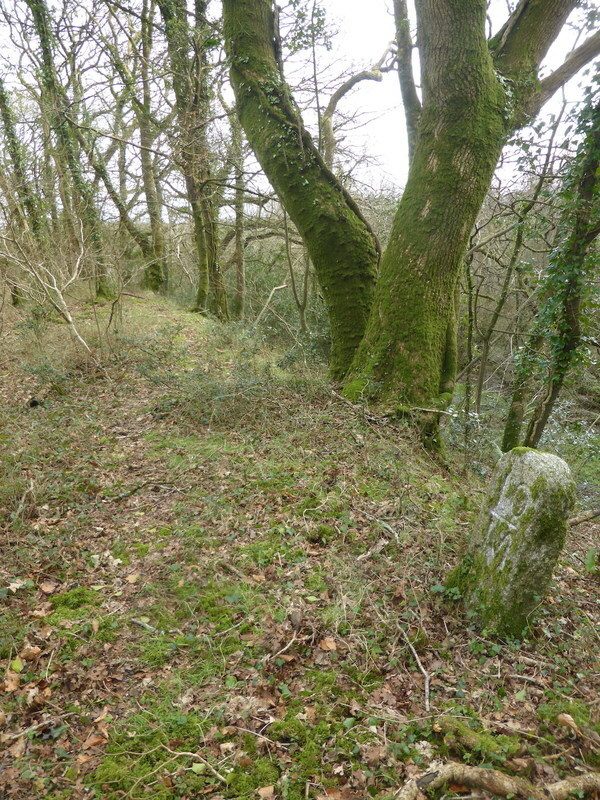 On this section, the next clear relic is the site of the old level crossing across a minor lane at Old Treworgey. 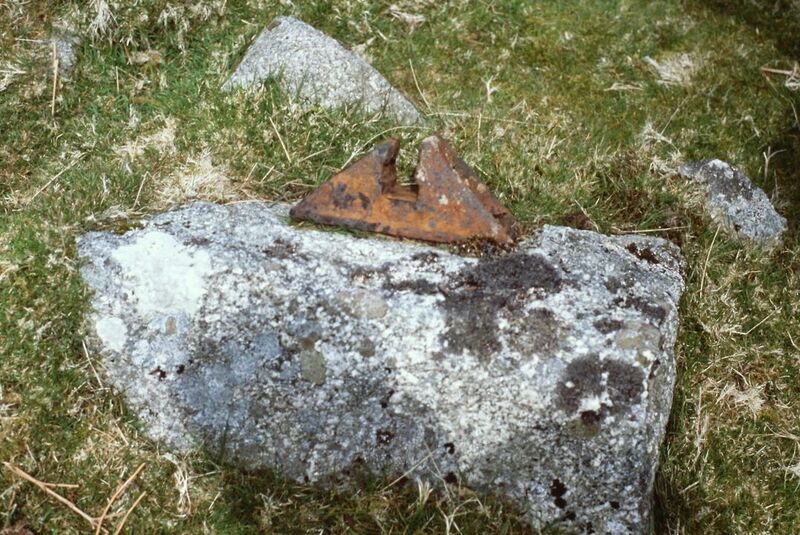 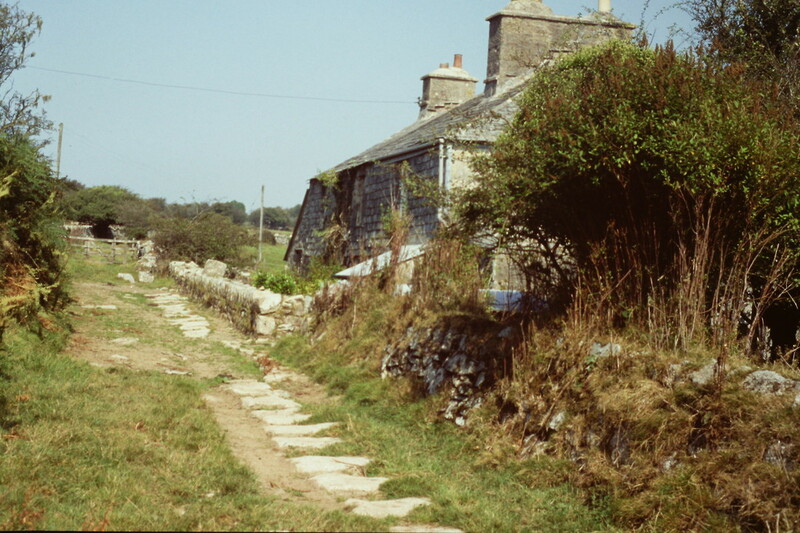 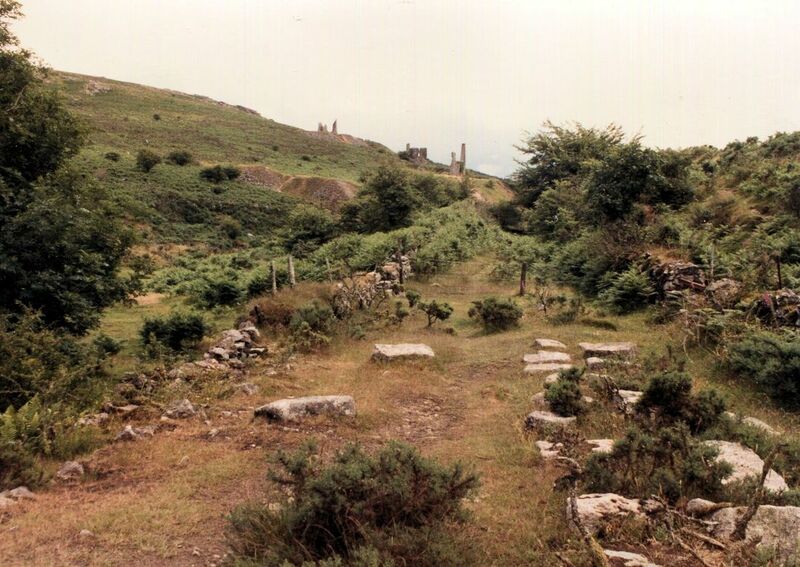 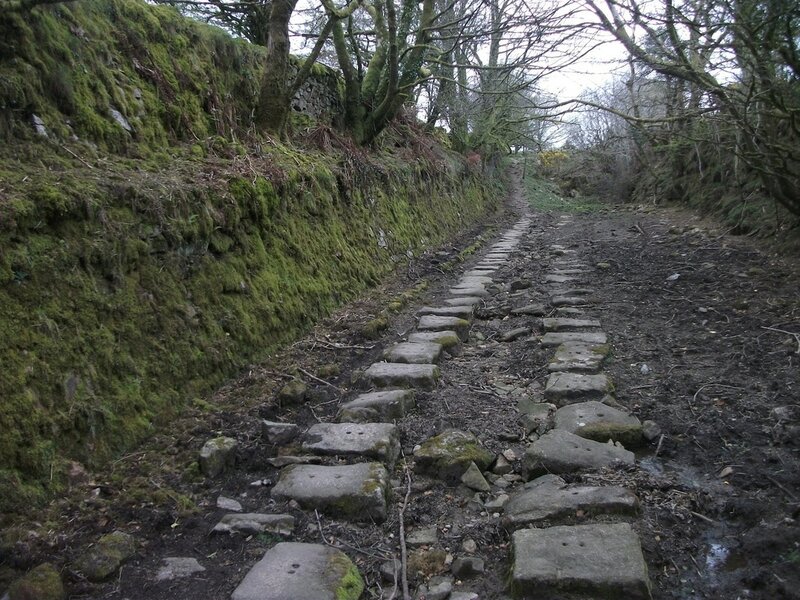 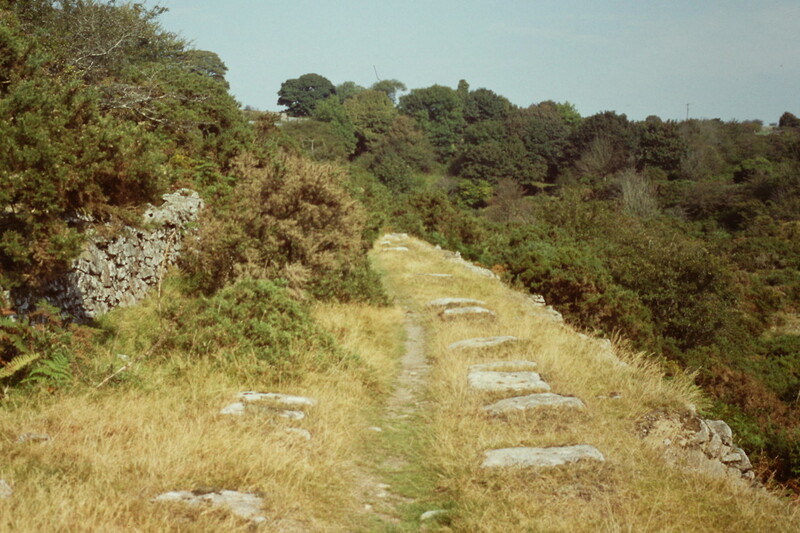 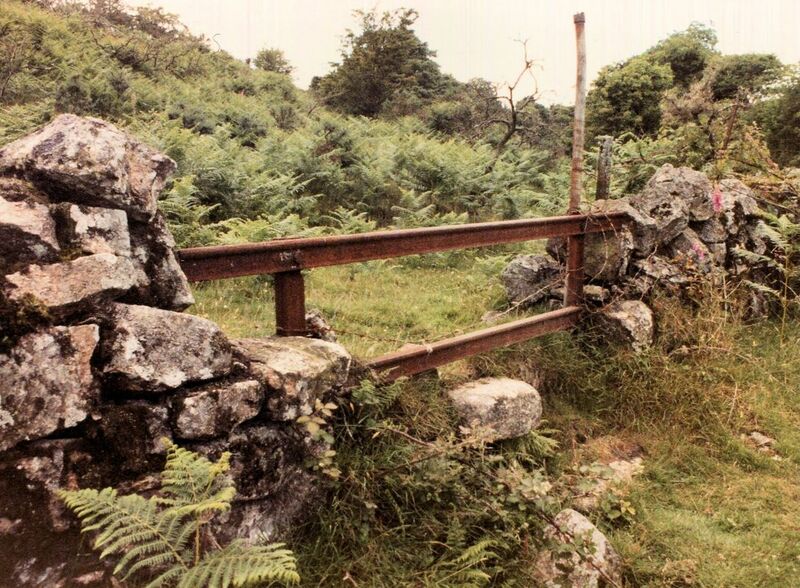 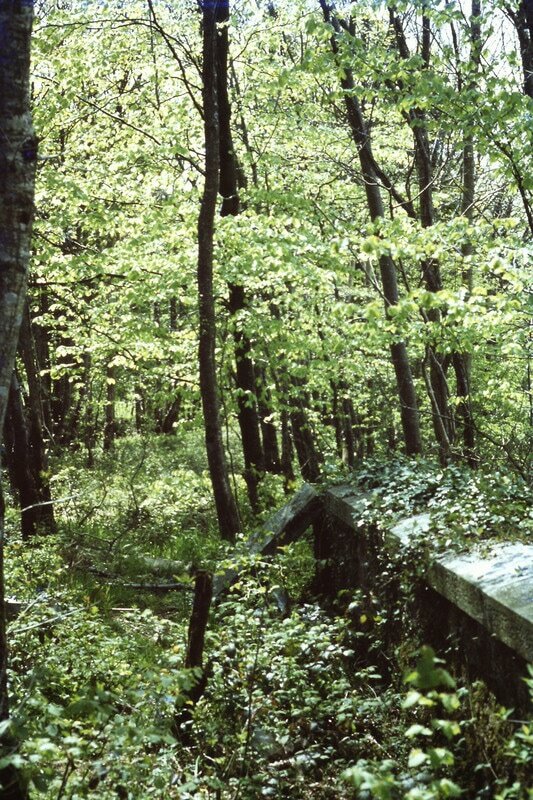 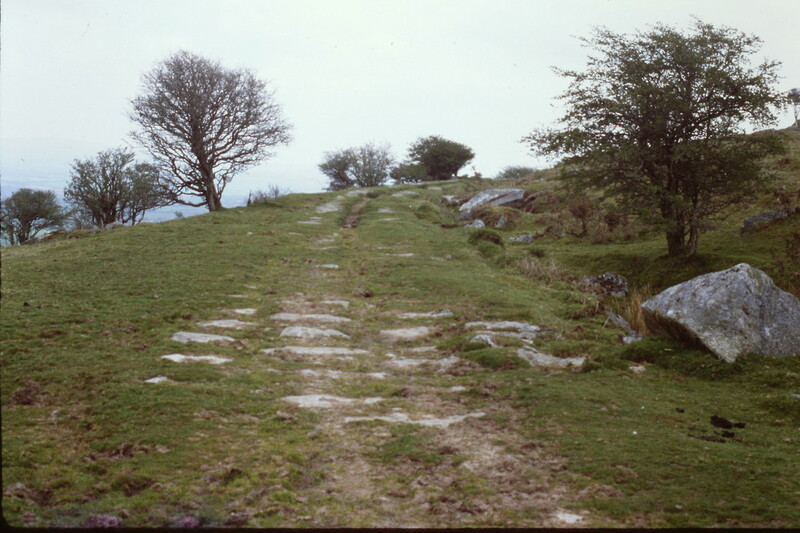 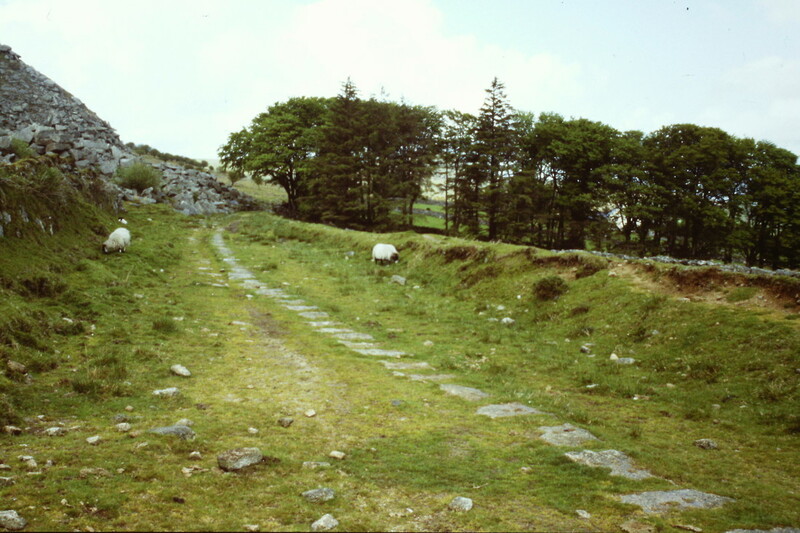 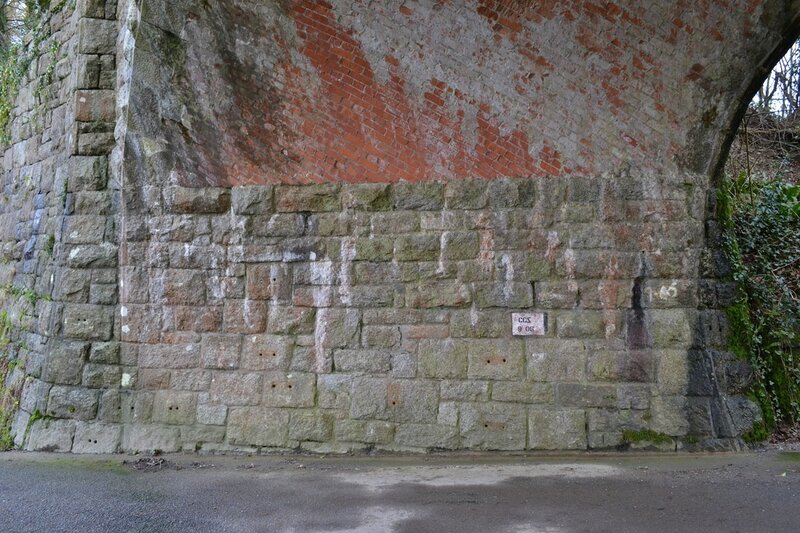 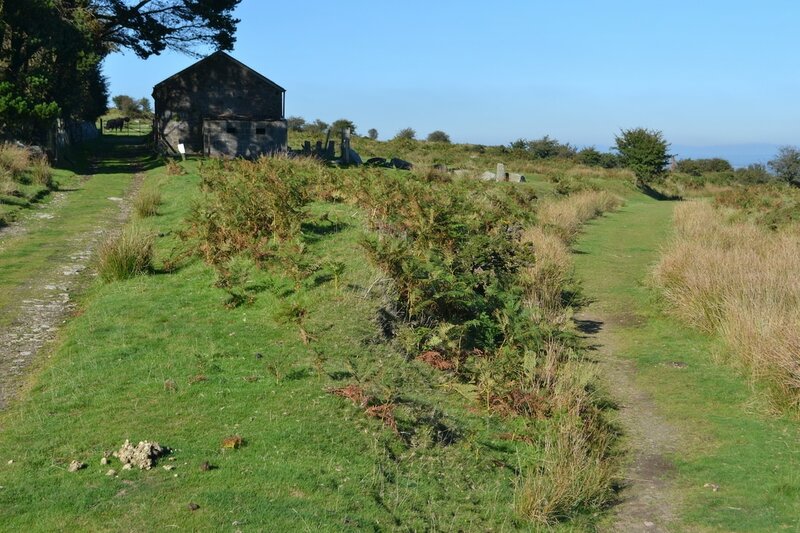 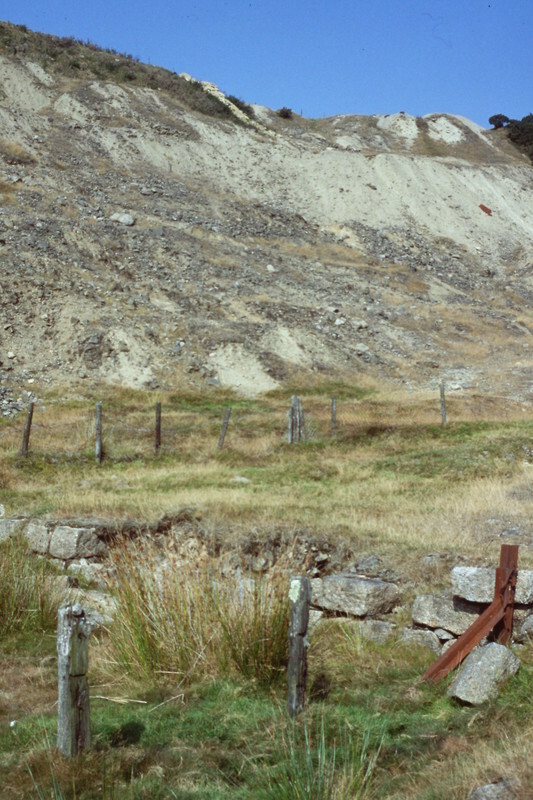 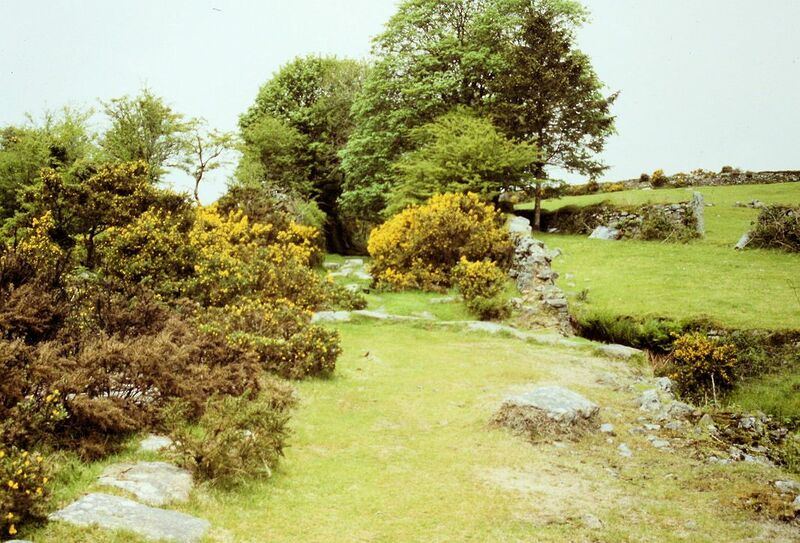 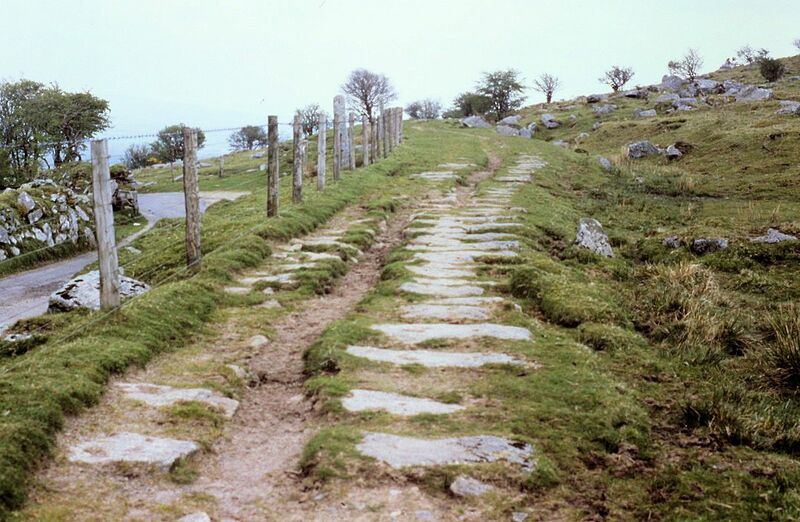 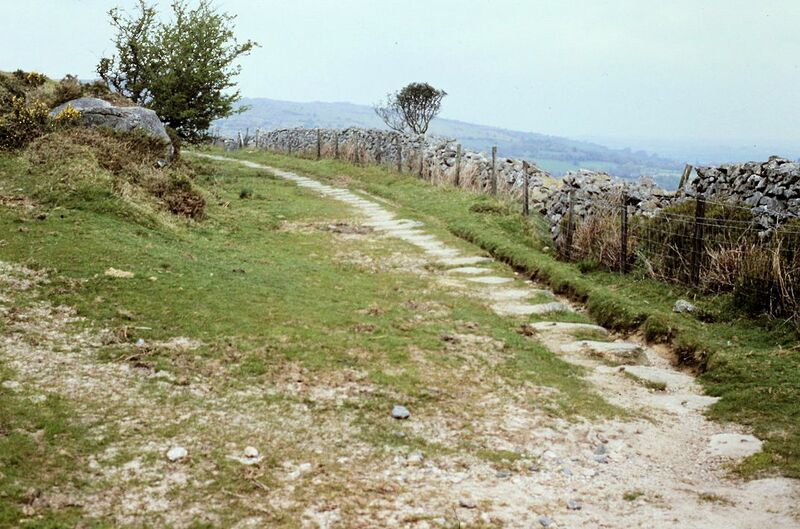 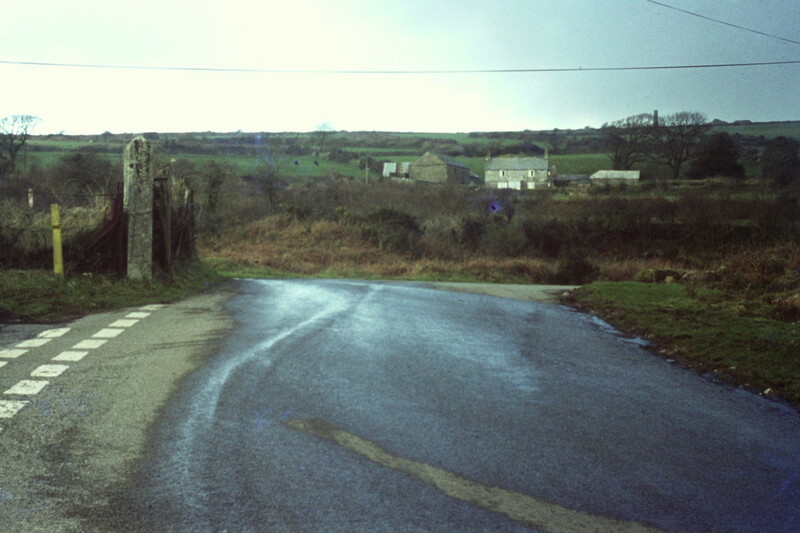 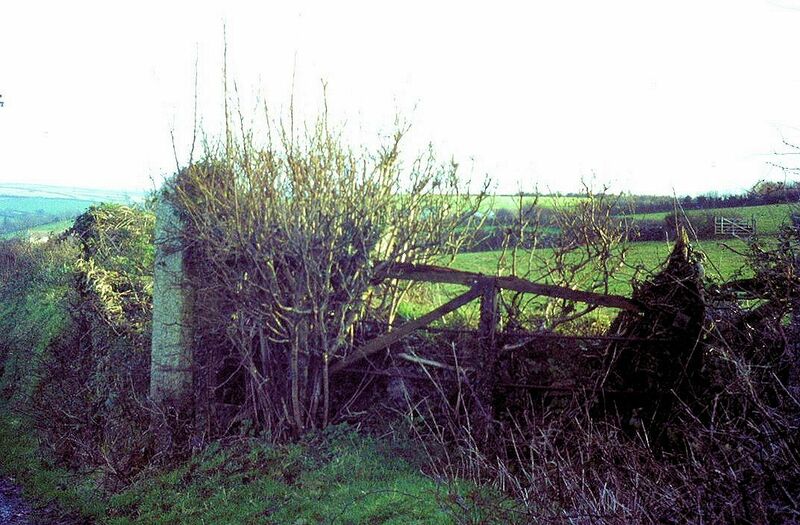 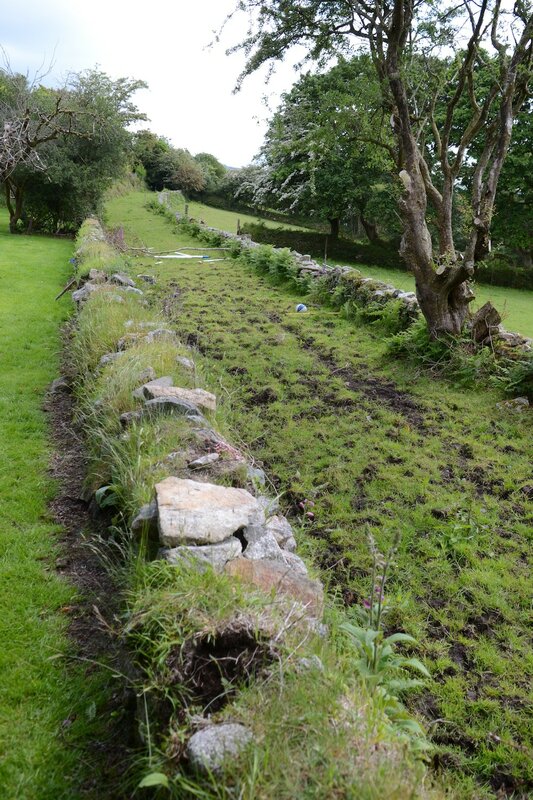 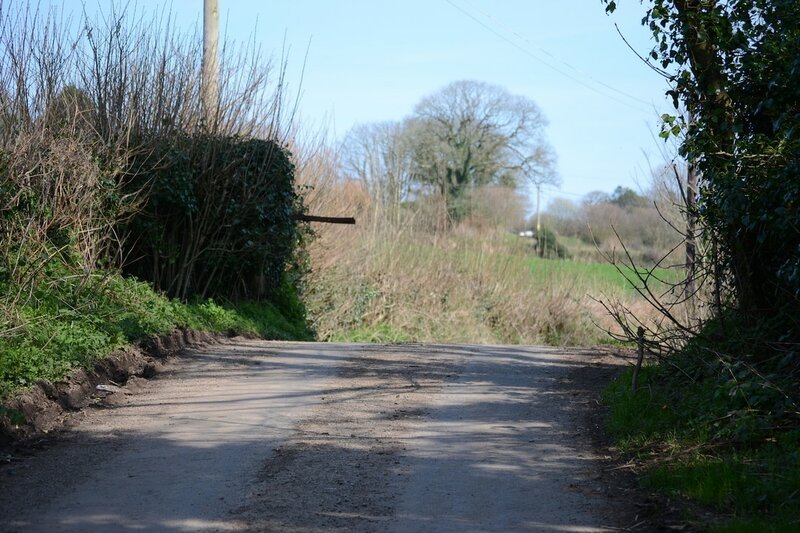 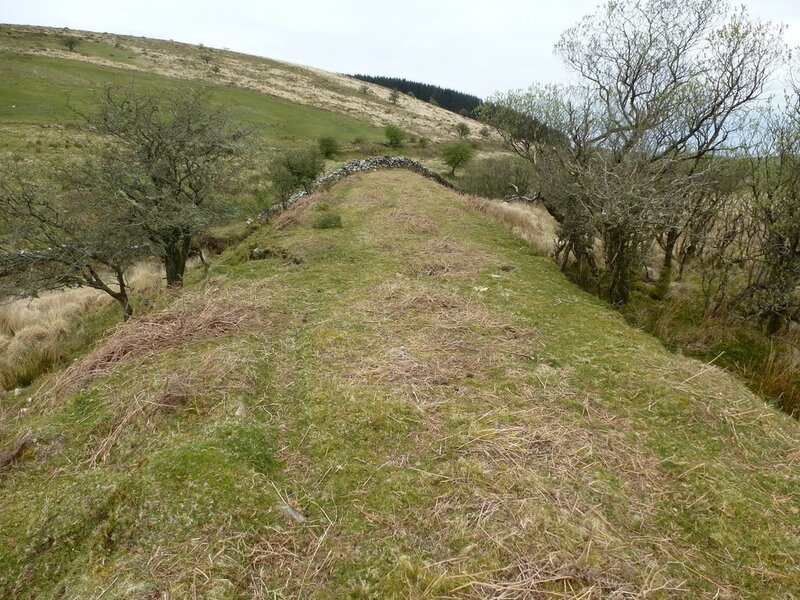 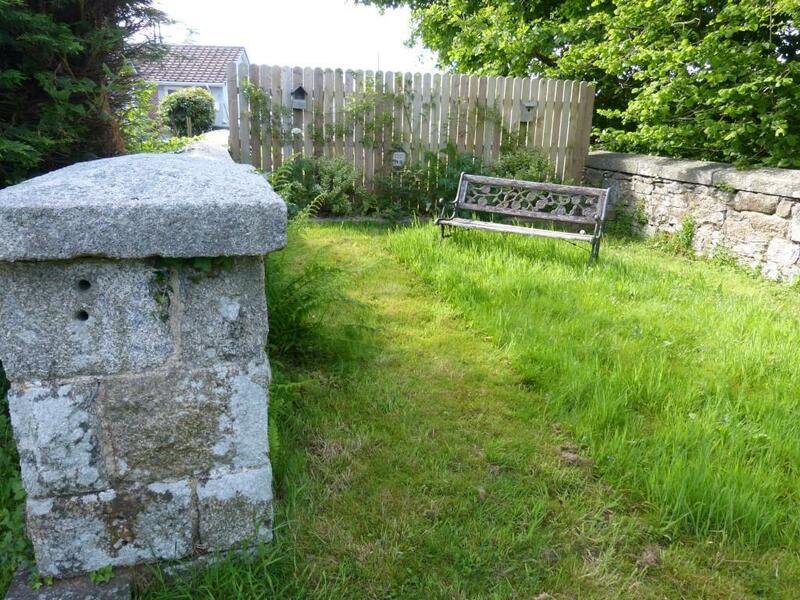 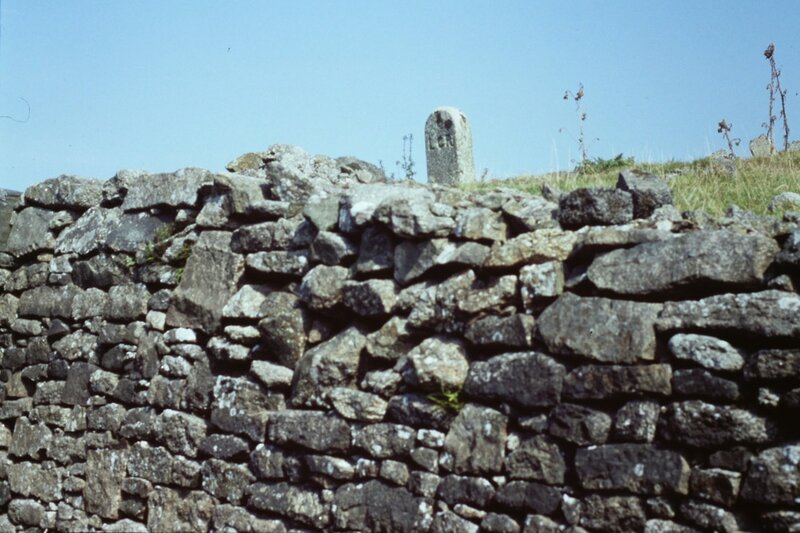 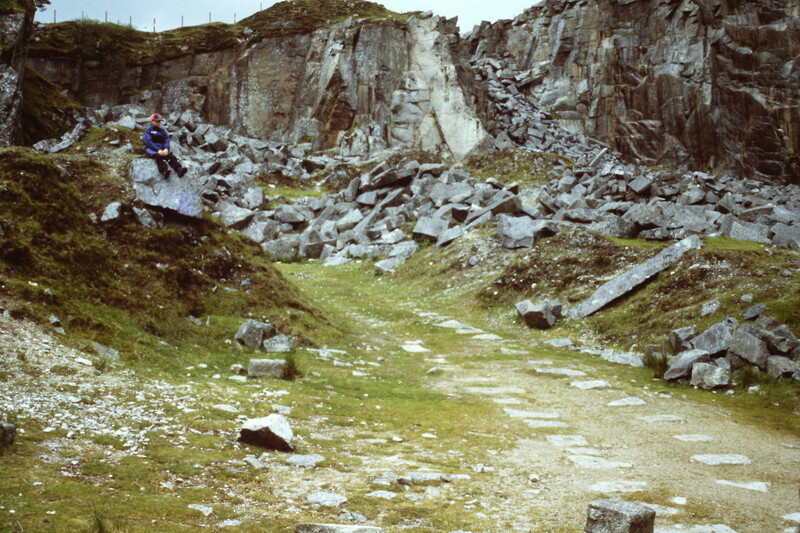 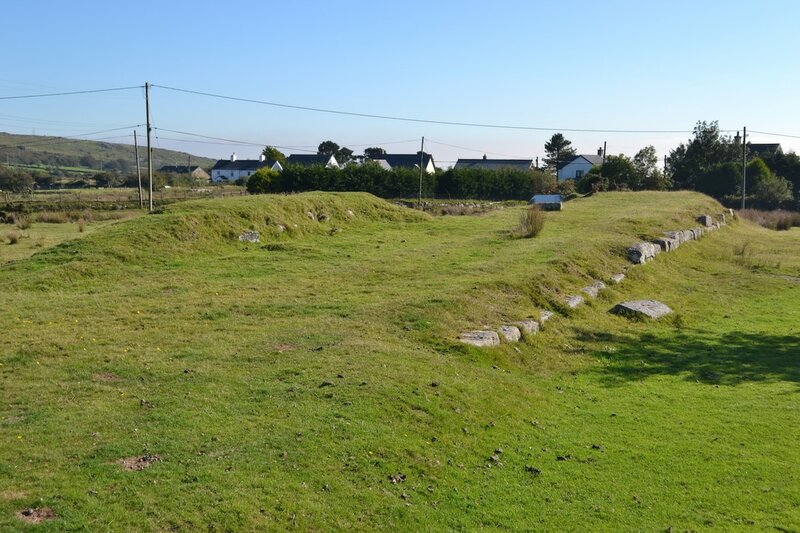 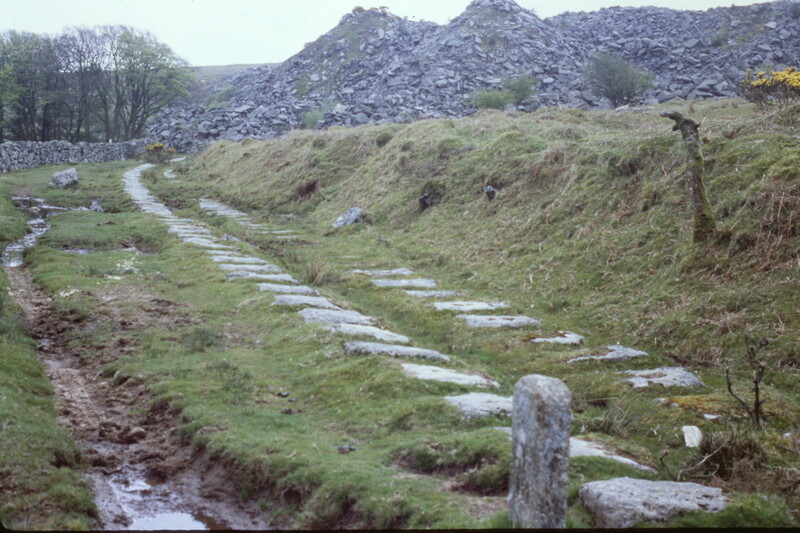 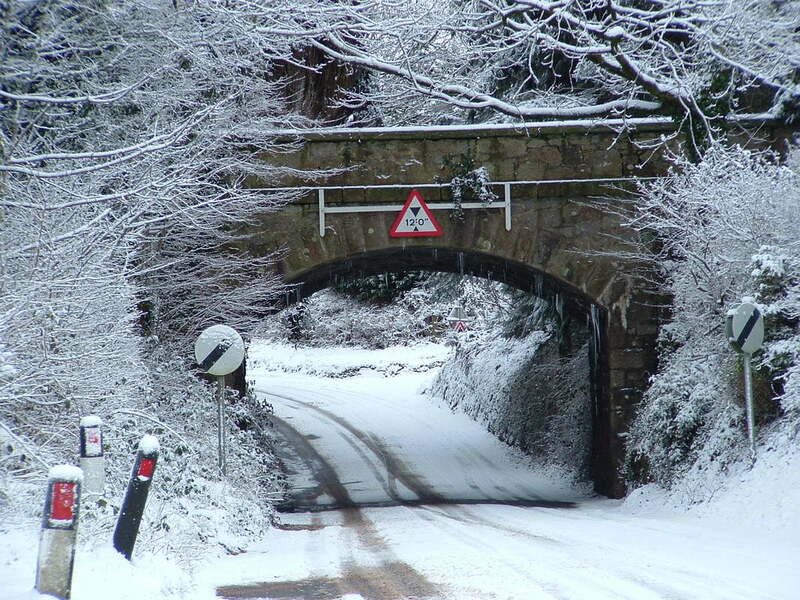 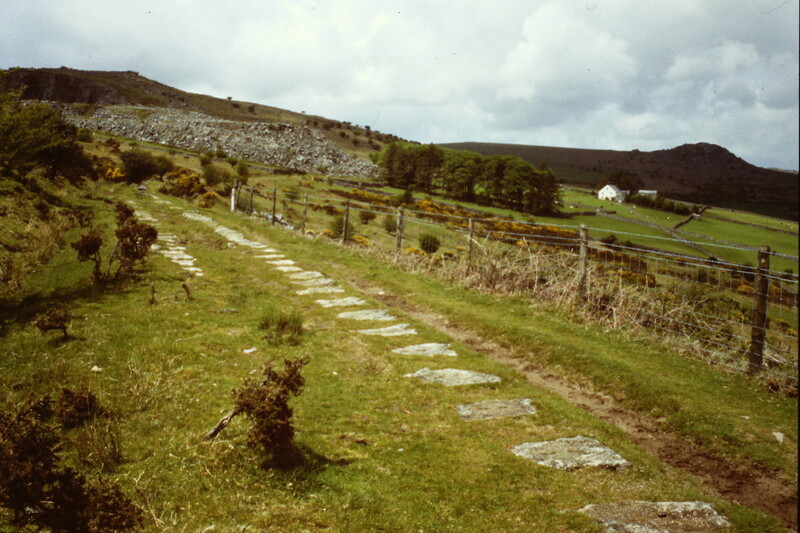 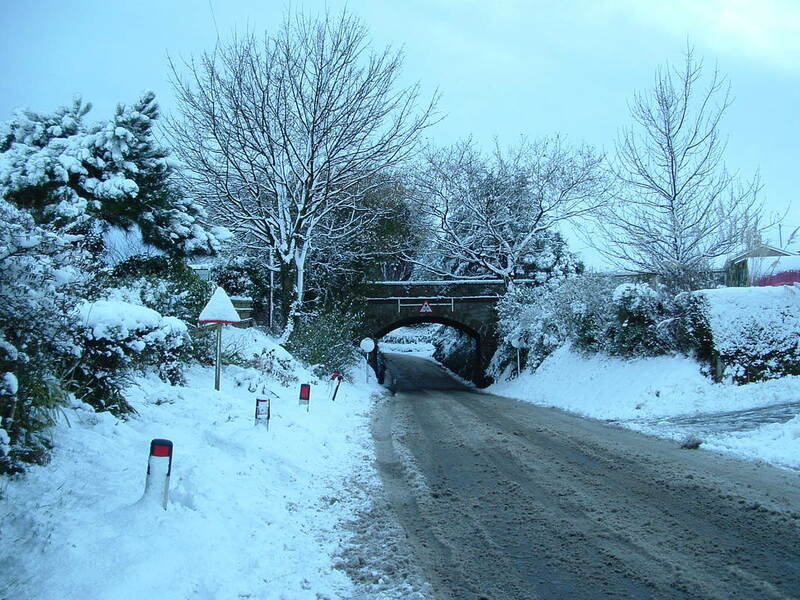 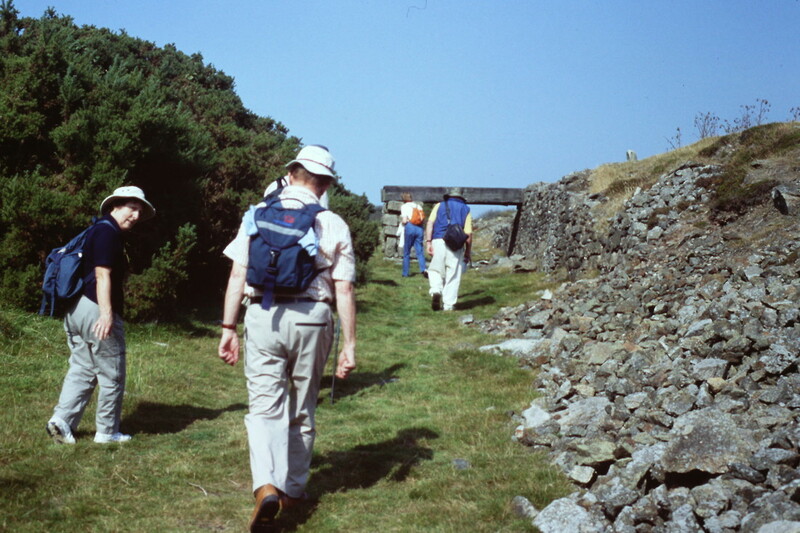 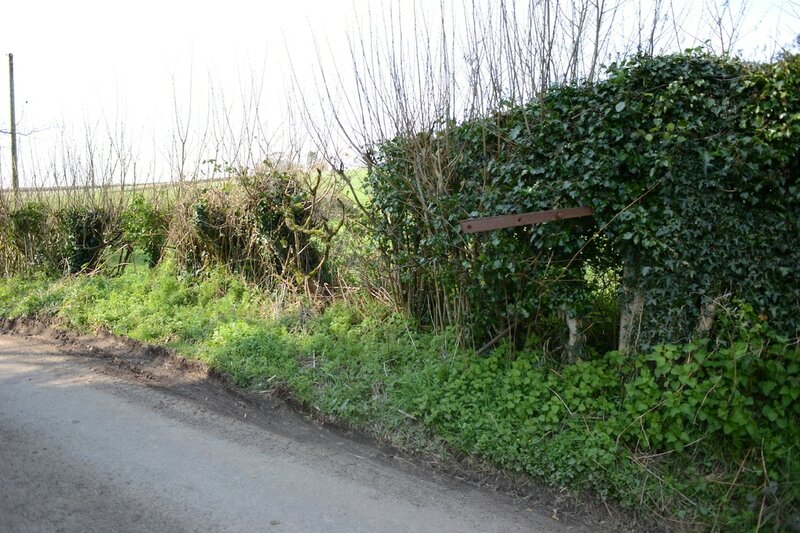 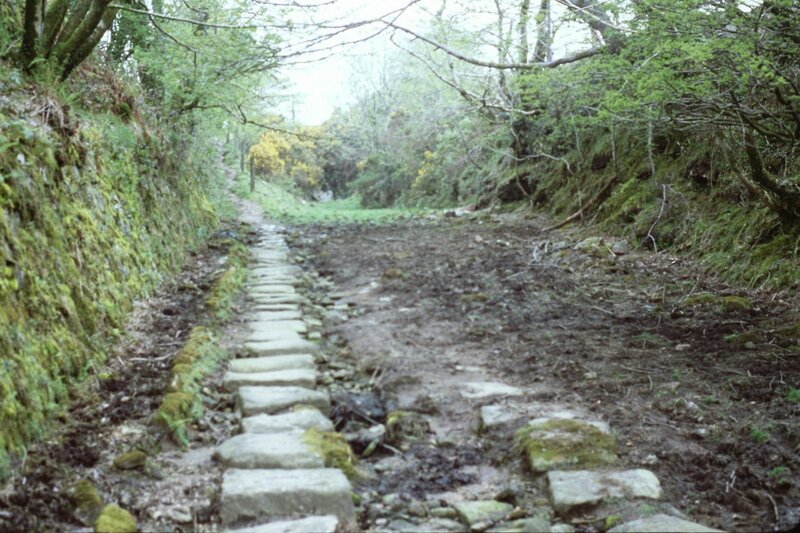 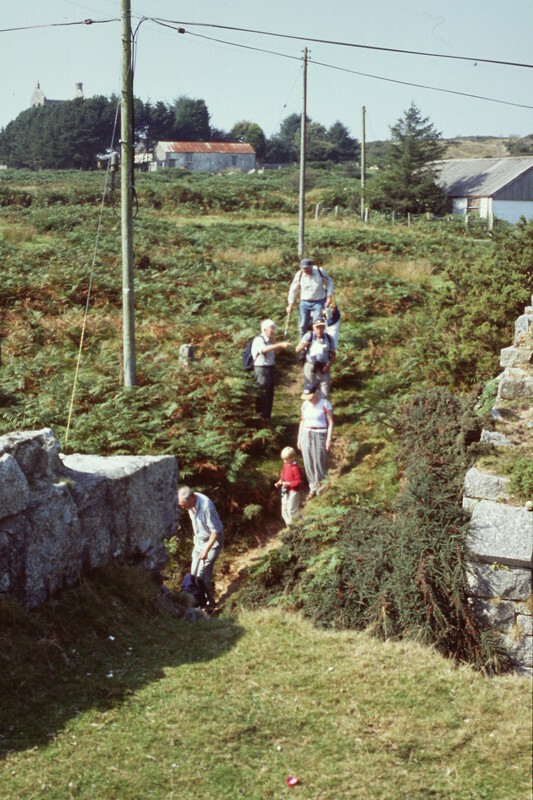 Here, the road level still rises to cross the track, where remains of the crossing keeper's hut and gateposts (with hinge) still remain in a ruinous condition. 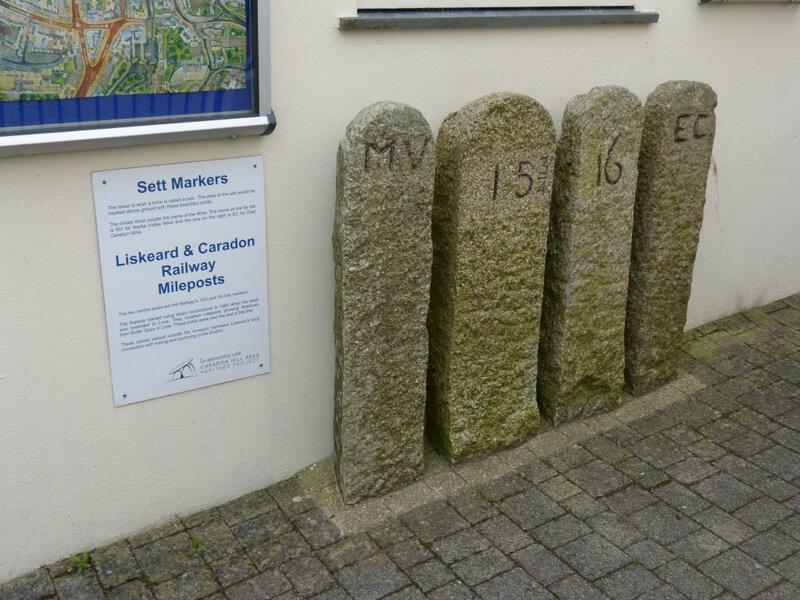 1602 Milepost 10 (from Looe Quay) on embankment south of Old Treworgey. 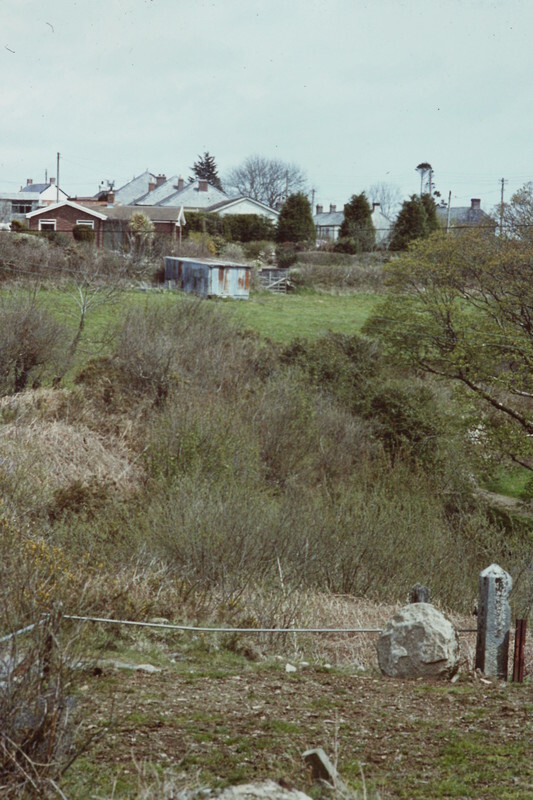 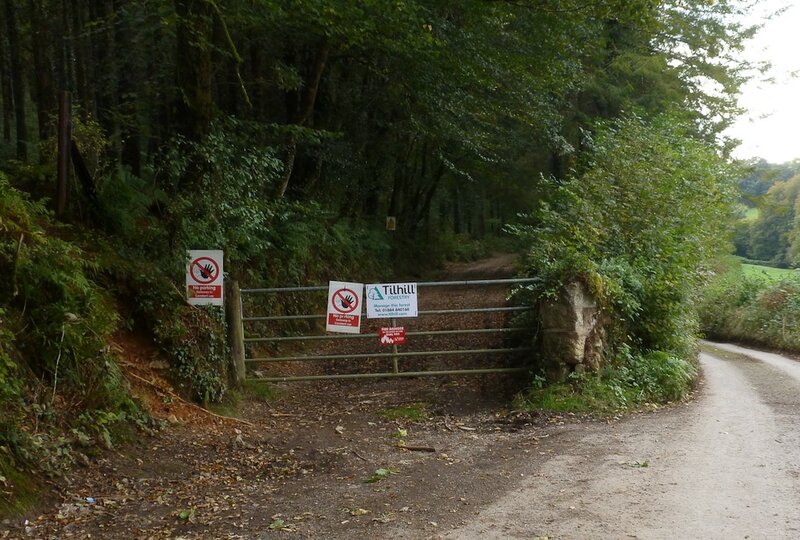 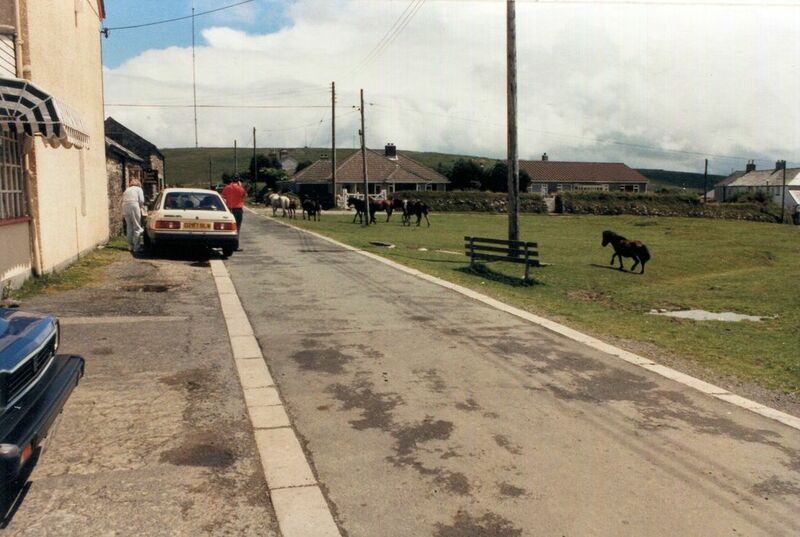 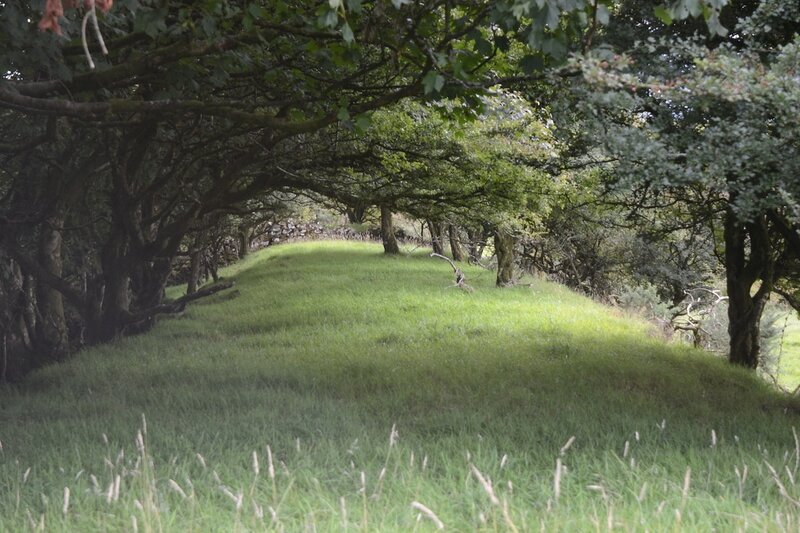 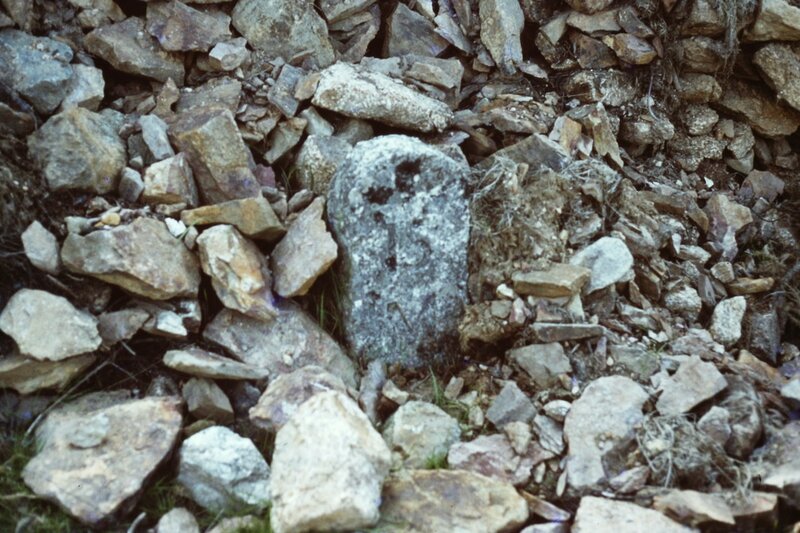 On private land, photographed with permission of the landowner. 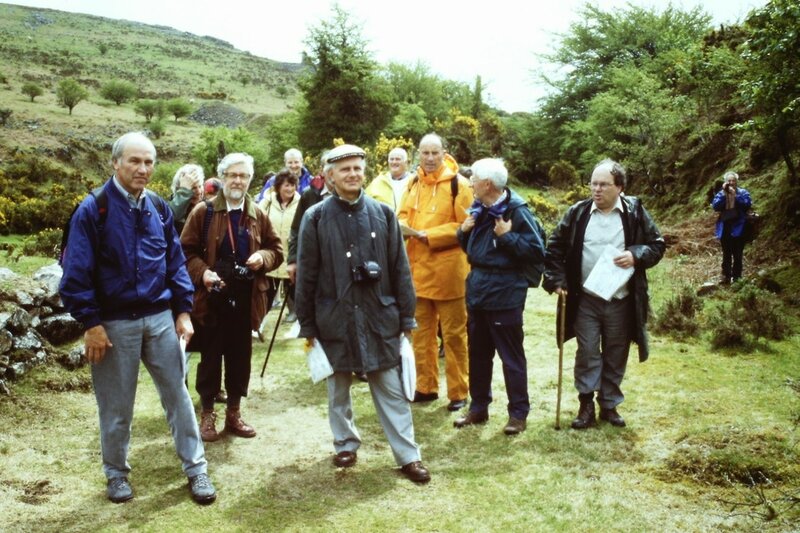 987 copy .jpeg Peter Murnaghan..
​Sid, a prolific supplier of pictures to this website, knowing that his passing was near courageously gathered together a few pictures of the L & C, his passion. 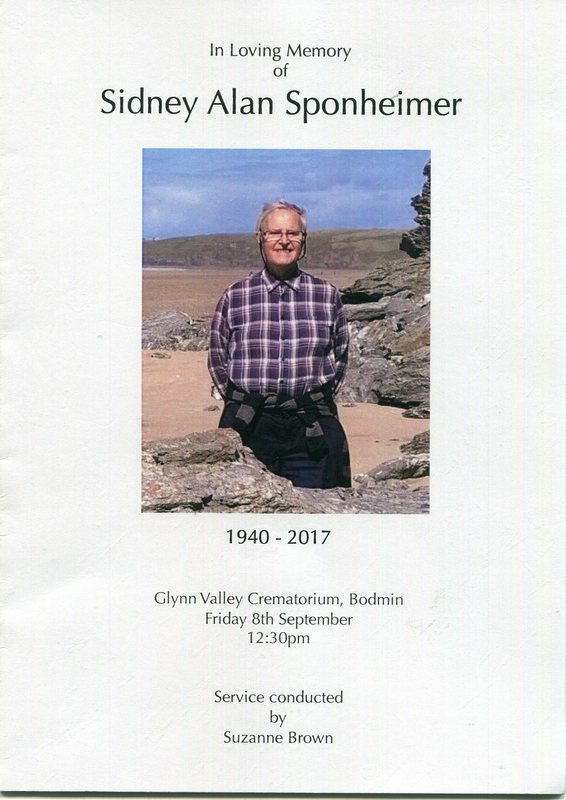 These follow in memory of our dear friend Sid who passed away on the 23rd September 2017. 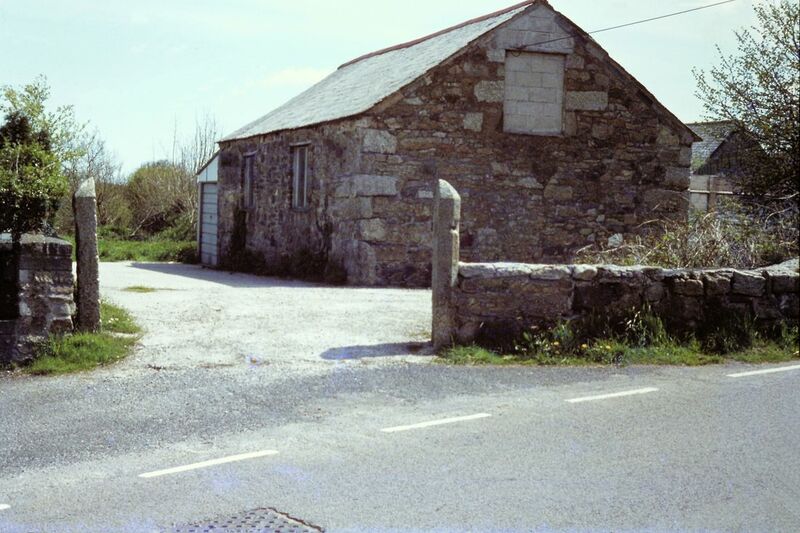 PM 1703 The former Coal Store at St Cleer is now in use as part of a house. 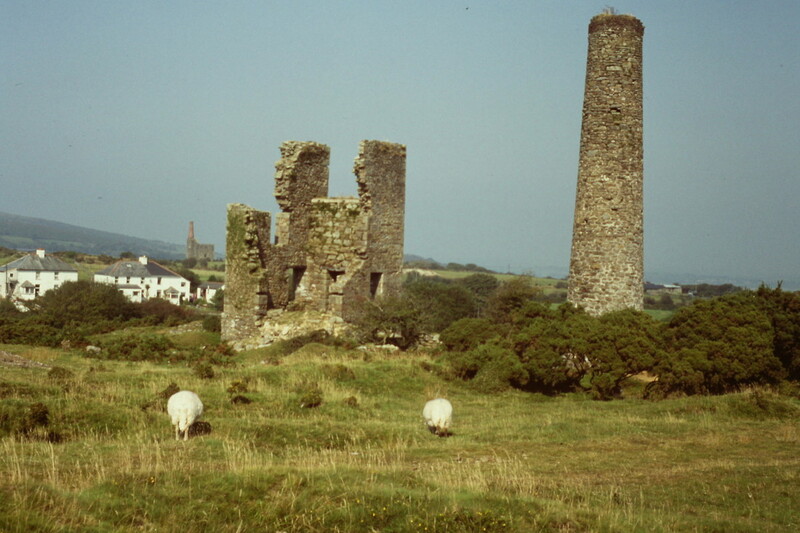 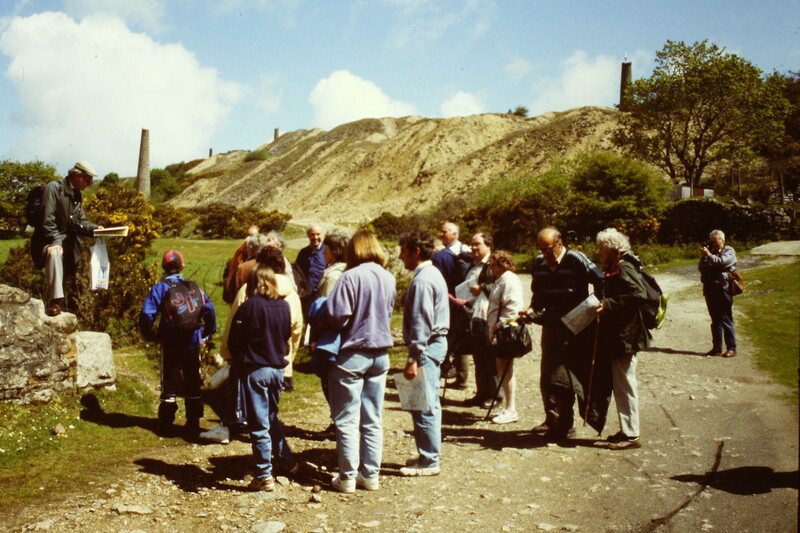 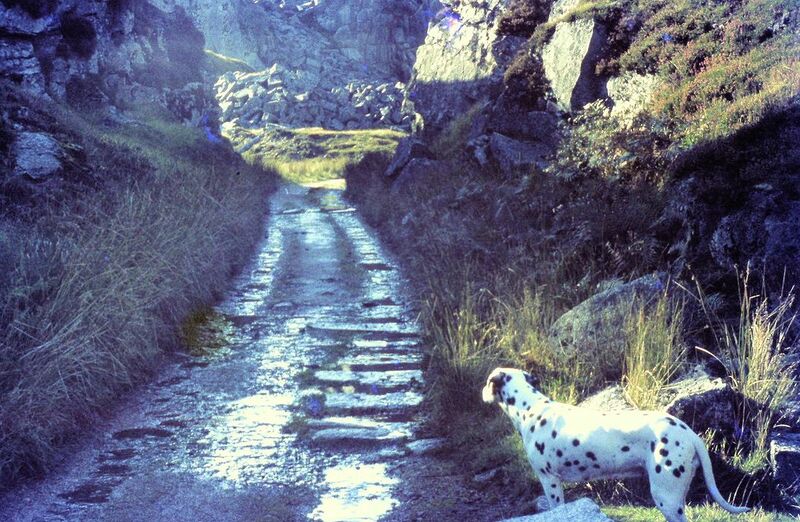 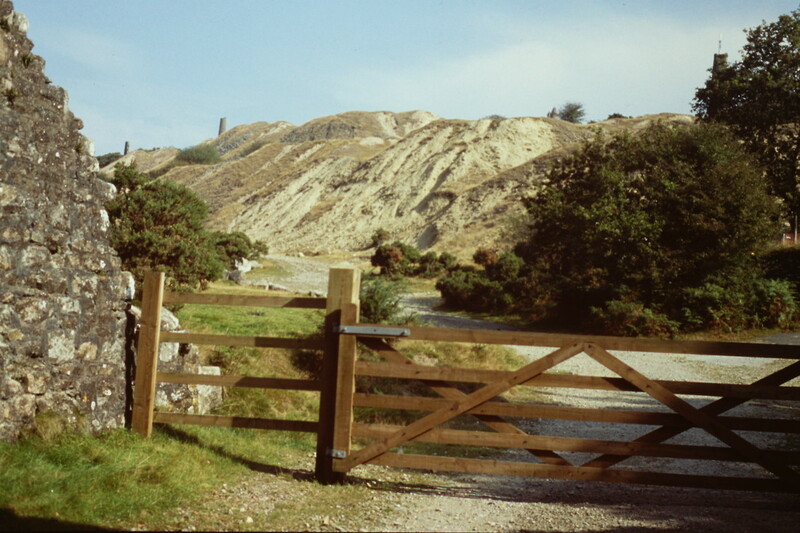 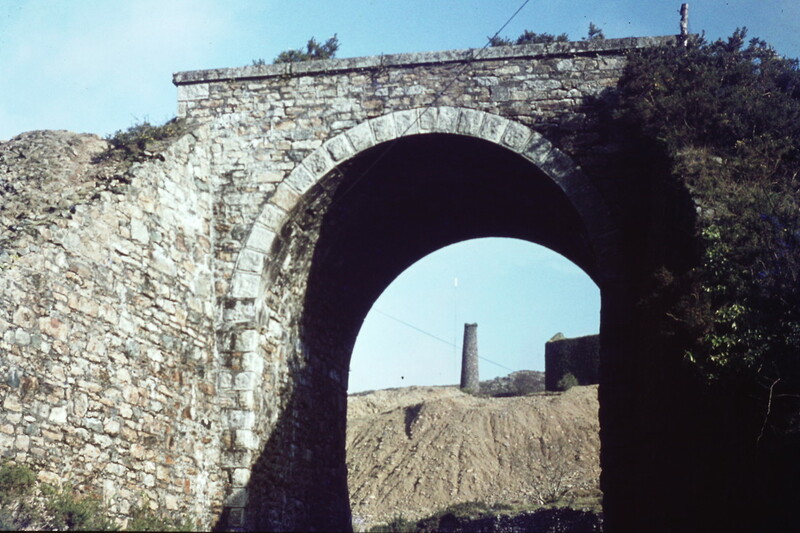 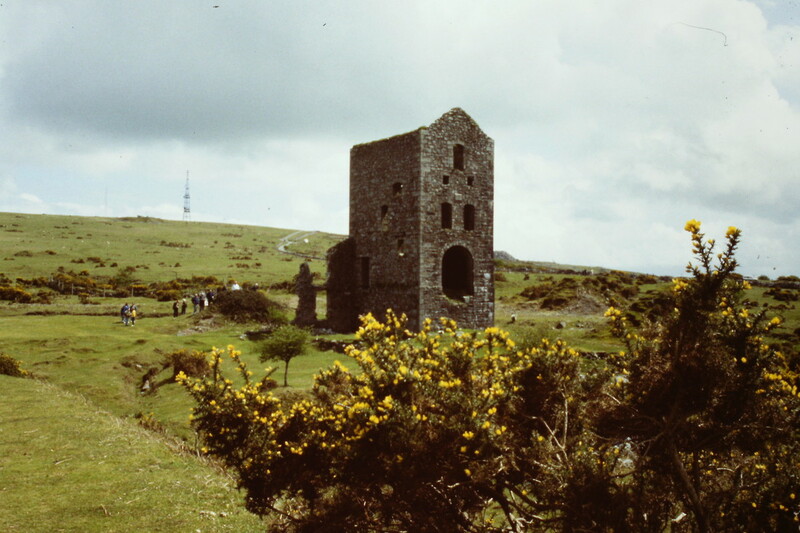 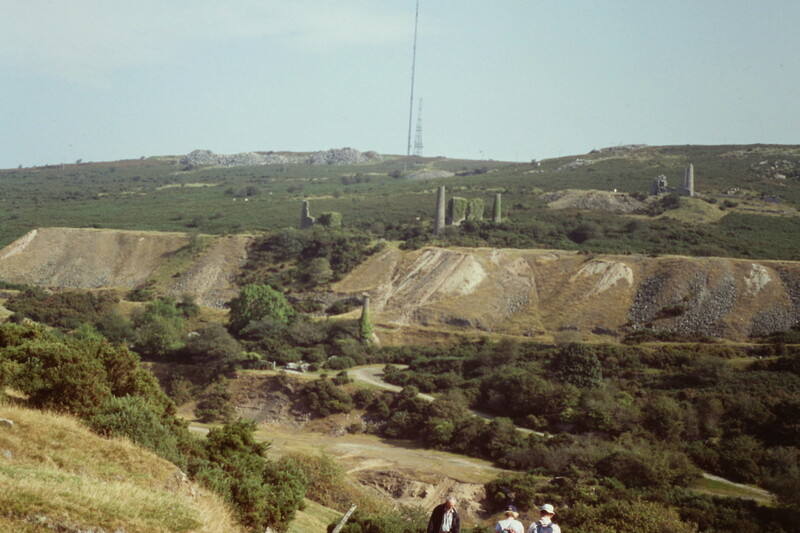 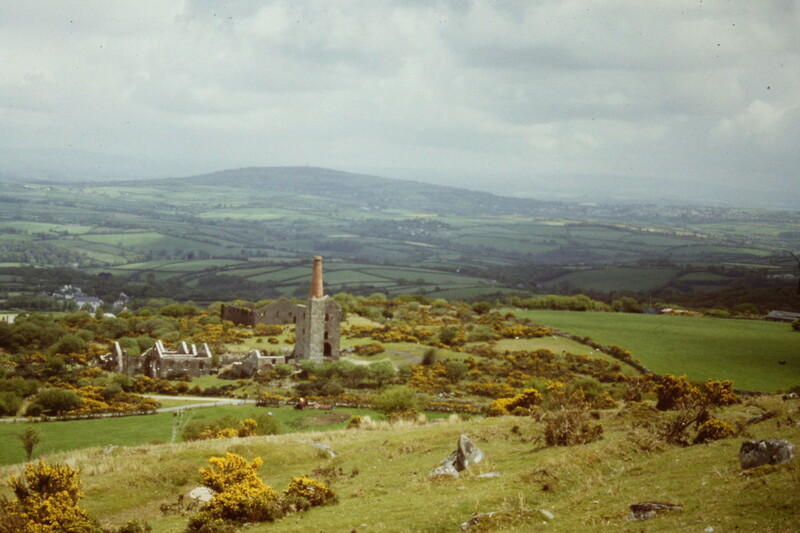 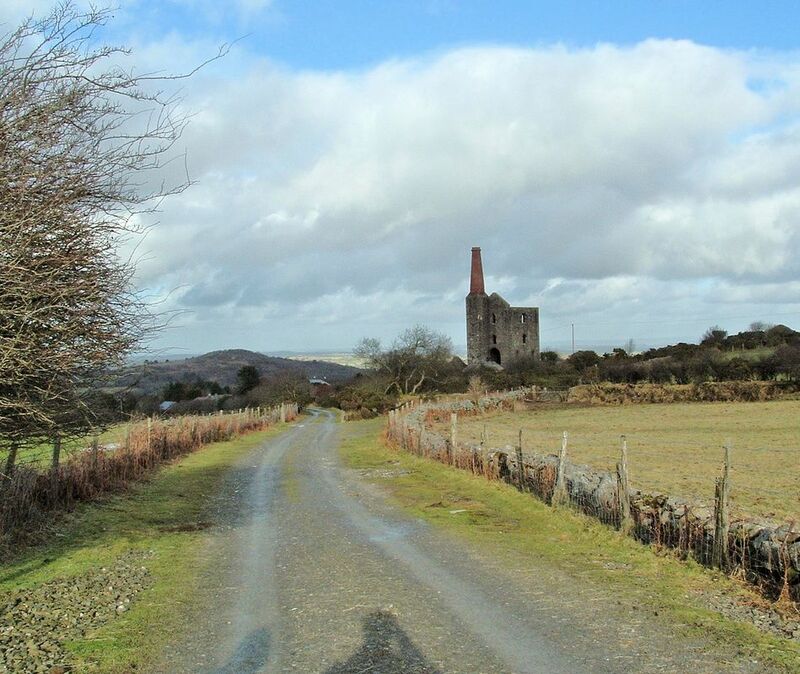 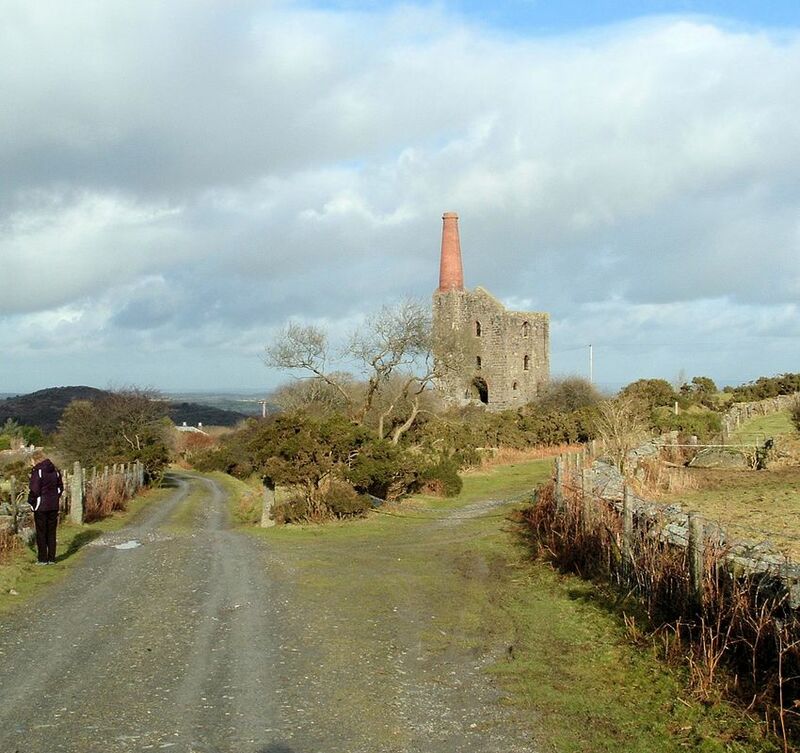 Wheal Jenkin Mine. 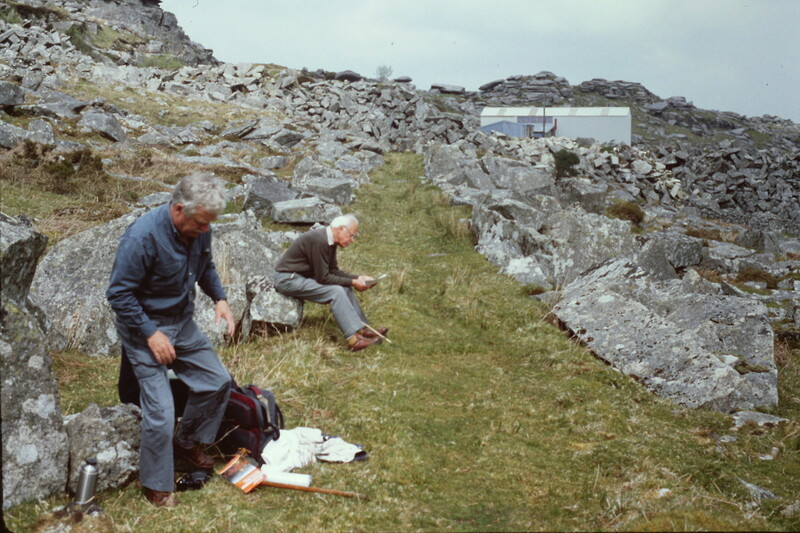 Alan Harris collection. 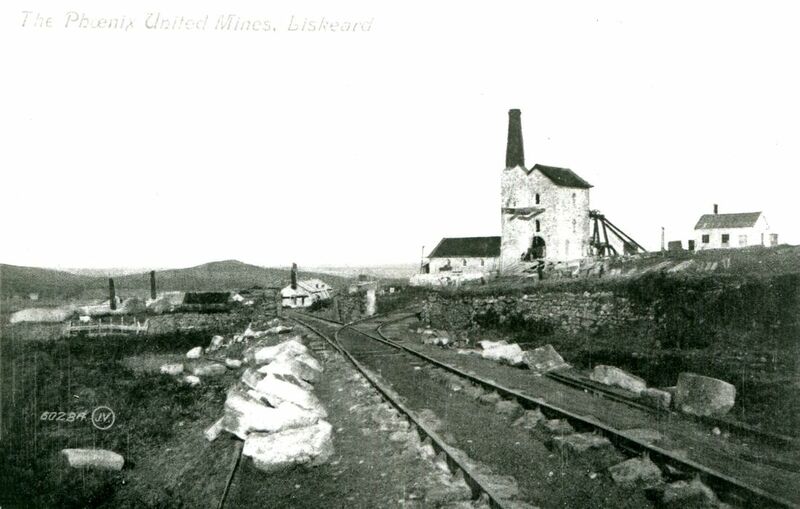 img319b- Phoenix United Mines Liskeard - a postcard from the Alan Harris Collection This was north of Minions and was productive from 1850 to 1884. 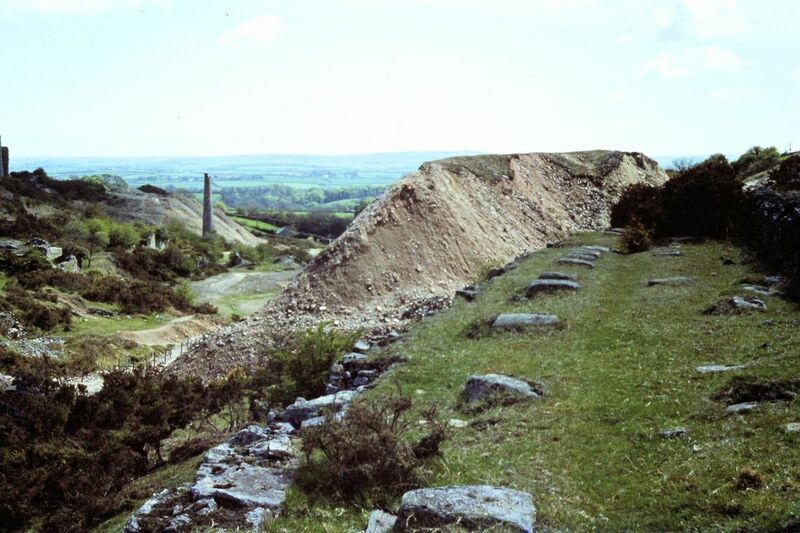 The peak year being 1863, when 5698 tons of copper ore were produced. 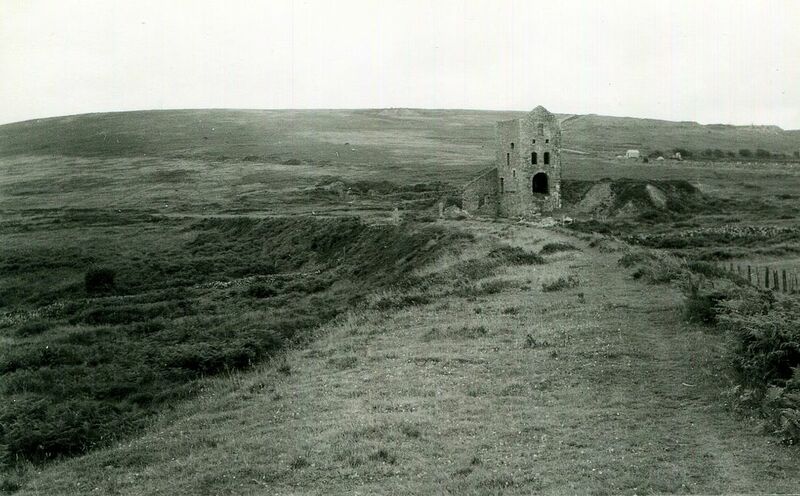 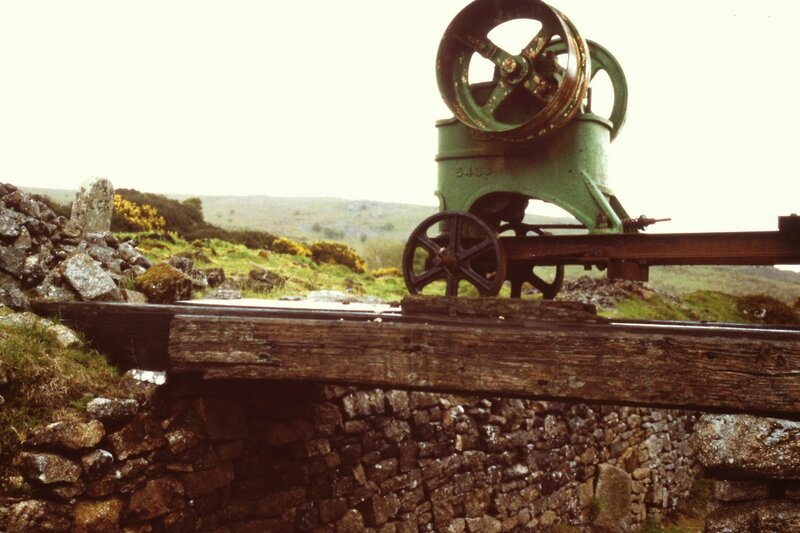 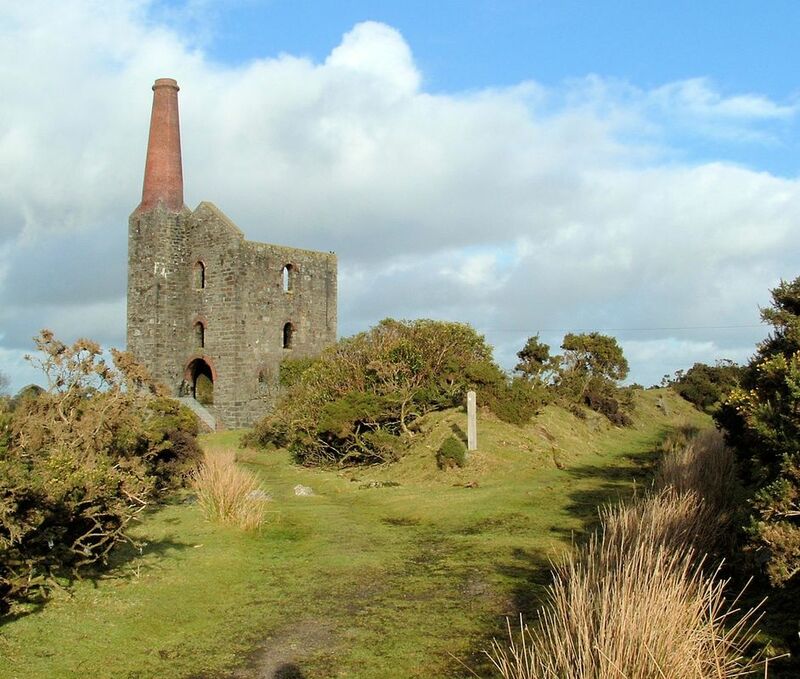 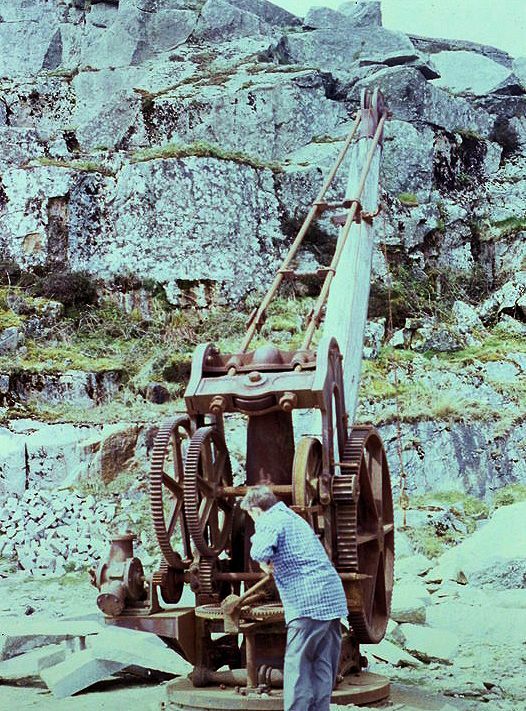 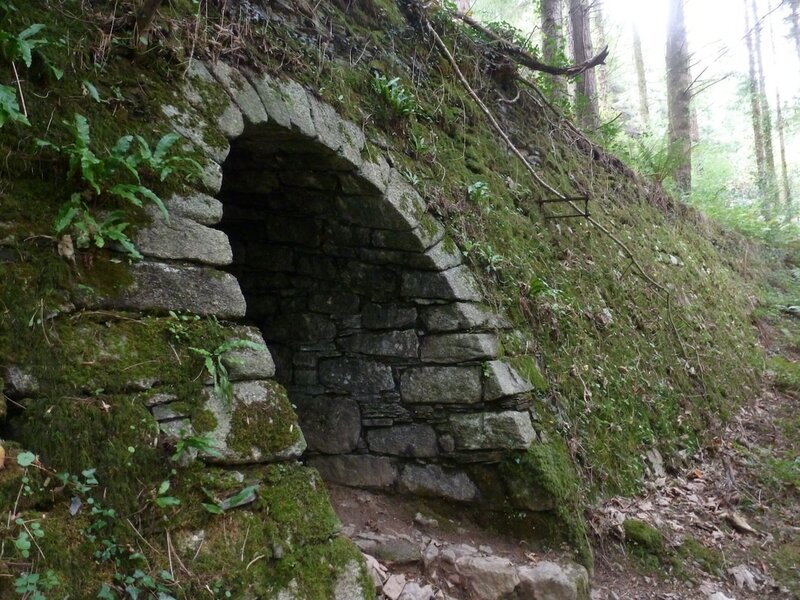 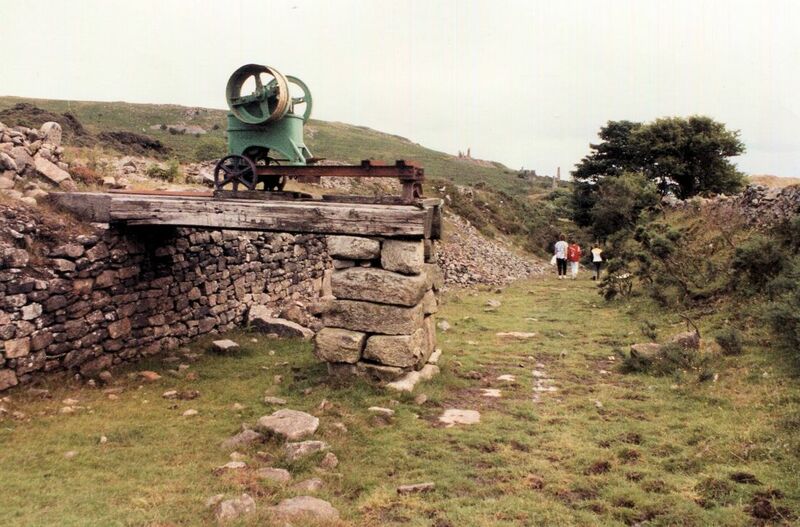 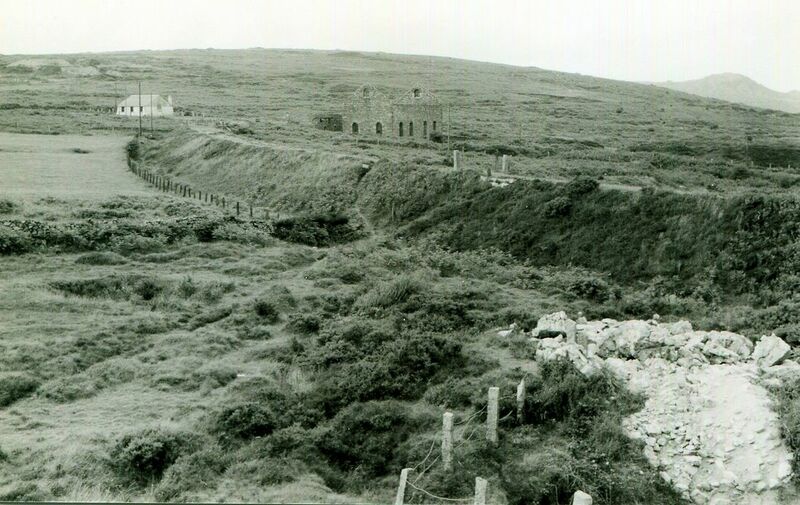 This mine employed 180 men, 80 women and Four Pumping Engines in 1854. 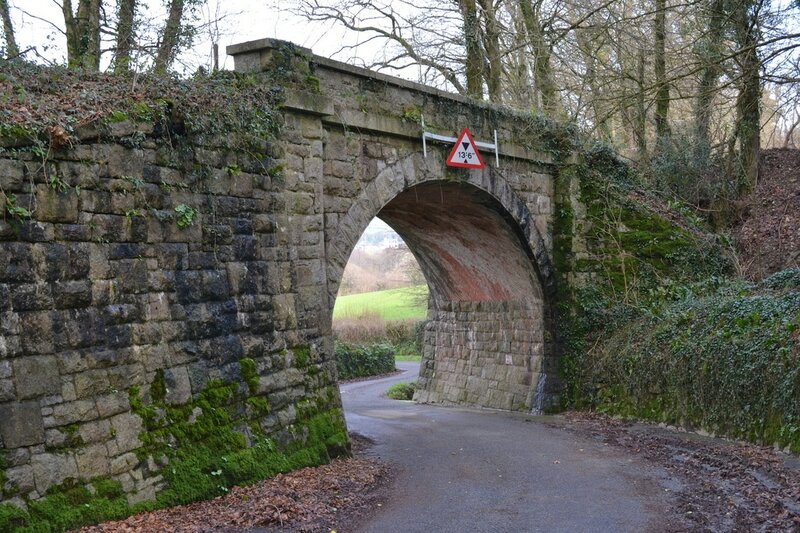 It closed in 1898, was reopened in 1907, closed again on the outbreak of the First World War and thereafter there were only three trains per week north of Moorswater. 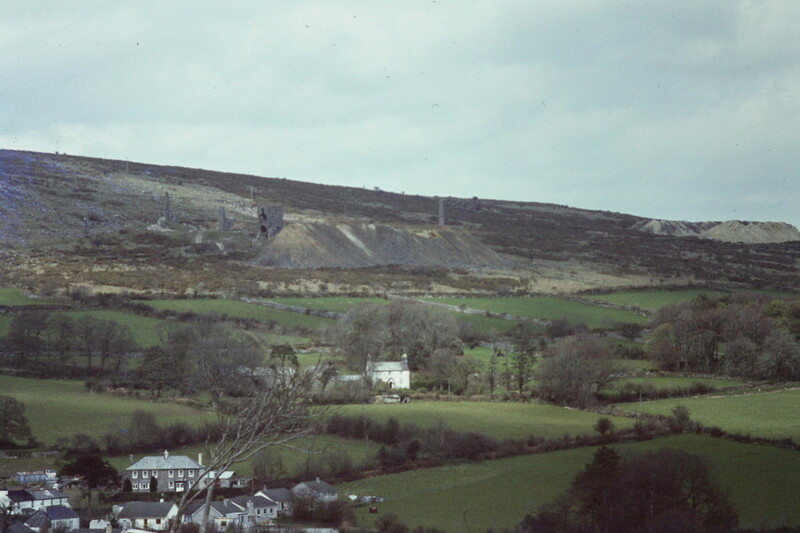 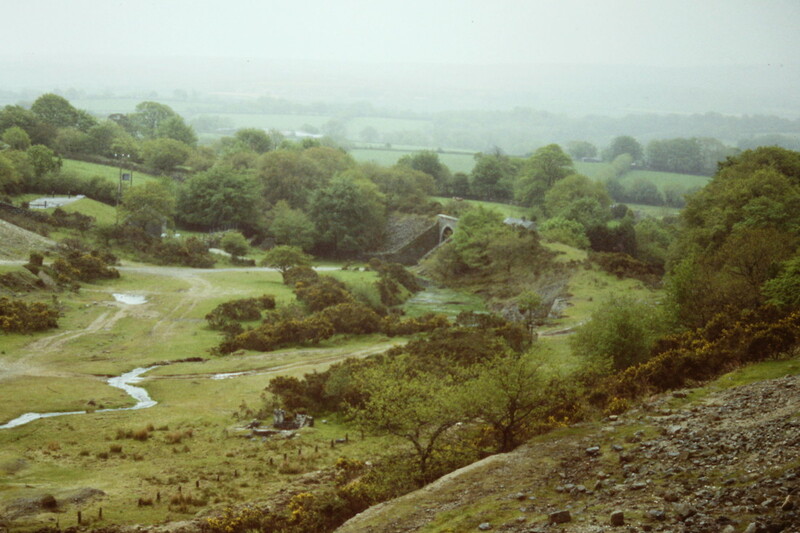 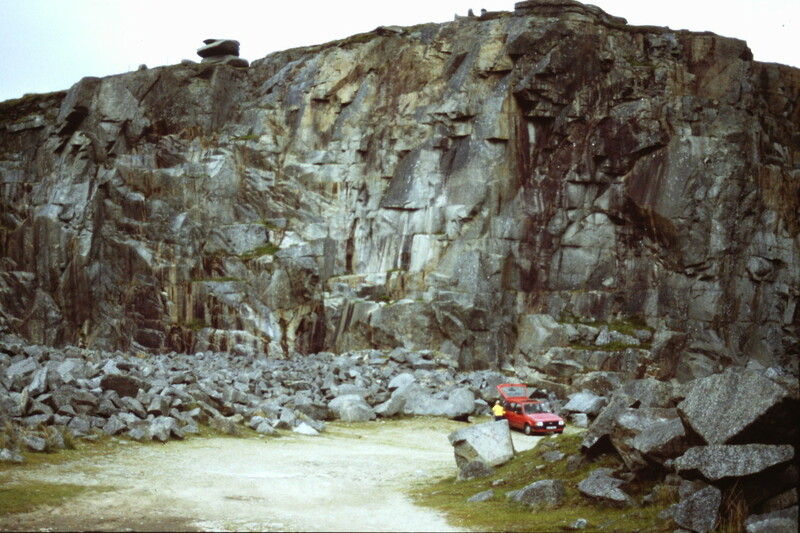 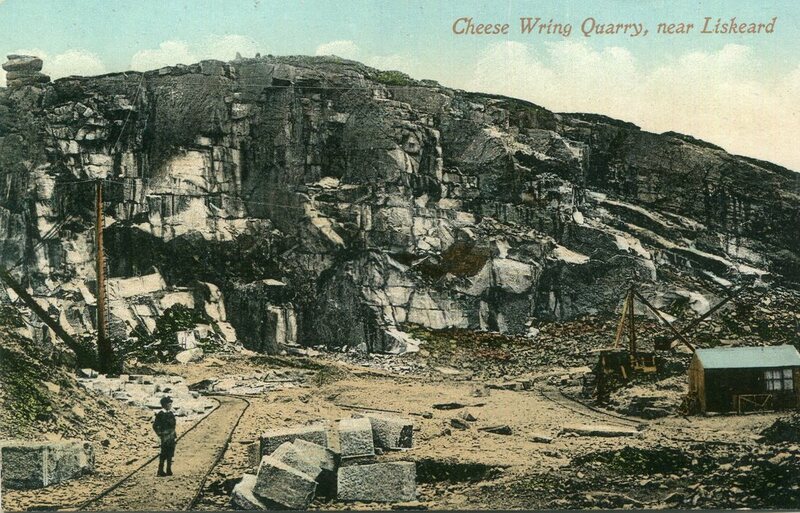 This picture is taken from the top of Cheesewring Granite Quarry looking back south towards Minions. 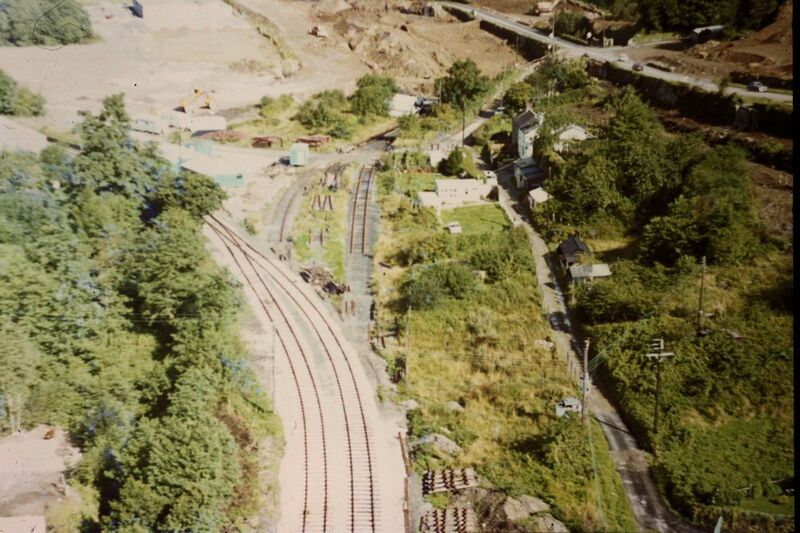 There are three different arms of the railway in view in this picture. 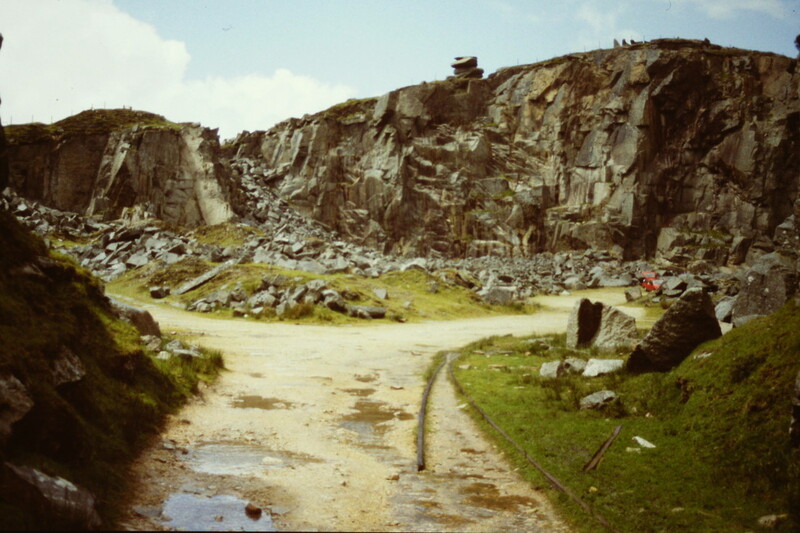 Starting from the quarry floor in the bottom centre, there is still a section of rail in place, after 100 years of disuse. 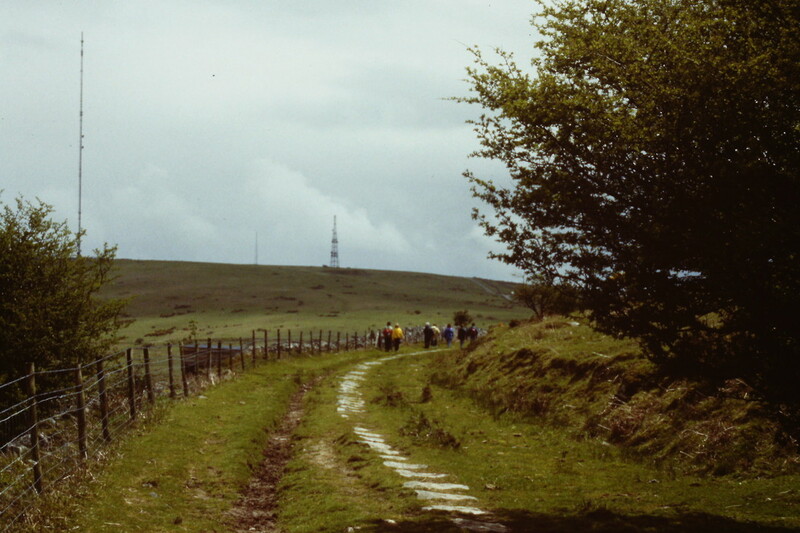 It's just about visible in the photograph before the sinuous track snakes its way, first to the left and then to the top centre of the picture towards Minions. 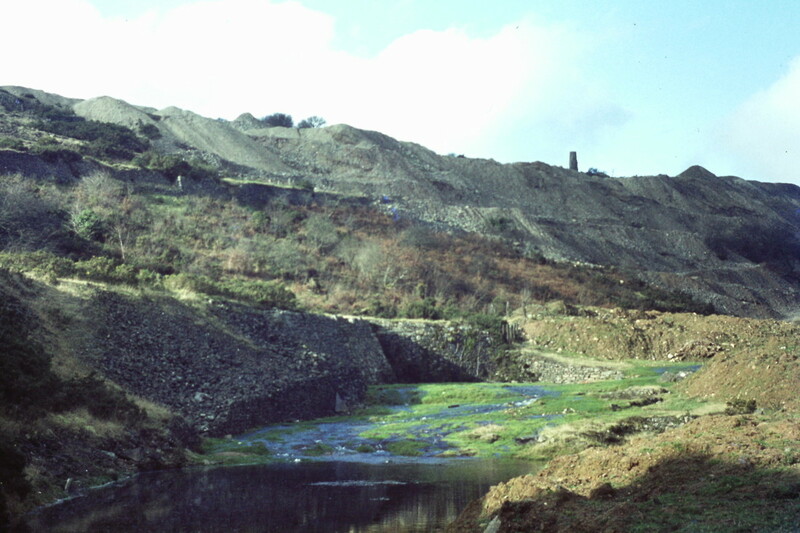 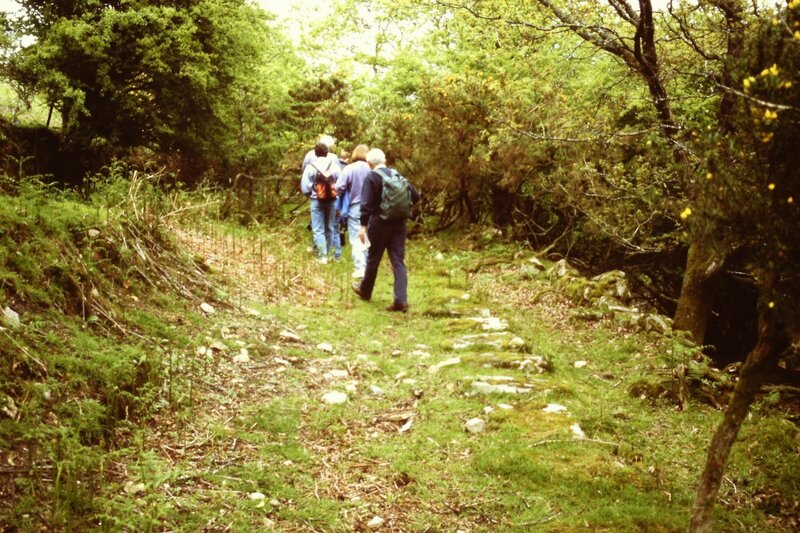 This is the 1871 branch line built to serve the expanding quarry. 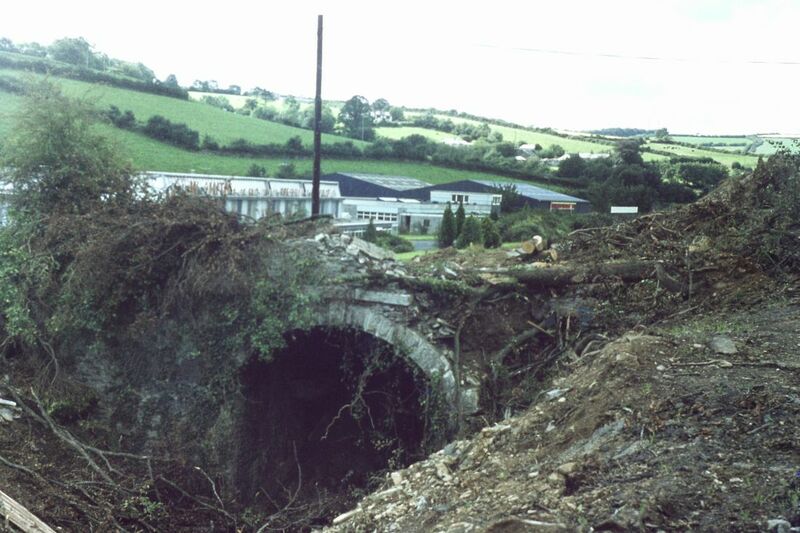 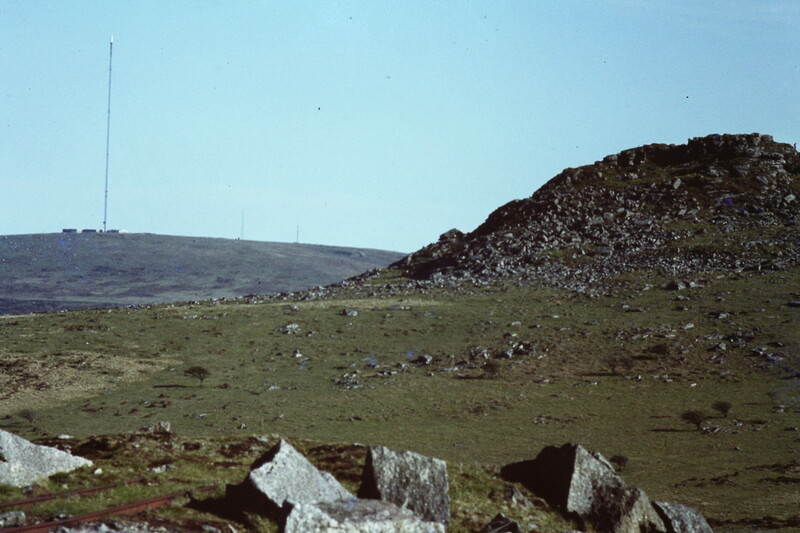 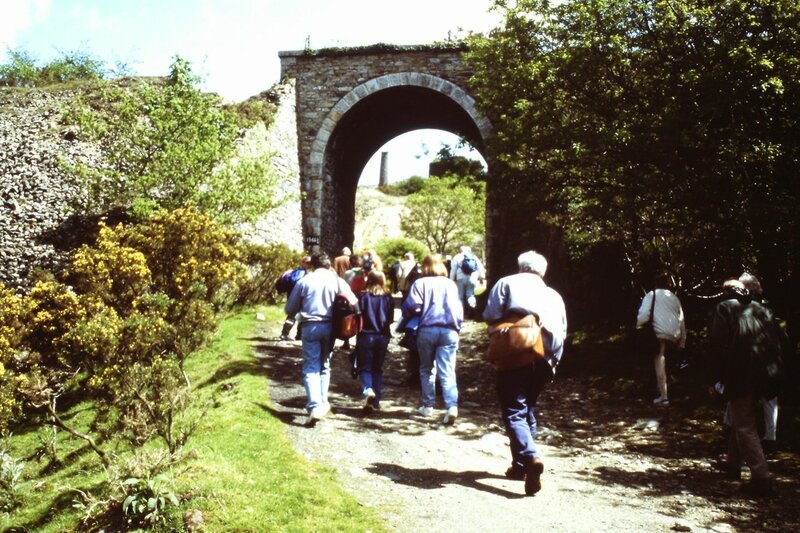 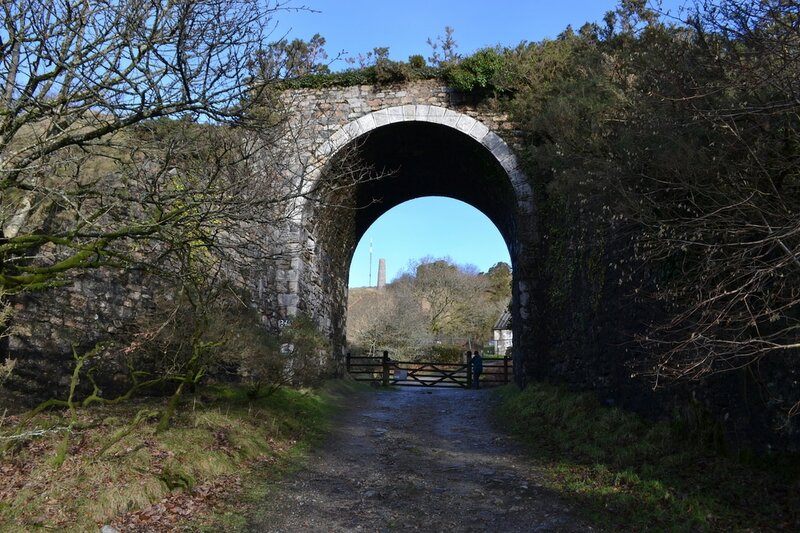 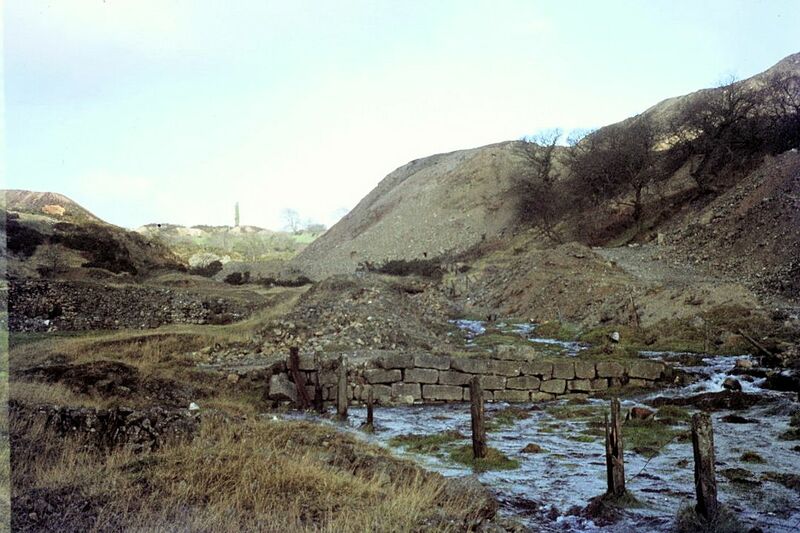 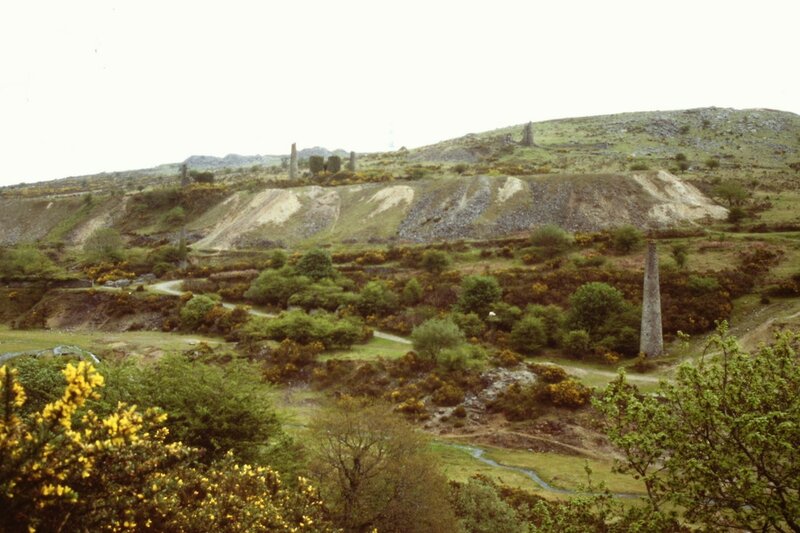 Part way along its course are the building remains of Stowes' Shaft, which was linked by a inclined tramway (difficult now to spot) which ran in a straight line to Pheonix United Mine, down in the valley to the left. 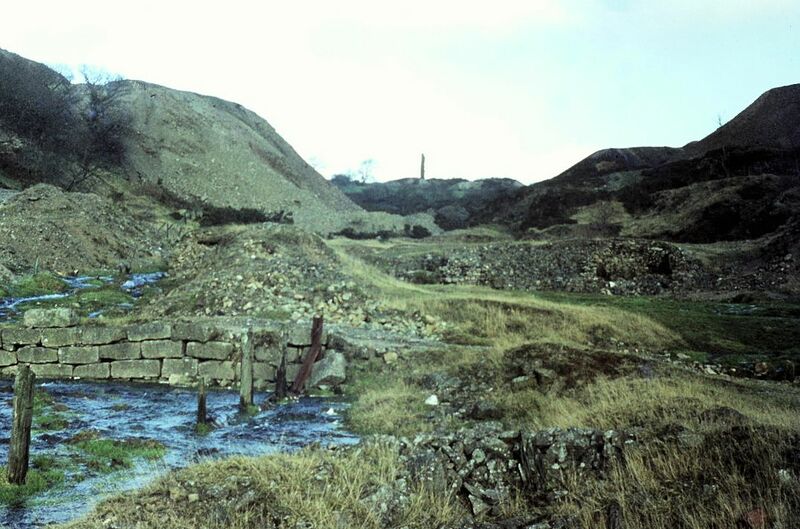 This old mine shaft has opened up (top centre) and now severs the track bed. 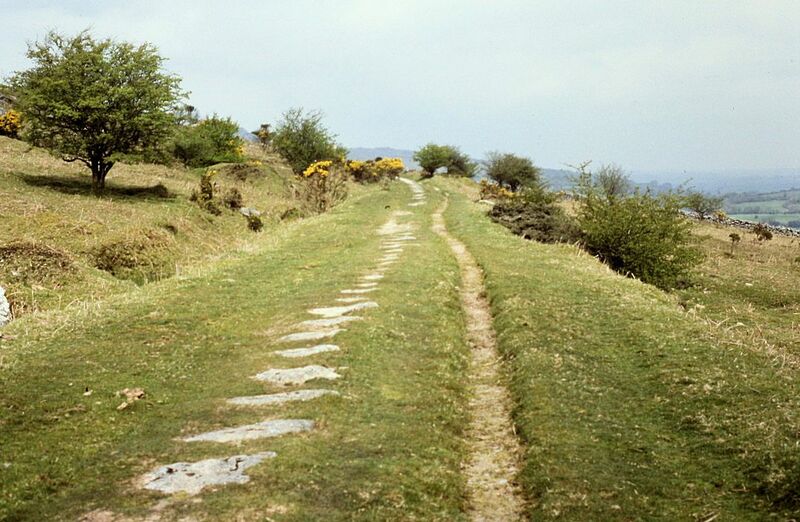 Over to the right is the earlier 1844 alignment that has continued across the moor to the long established moorstone workings on the slopes of Stowes' Hill. 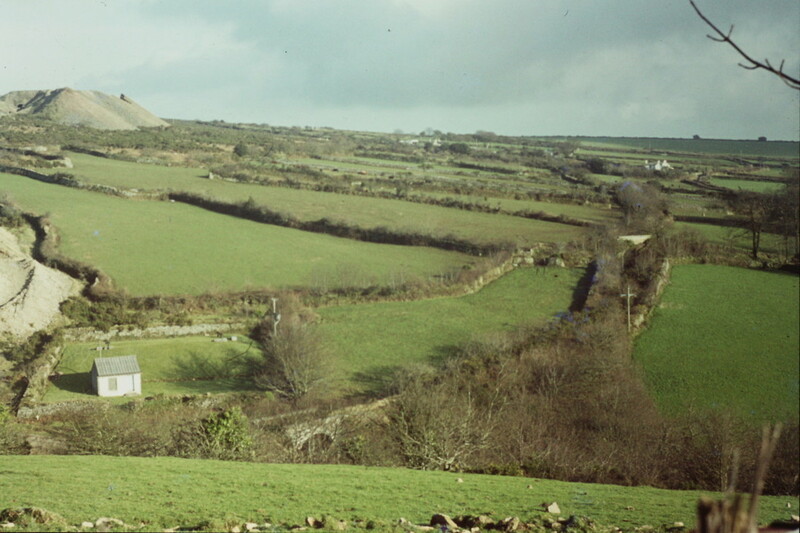 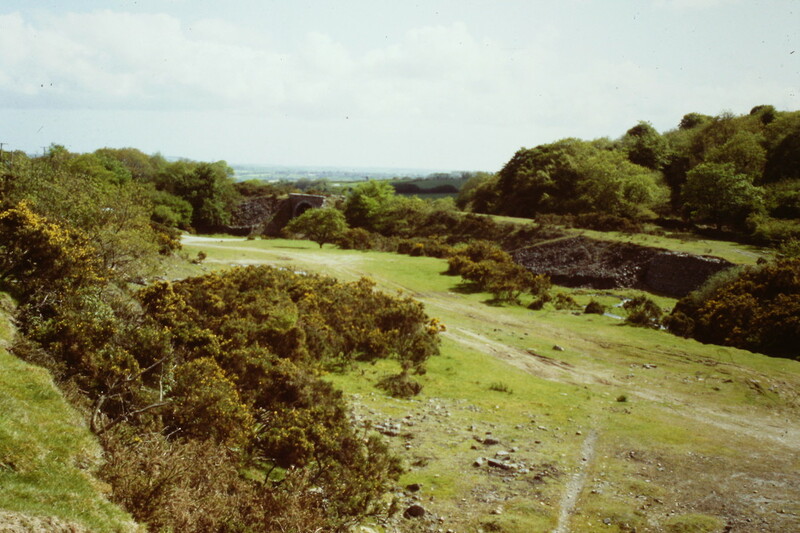 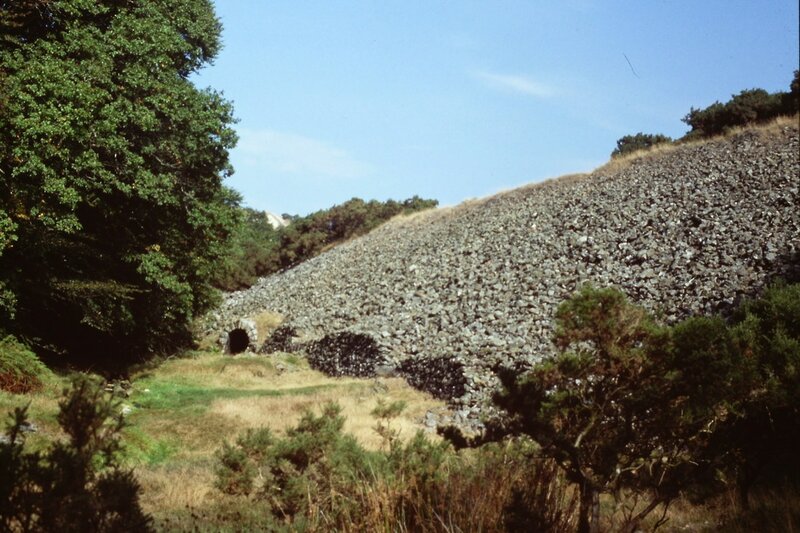 This alignment was curtailed the quarry expanded and was superseded by the 1871 alignment. 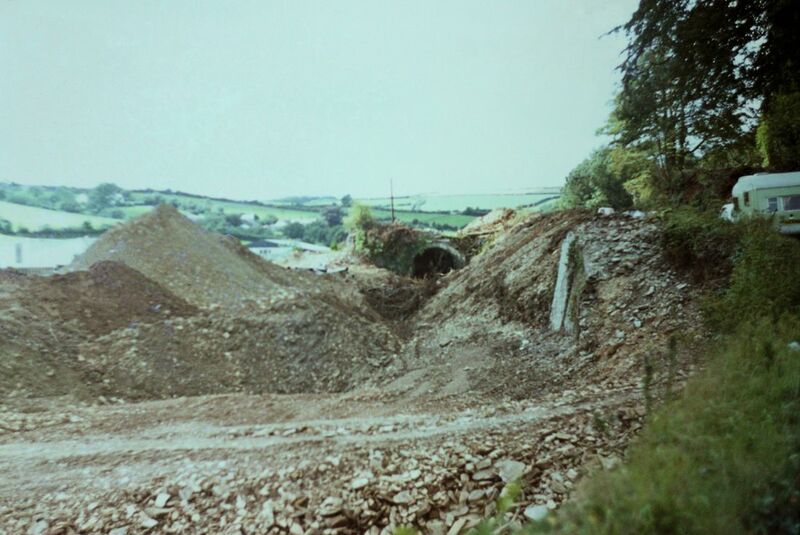 In the shadow at top right is a siding from this earlier railway, which led off in a cutting to further moorstone working on the south slope of Stowes Hill. 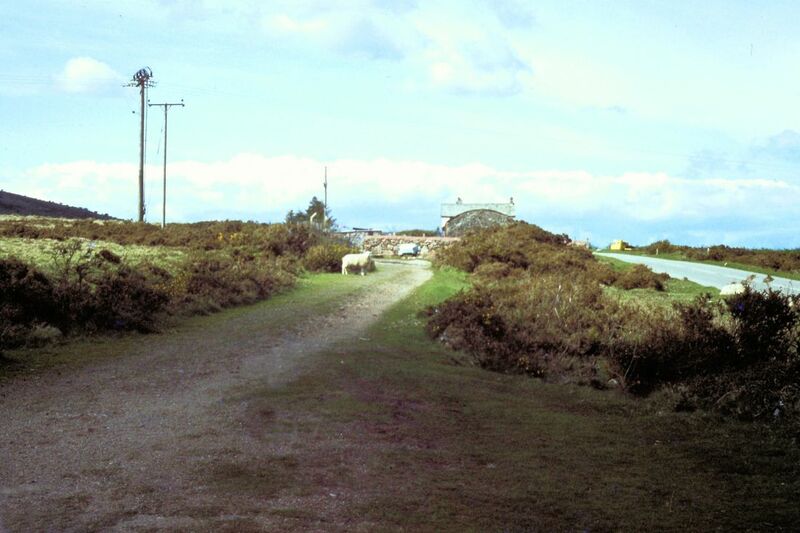 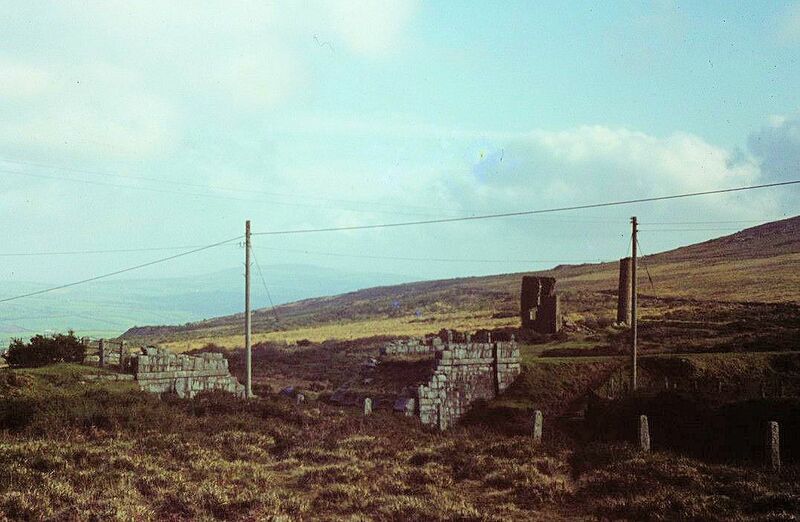 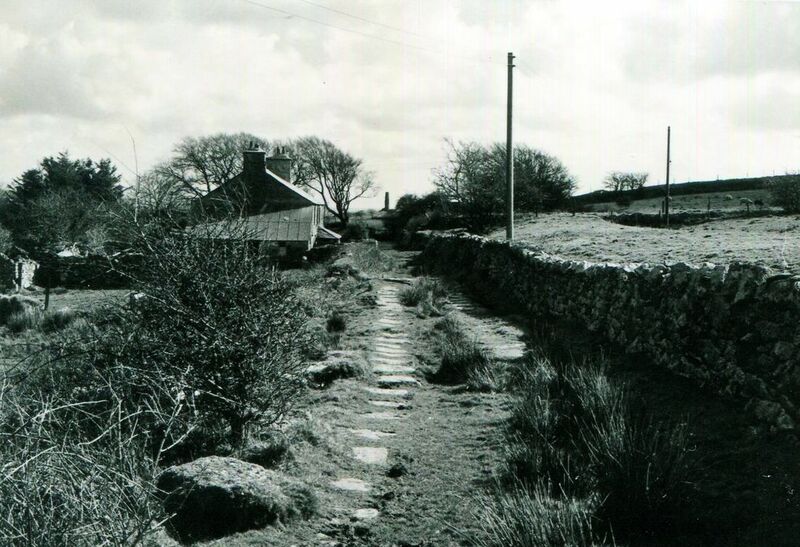 And finally, over on the far left, at the edge of the sunlit moorland, is the Kilmar Railway of 1858 heading north. 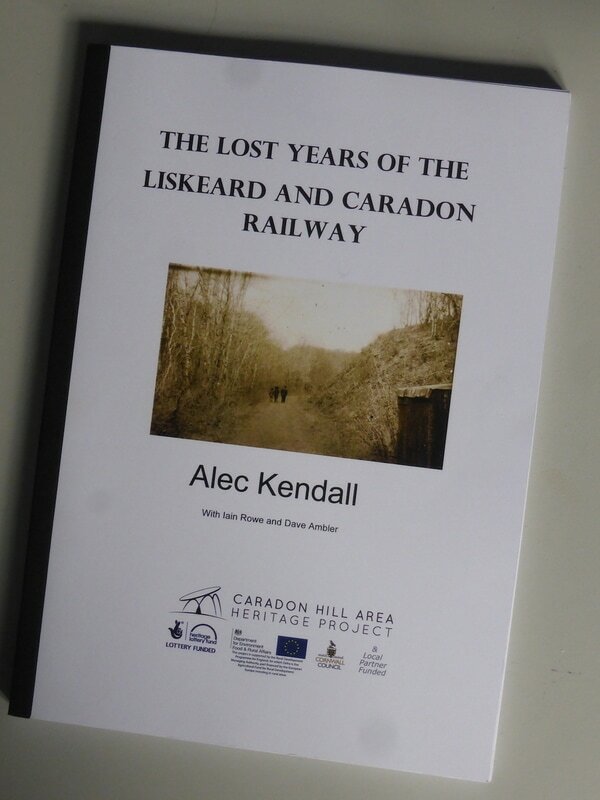 A picture of Alec Kendall's book The Lost Years of the Liskeard and Caradon Railway. 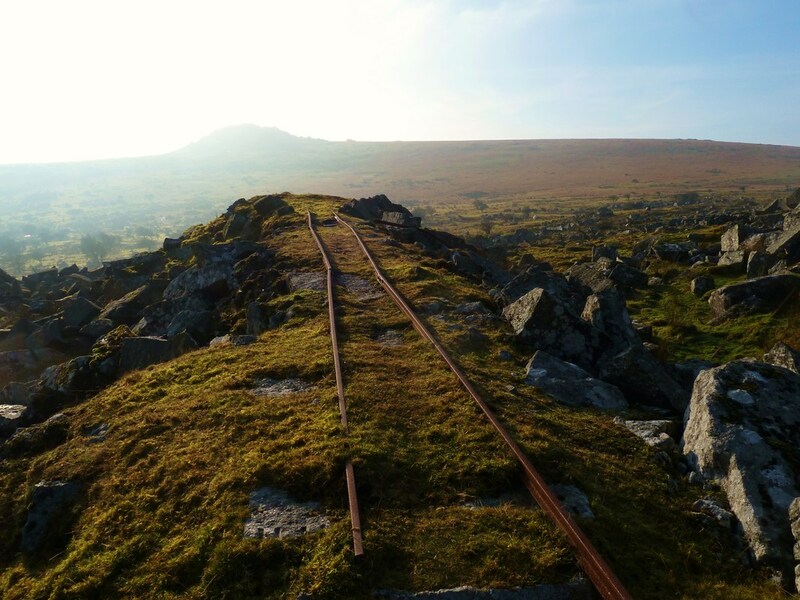 This 148 page book was produced for the Caradon Heritage Project and covers the period of Great Western Railway ownership of the line from 1909 until the formal act of abandonment in 1931. 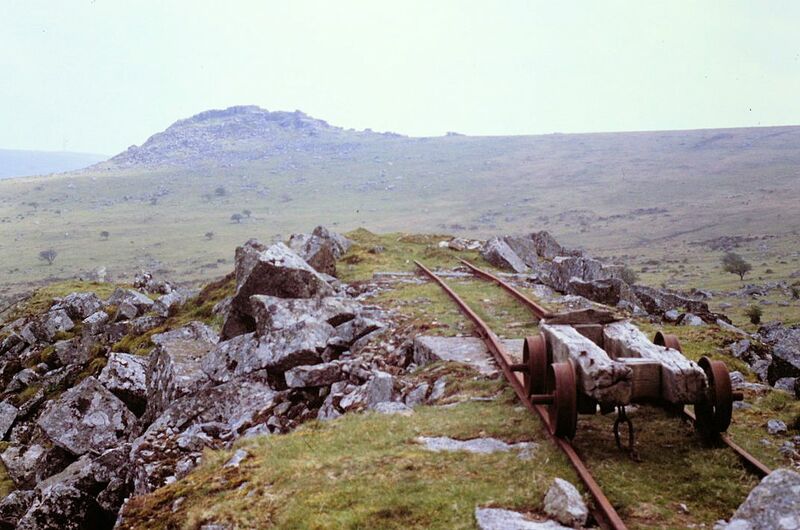 The book is the result of three years' exhaustive research into the twilight years of this railway, when hard facts were hard to come by. 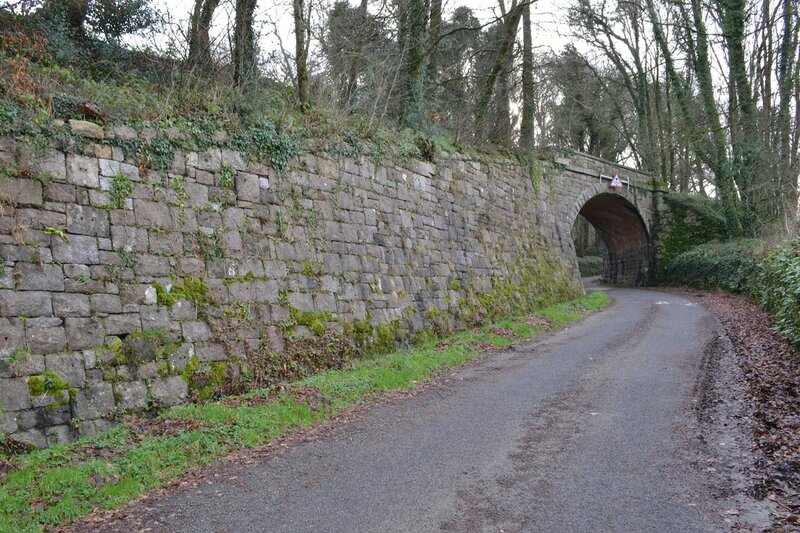 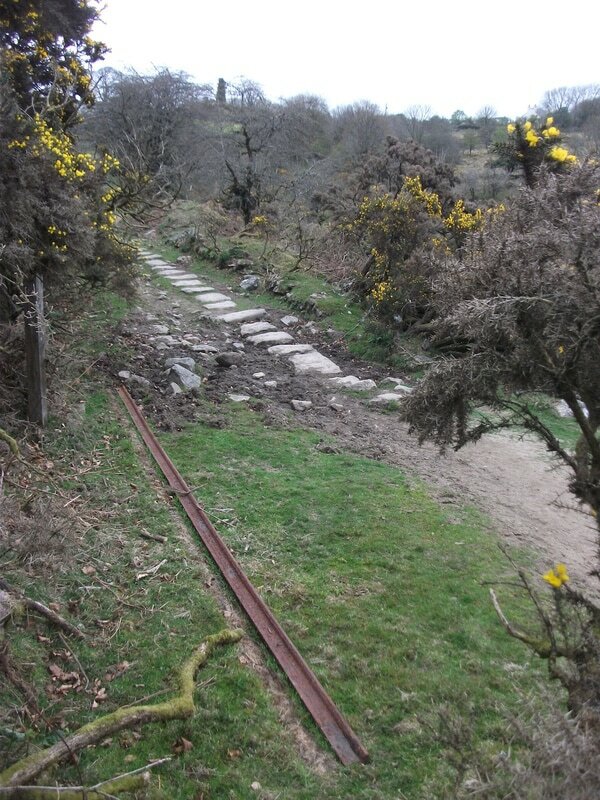 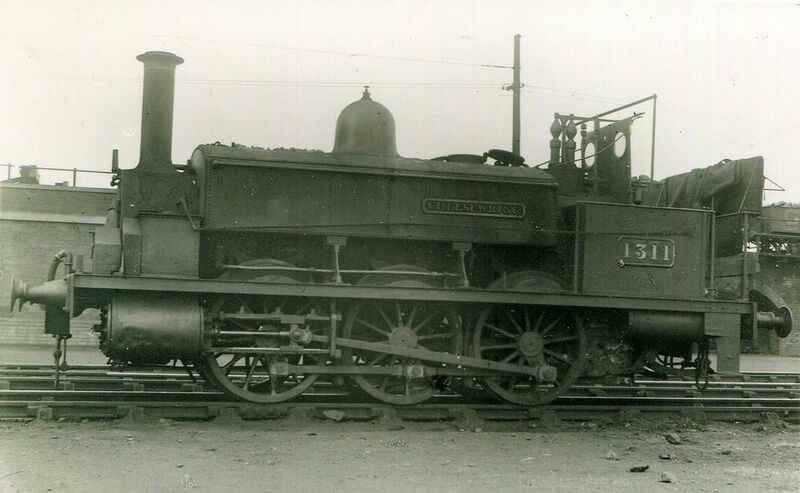 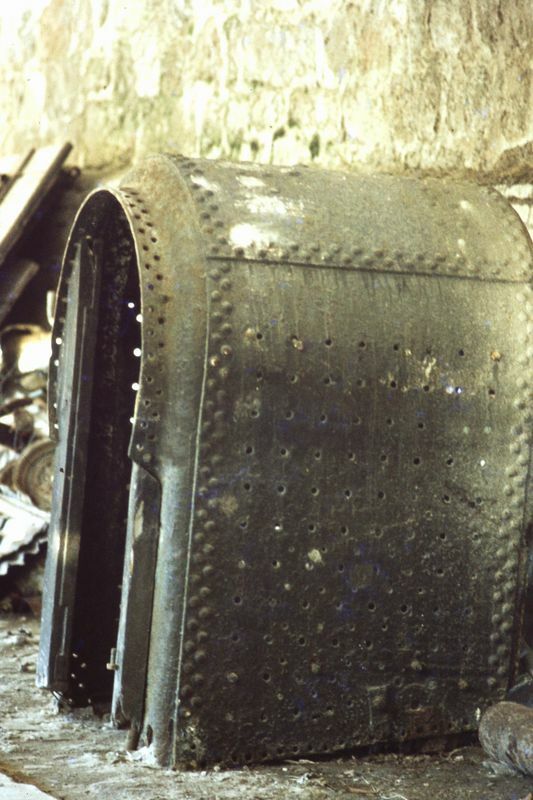 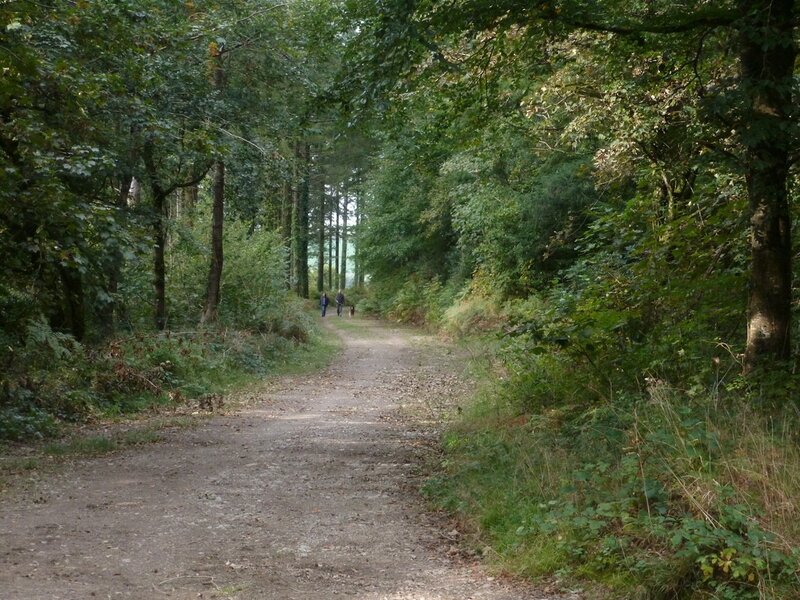 What happened at the closure in January 1917 and what became of the track and equipment? 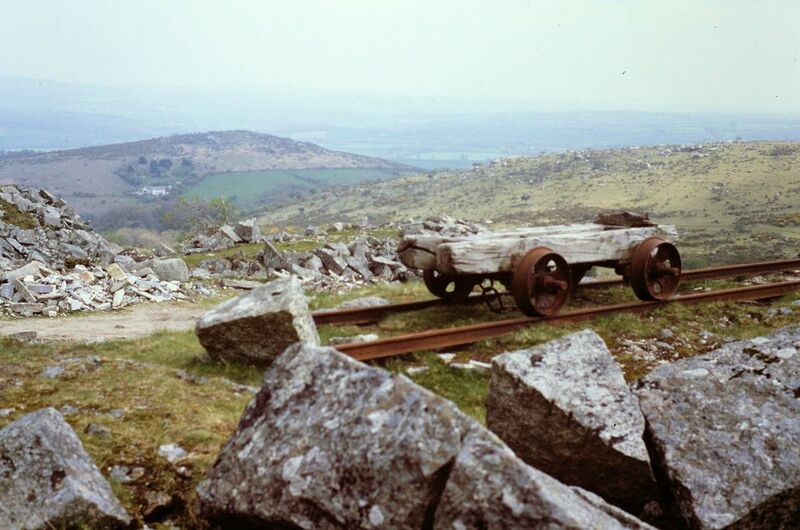 Alec Kendall has delved into contemporary accounts of the Great Western Railway and photographs and other documents from a variety of sources to come up with a very readable account of this shadowy period after the line's boom years. 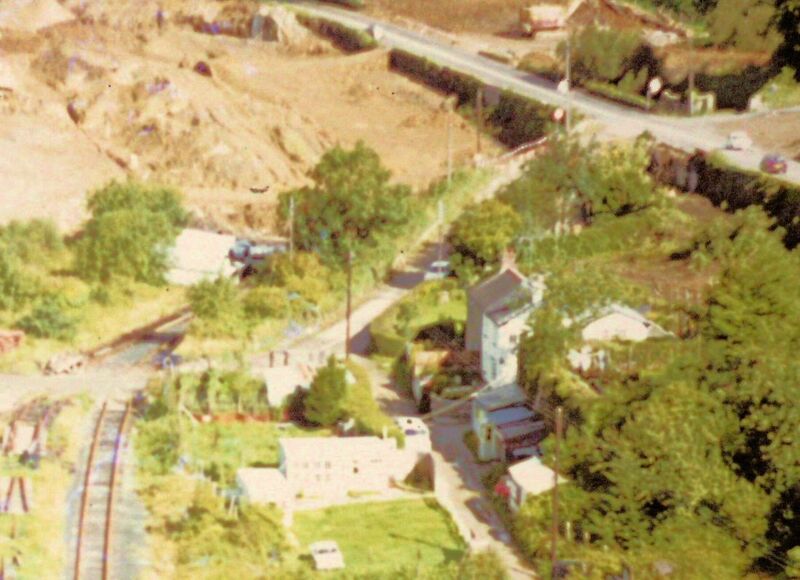 This well illustrated book was published in 2013 for £12. 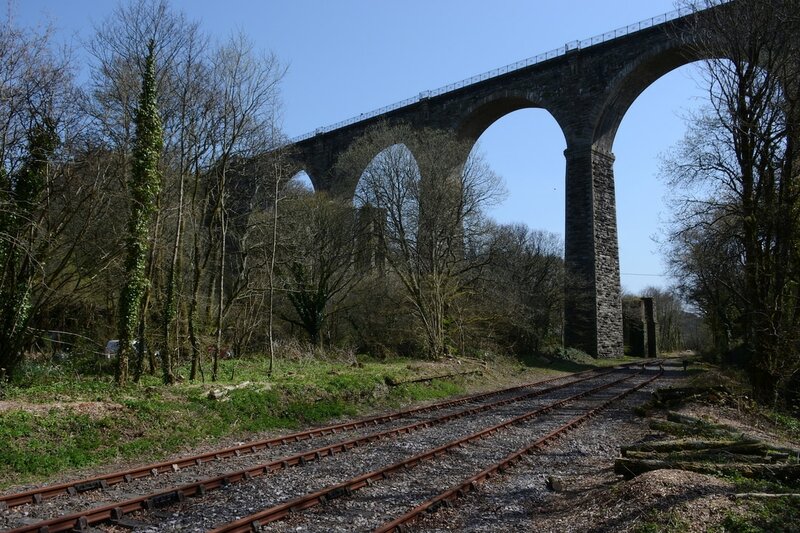 Peter Murnaghan has a number of copies, which he is prepared to make available to members and supporters of the Cornwall Railway Society for the bargain price of £9, post free. 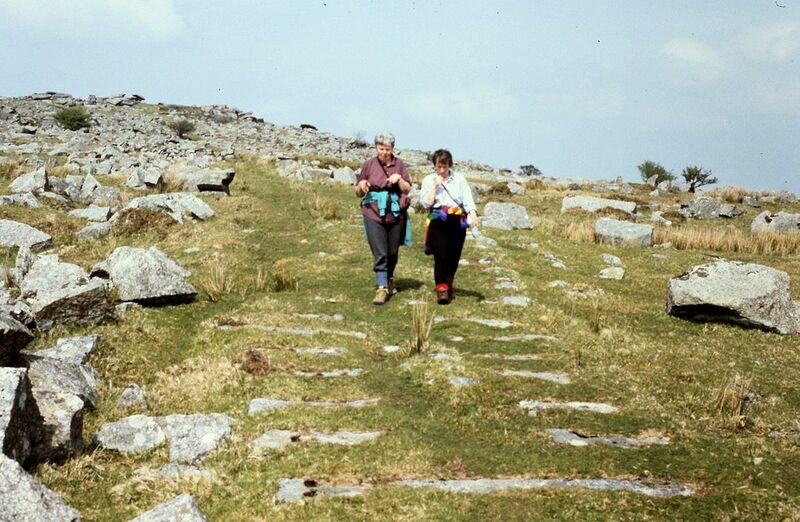 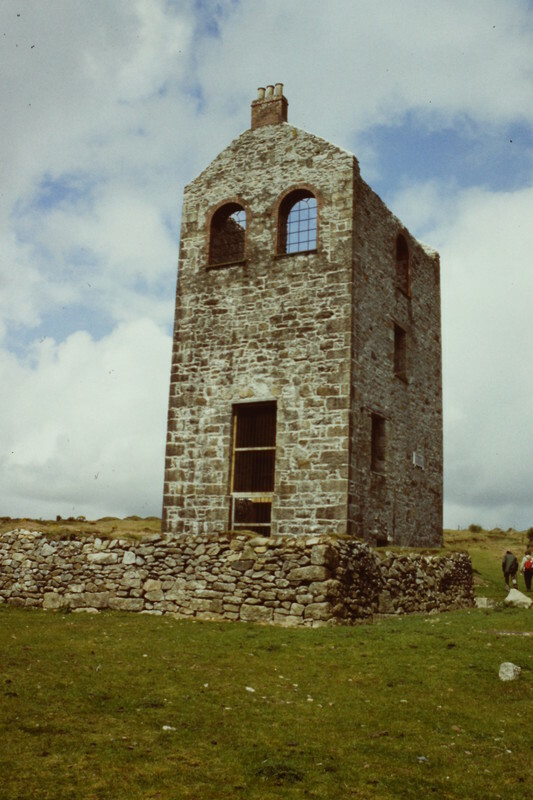 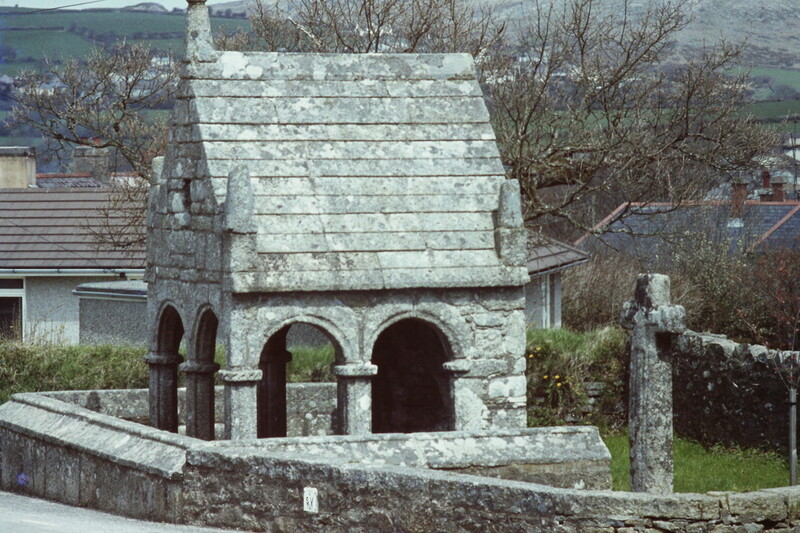 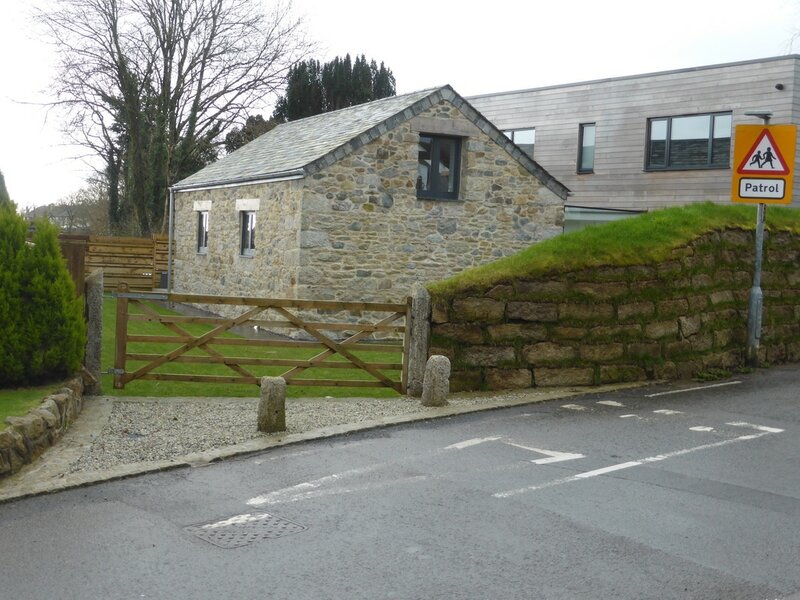 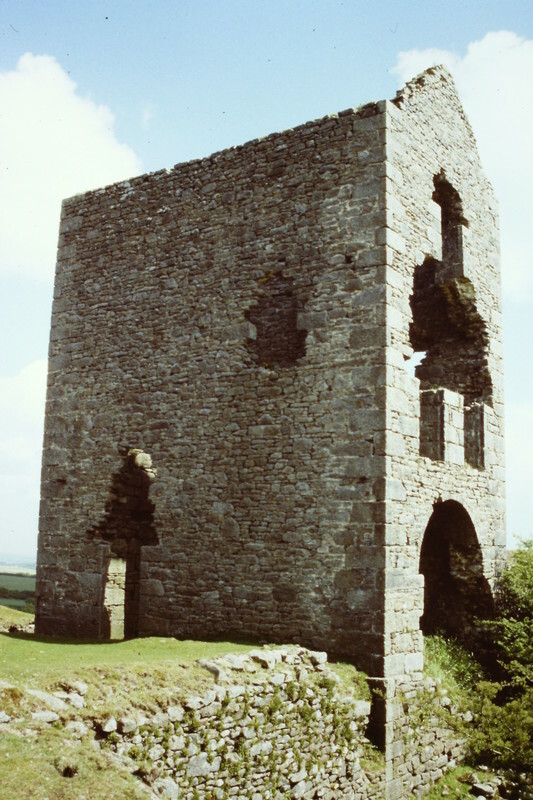 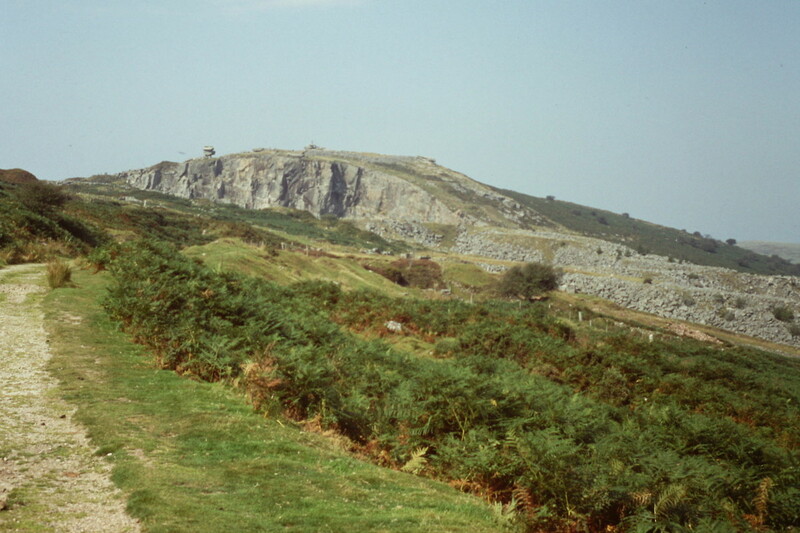 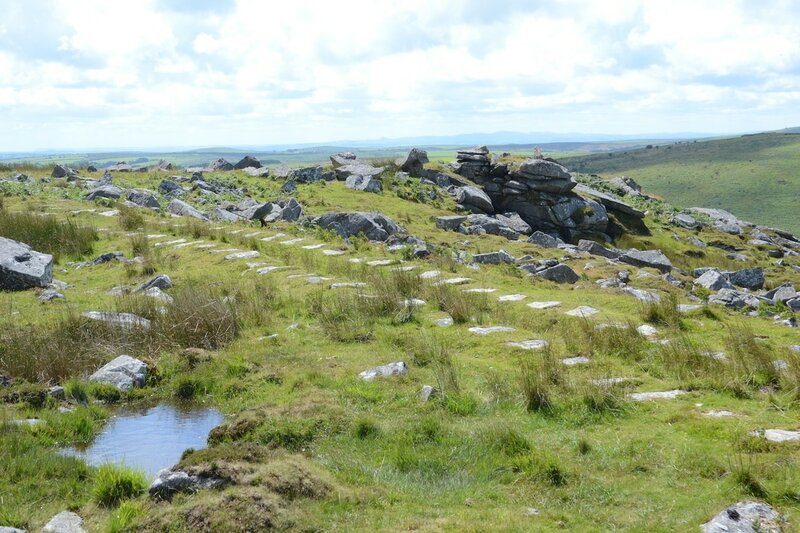 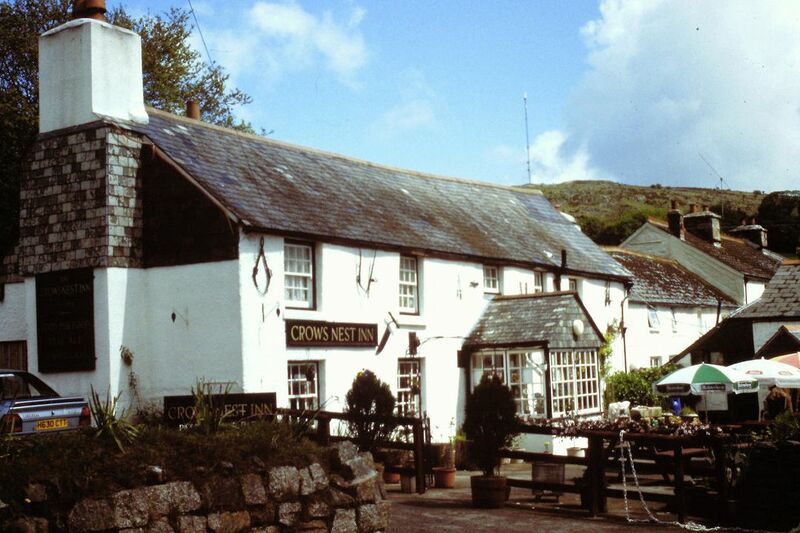 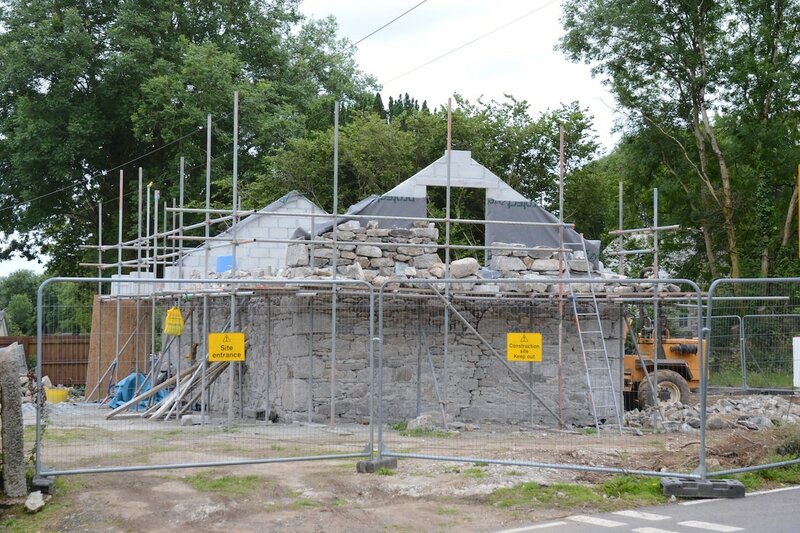 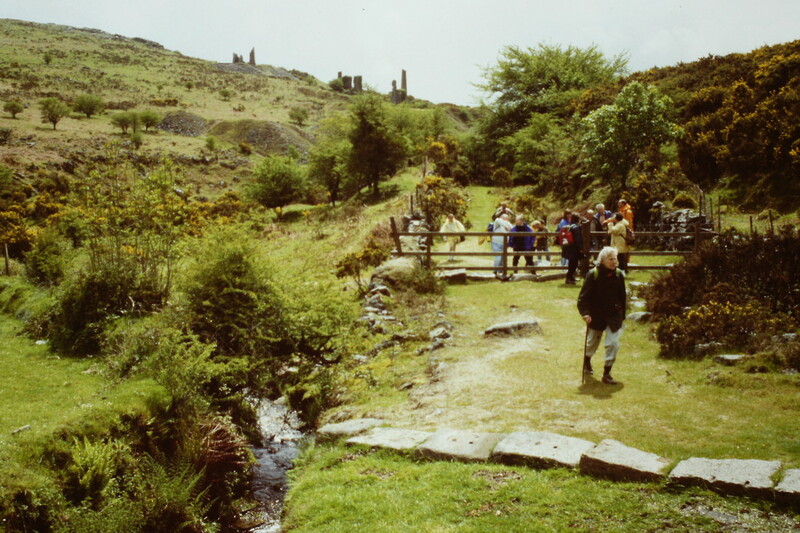 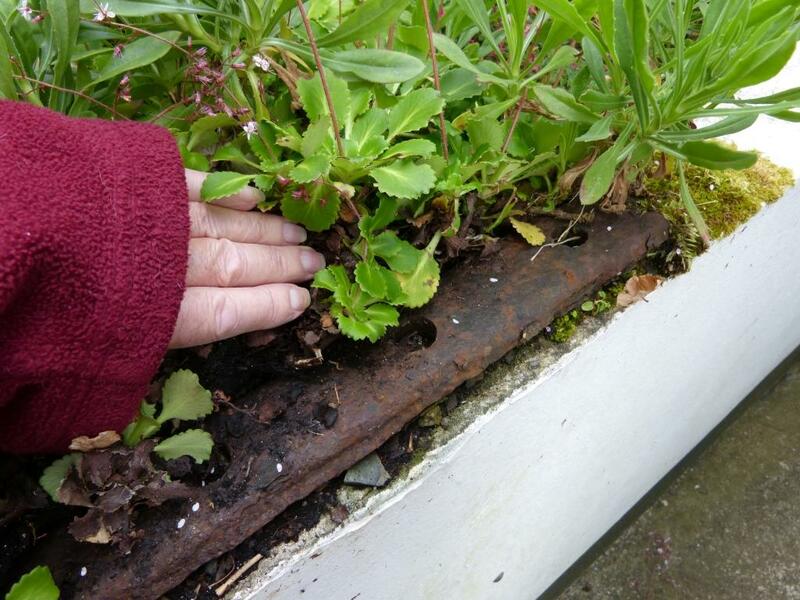 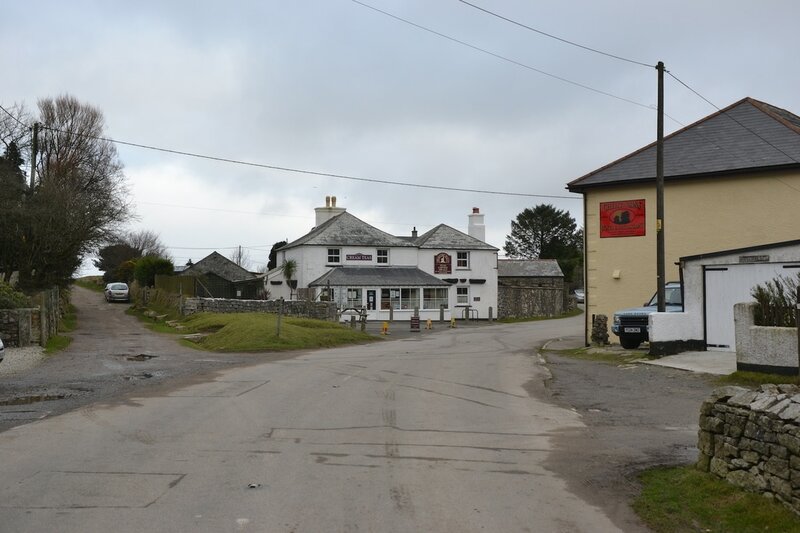 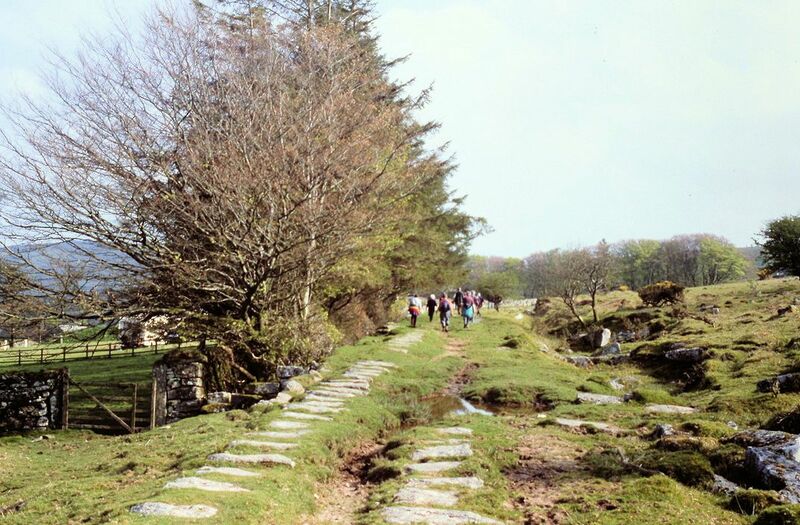 All proceeds will go to the continuing work of the Caradon Heritage Project.